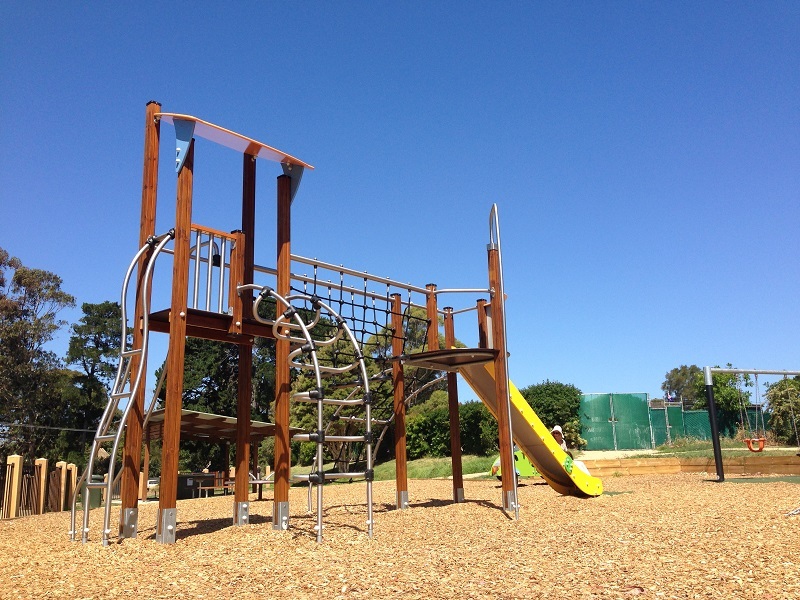 This playground was completed in 2014 during stage 4 of the Bonner Estate Development. 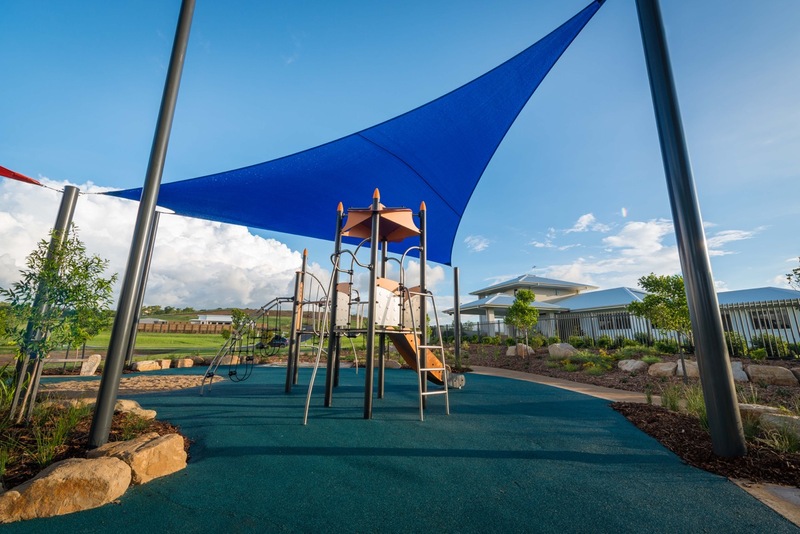 Location: Alyangula, Groote Eylandt, NT. 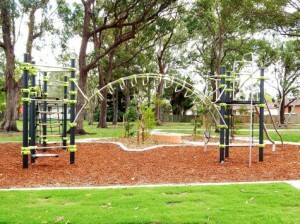 Location: Anderson Park, Ryde NSW 2112. 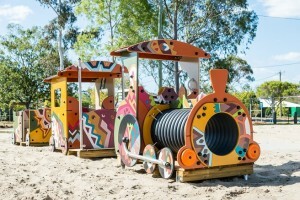 The Proludic “Tug Boat” is the feature item in the Anderson Park playground, located on the banks of the Parramatta River in Ryde. 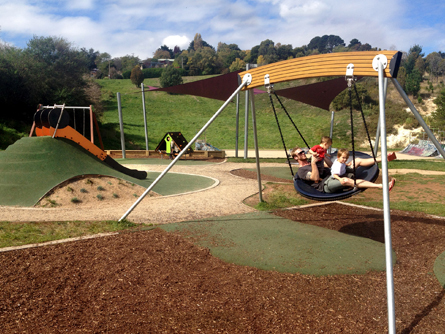 There are pleasant views of the river and the Ryde Bridge from the playground. 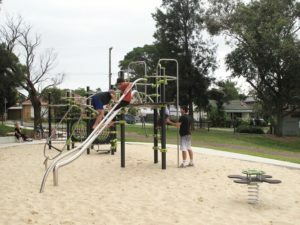 Anderson Park is one of a network of parks located along the Ryde Riverwalk. 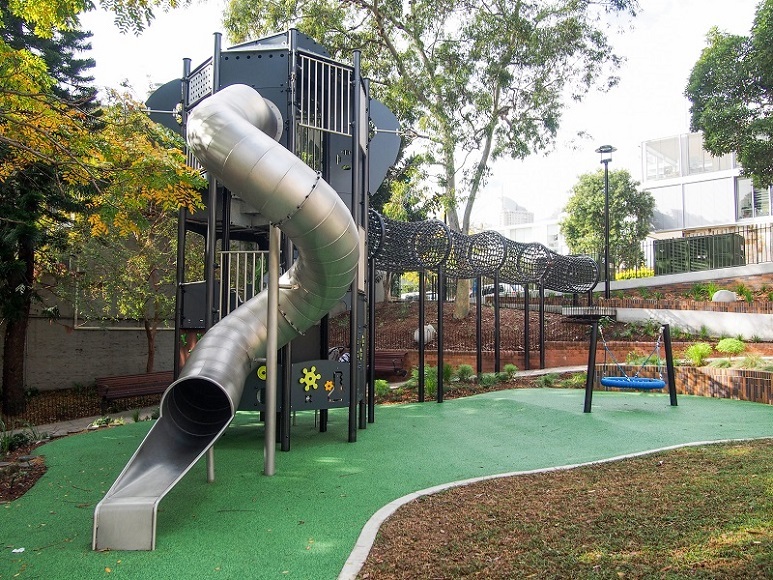 Ryde Riverwalk is an 8km long landscaped pathway created along the Parramatta River, that links parks, trails, heritage sites and transport hubs. 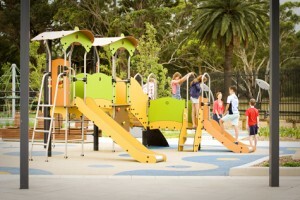 The playground was designed by the City of Ryde. 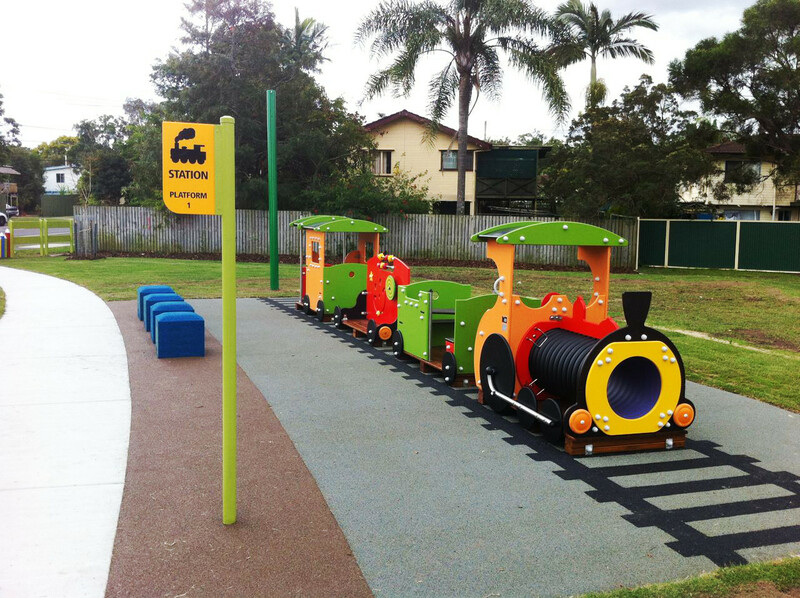 Location: Downey Crescent, Annandale, QLD. 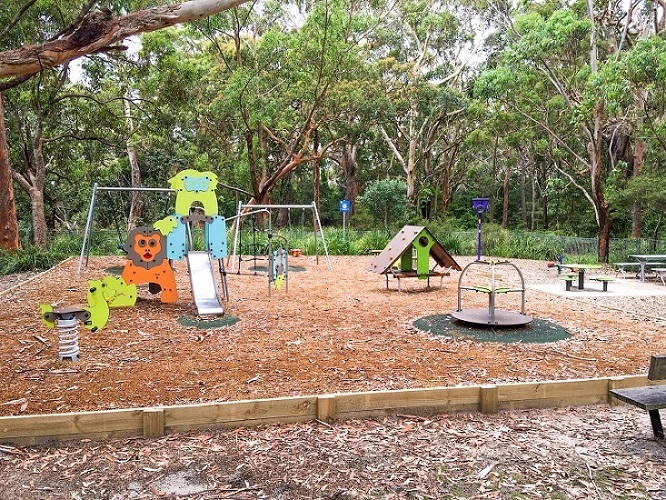 Site: Archer Drive, Kurunjang, Victoria. 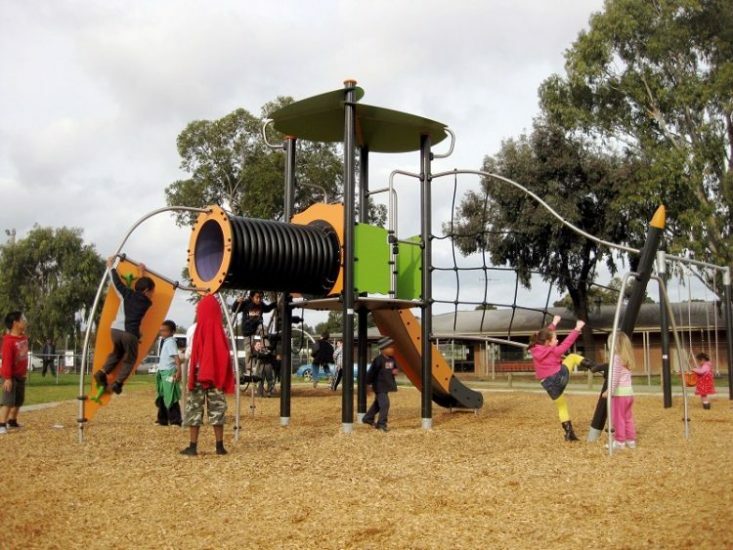 Melton City Council wanted to build a new playground in the park on Archer Drive. 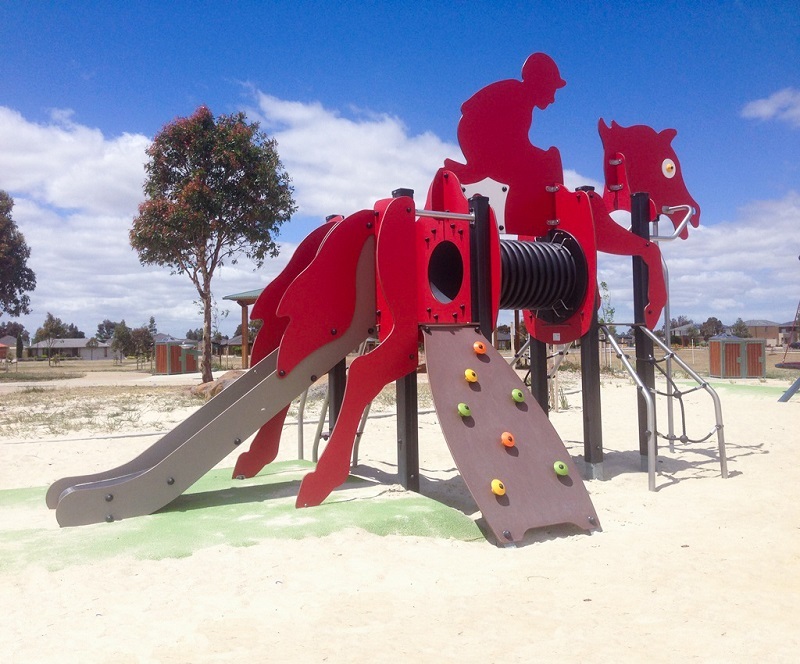 The streets around this reserve are named after famous race horses so they wanted a horse racing themed playground. We were able to satisfy the brief with Proludic’s Z13-0019 Horse and Jockey themed multi play item for young children. 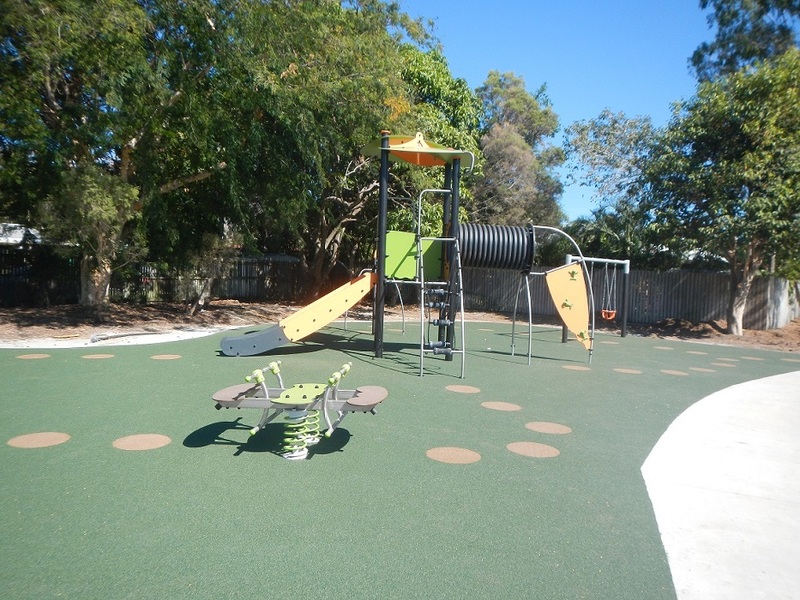 Address: Cnr Oxley & Cunningham St, Tweed Heads South. 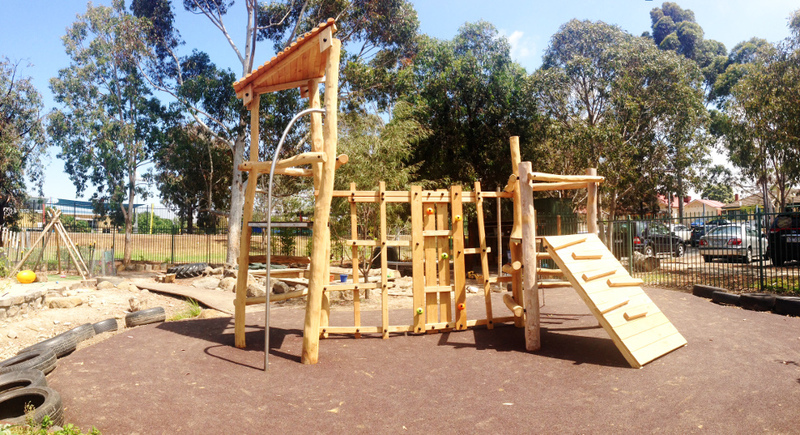 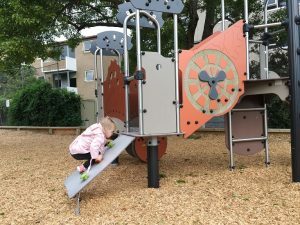 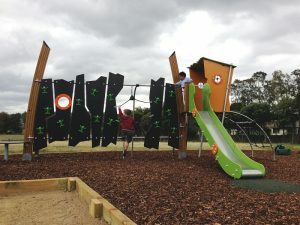 Proludic supplied and installed an adventure-themed playground at Atkinson Way providing children with a variety of activities to stimulate motor functions as well as imagination and communication. 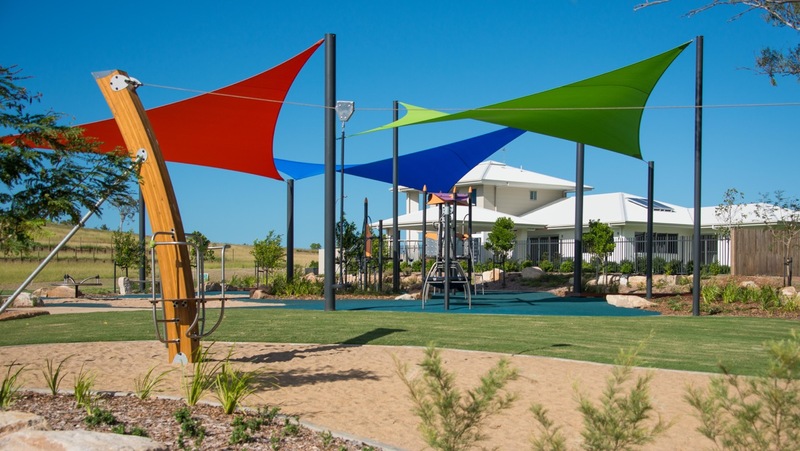 Location: Baldivis Quarter, 13 Dunrod Rise, Baldivis, Western Australia. 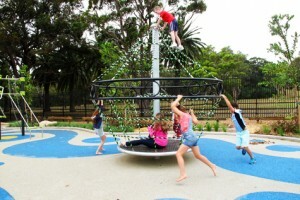 Location: Bateau Bay Playground, Cnr Bateau Bay Road and Rushby Street, Bateau Bay NSW. 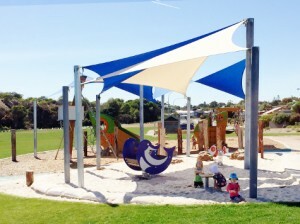 Client: Central Coast Council (formerly Wyong Shire Council). 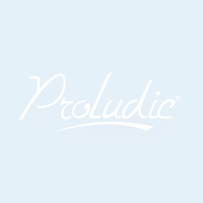 “Really happy with progress and the handling of the contracts, has been a pleasure working with you and Proludic. 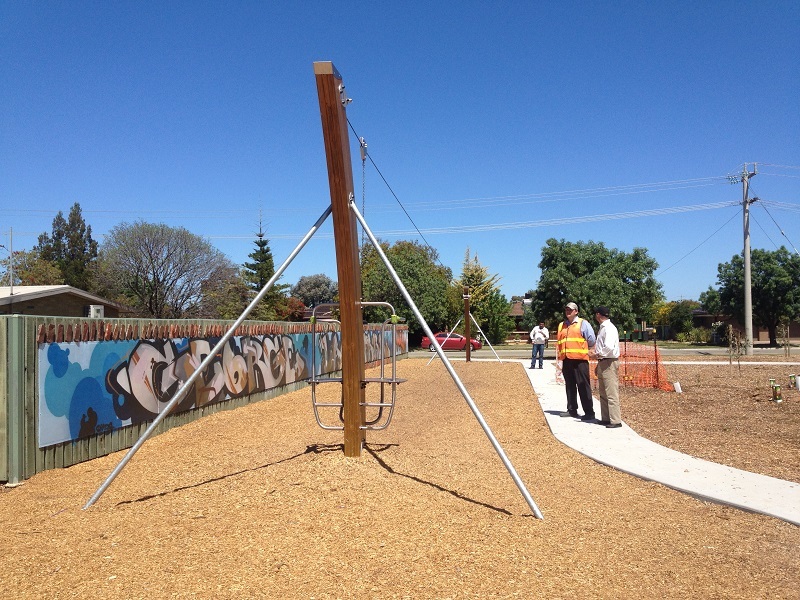 Your efforts to get the project over the line in the short time frame provided have been exceptional and appreciated. 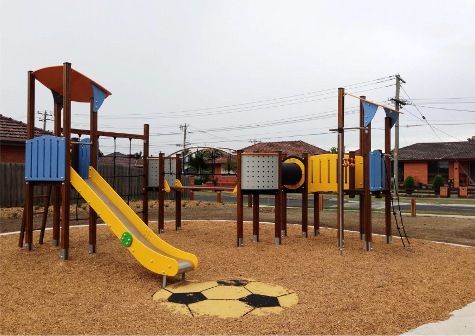 A great outcome for the community.” Testimonial by Justin Kelaher, Section Manager – Community Infrastructure at Wyong Shire Council, NSW. 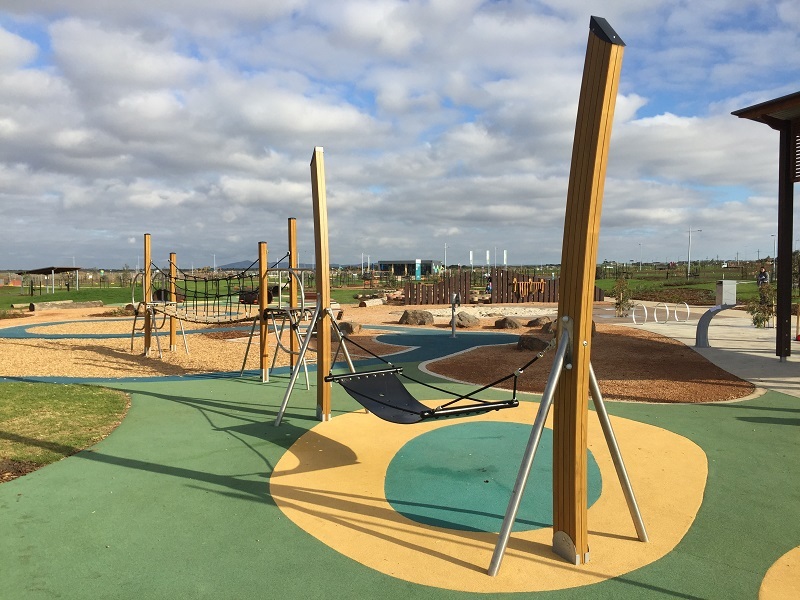 “We put the pressure on and you have come through, working with local government is always a challenge, thanks for rising to it! 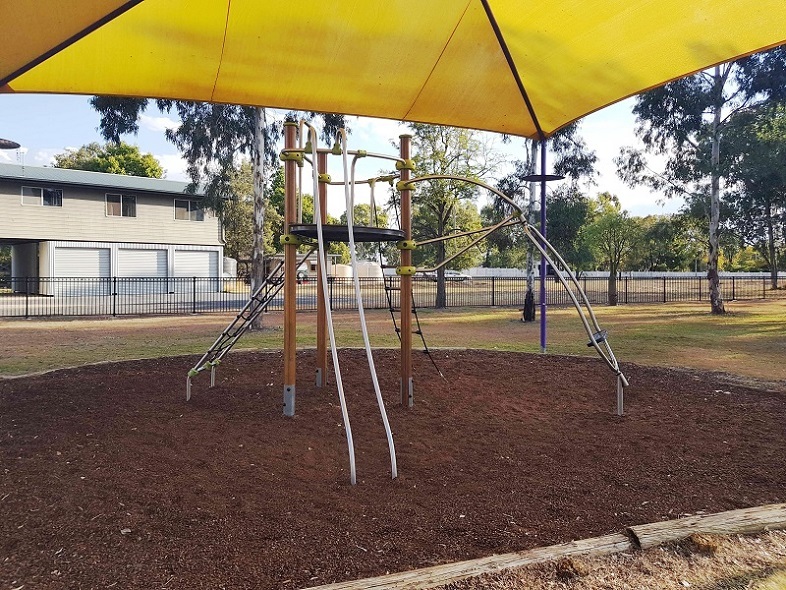 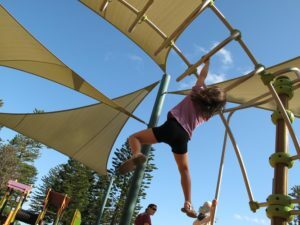 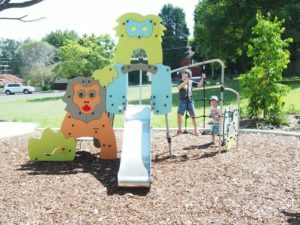 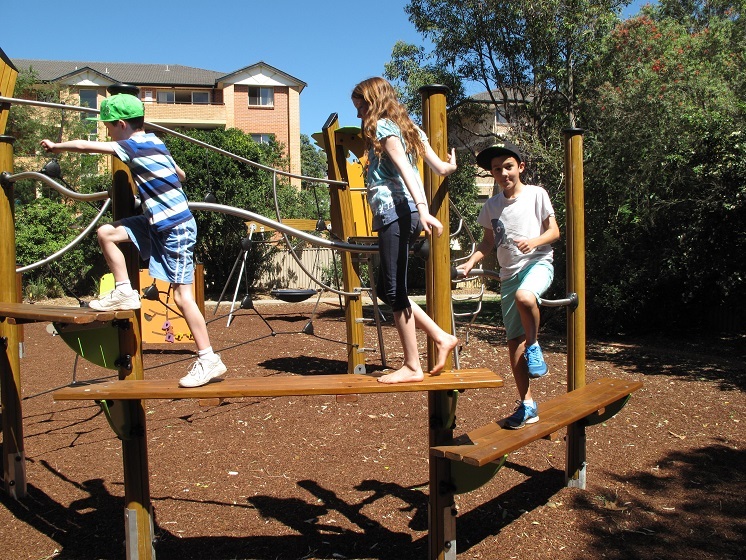 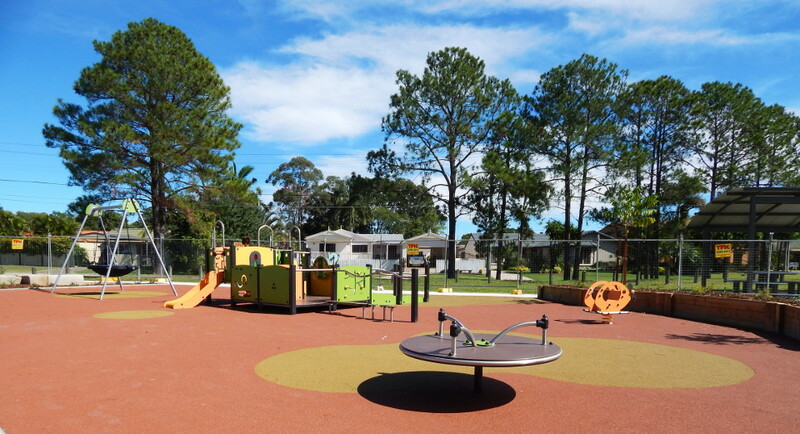 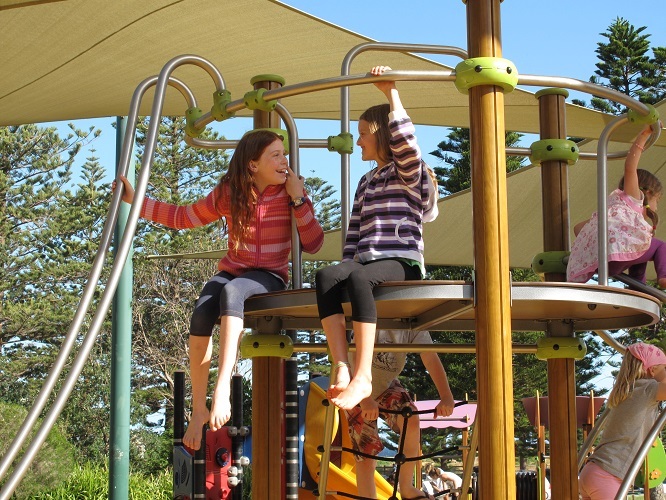 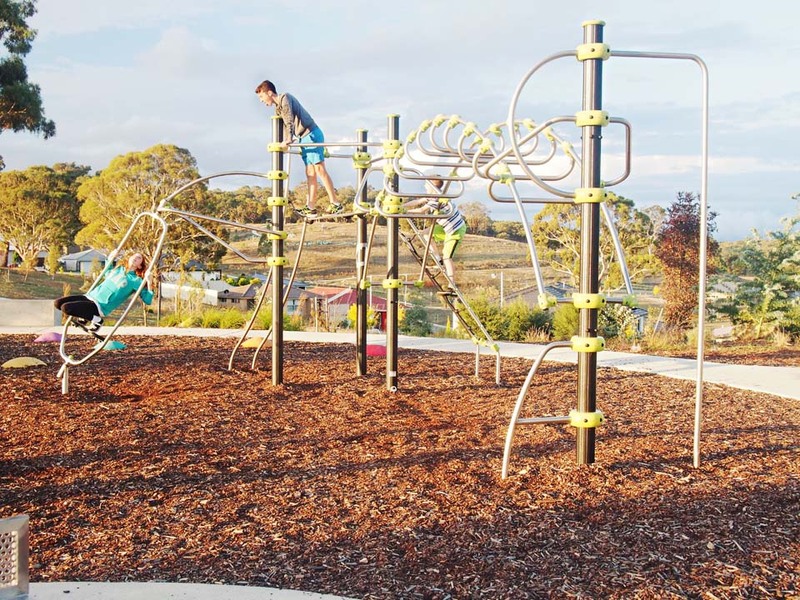 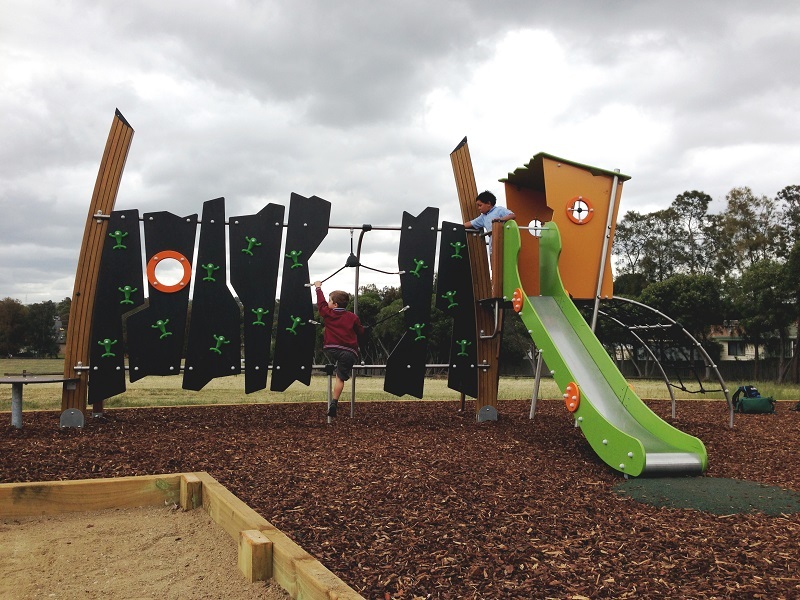 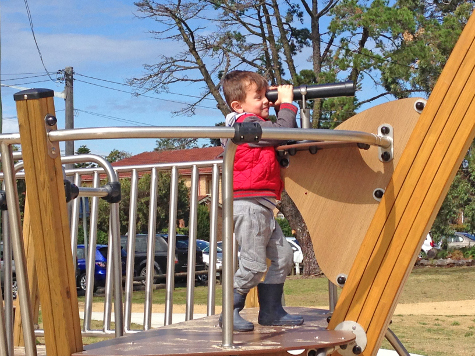 My boys can’t wait to get into the Bateau Bay playground and try it out.” Testimonial by Irene Reid, Project Officer – Customer and Community Relations at Wyong Shire Council, NSW. 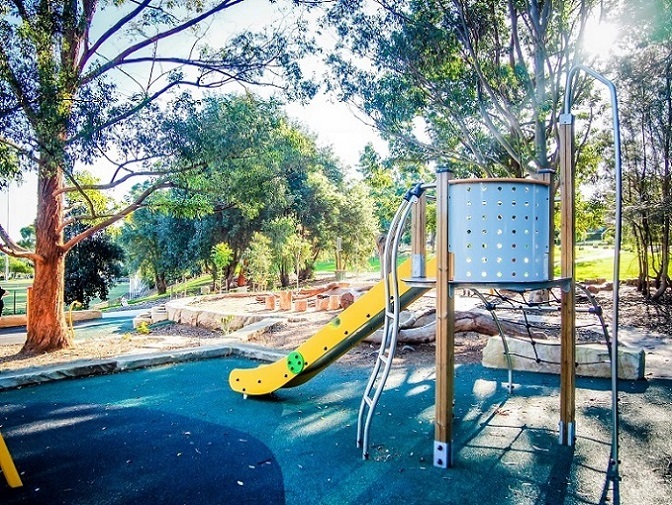 Location: Ben Alexander Reserve, City of Yarra, Victoria. 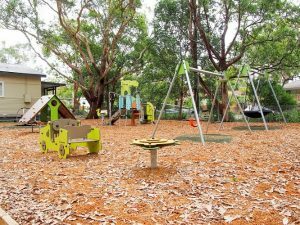 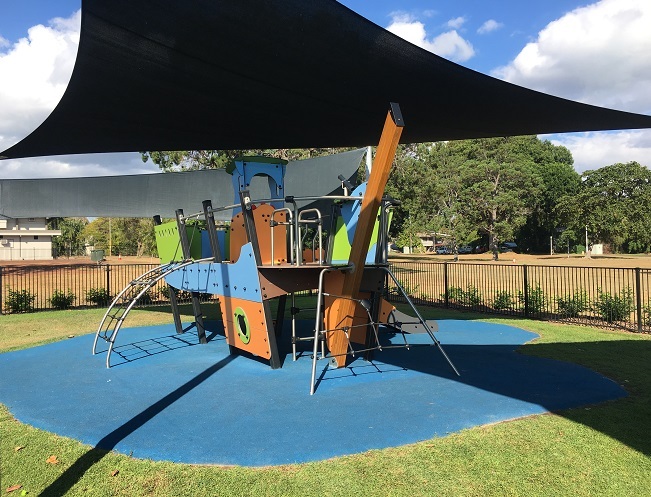 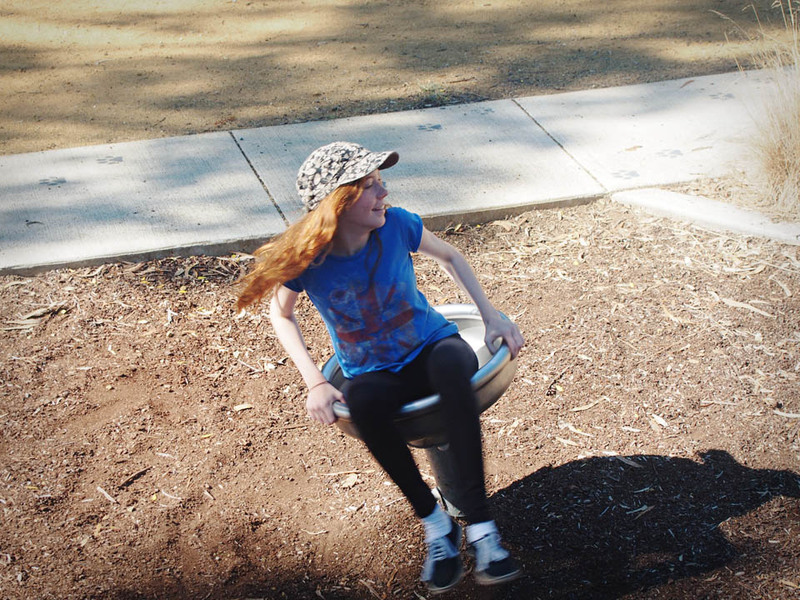 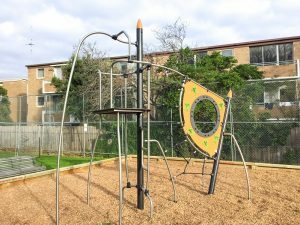 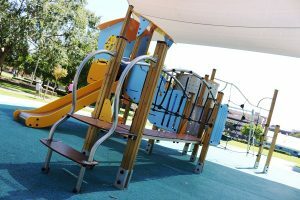 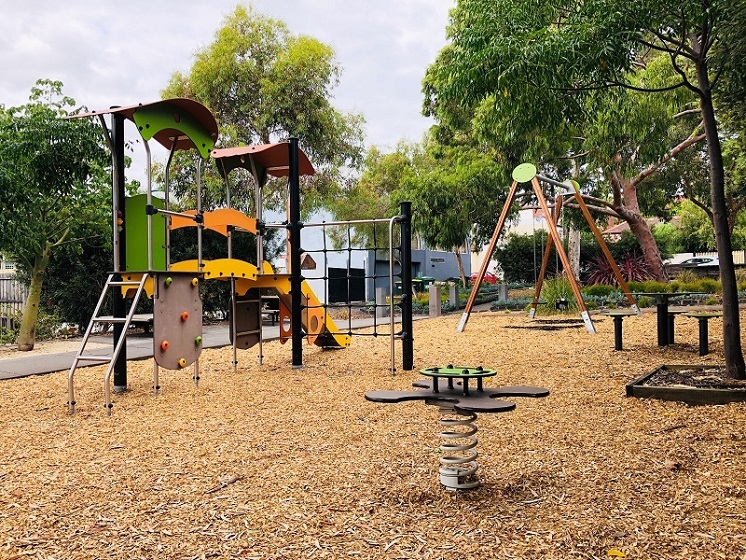 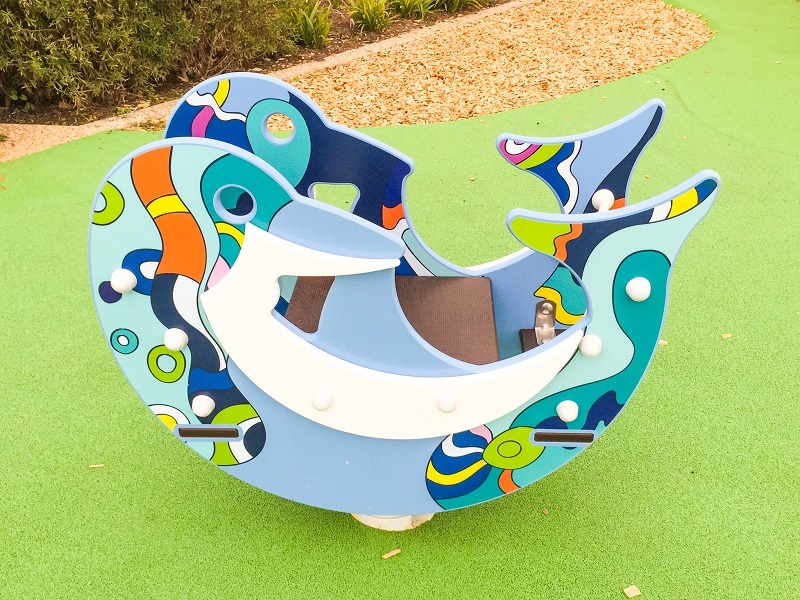 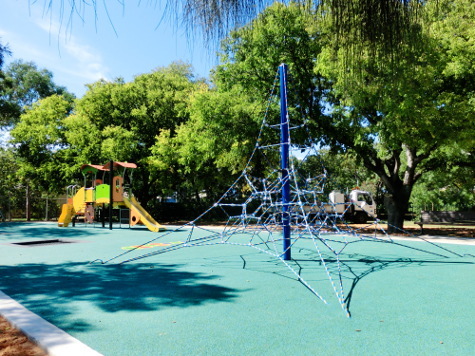 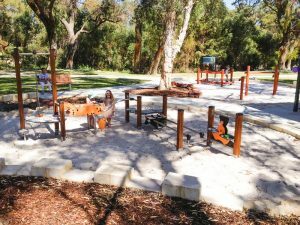 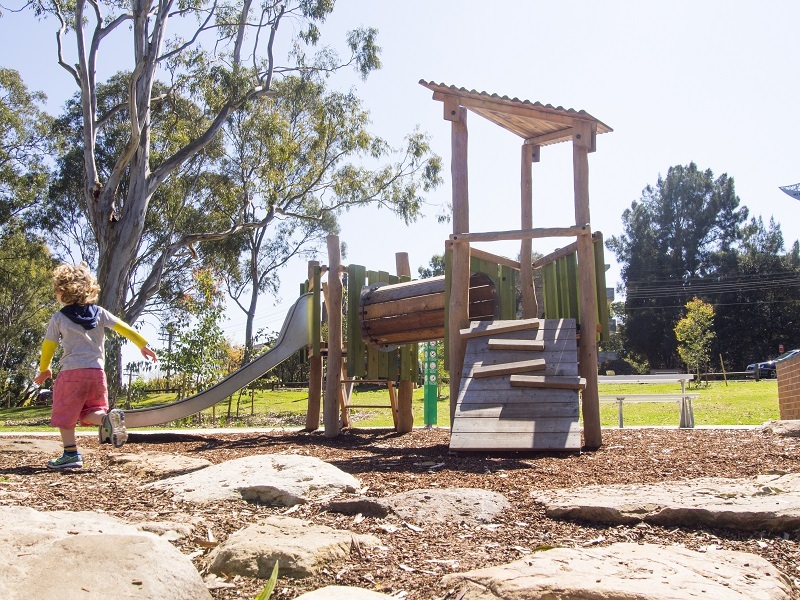 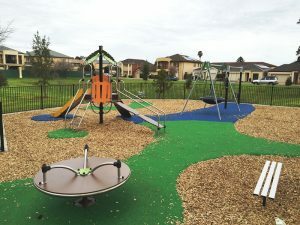 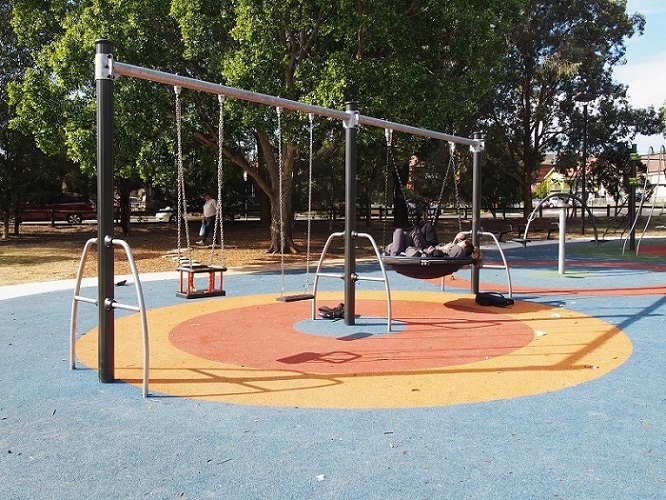 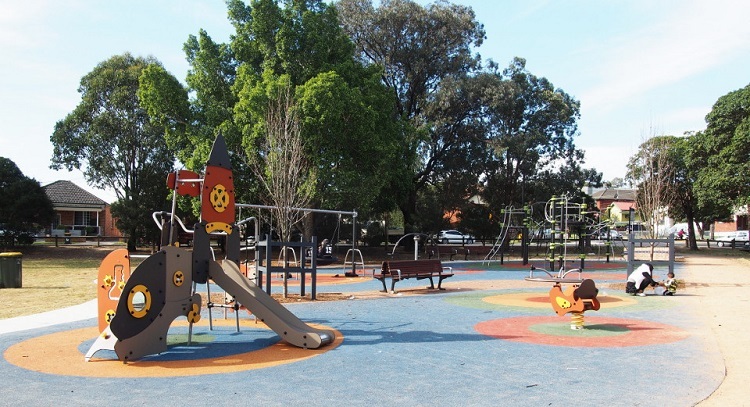 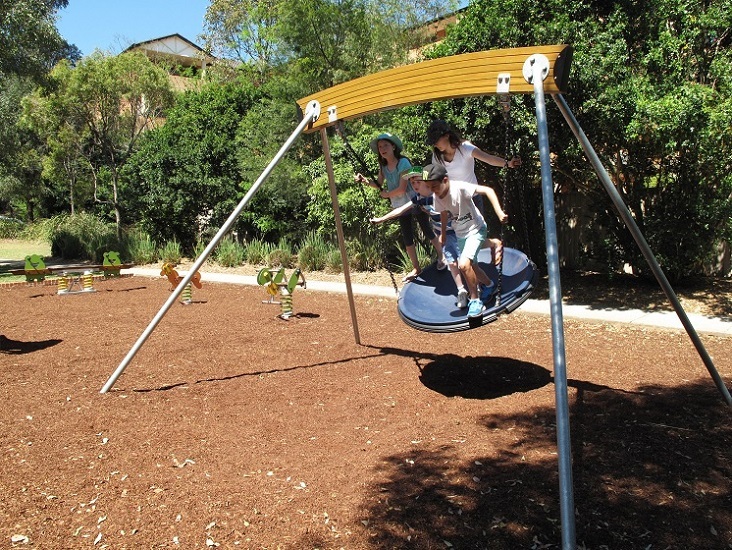 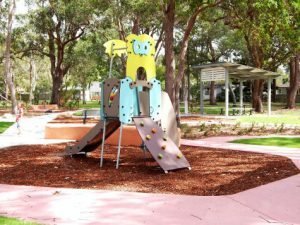 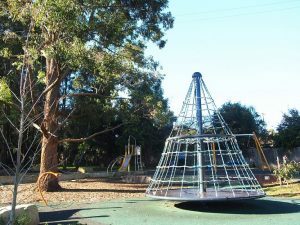 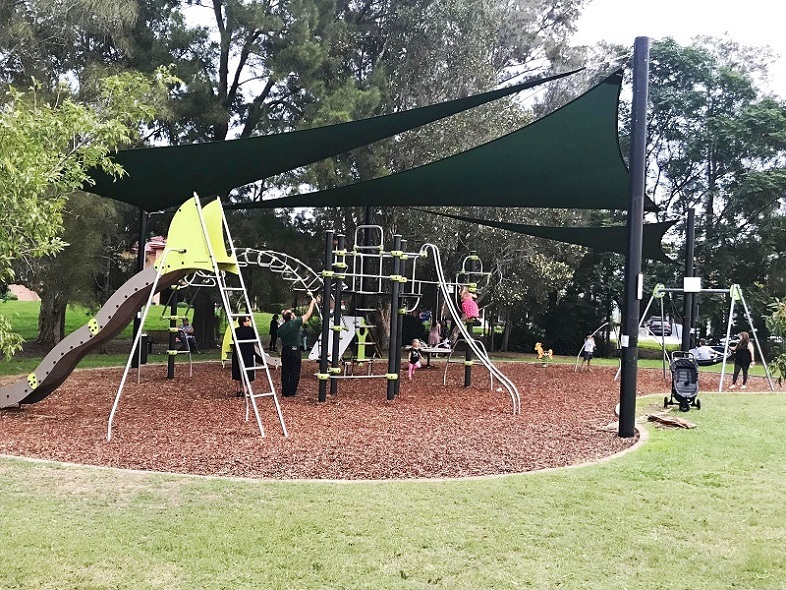 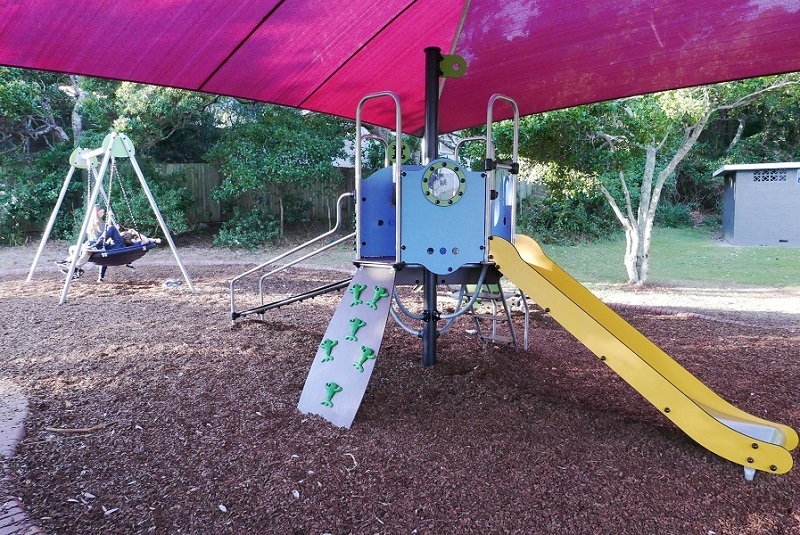 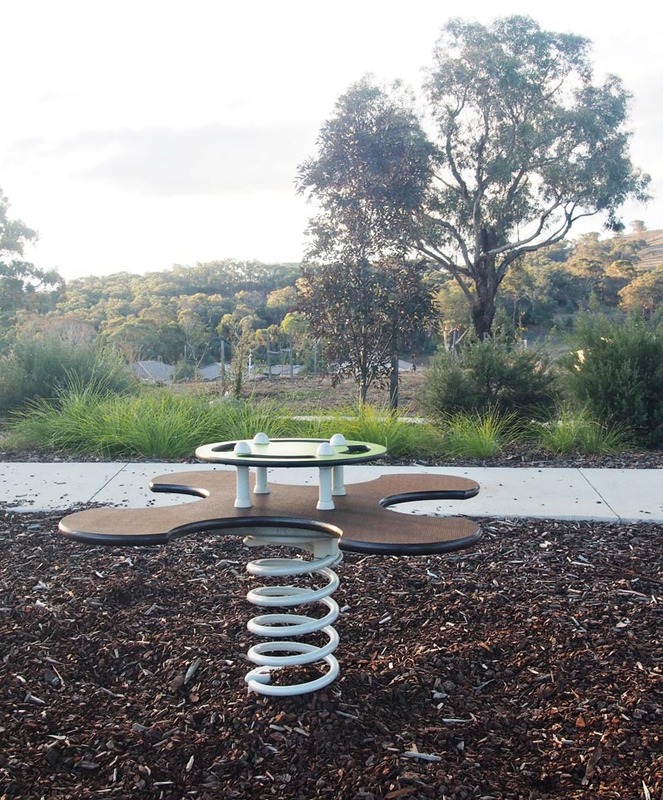 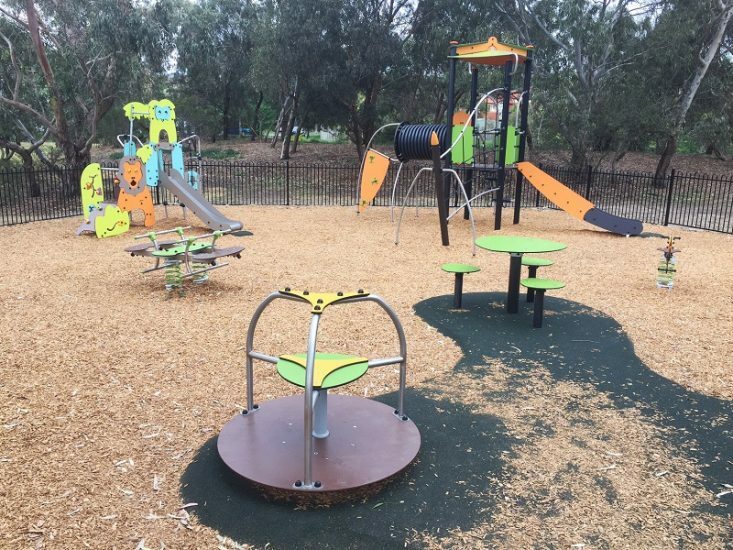 Ben Alexander Reserve is a nice little park featuring a Proludic Diabolo Multi-Play, an all-in-one multi-play solution that is a centre piece for a small play area catering for children aged 2 to 10 years. 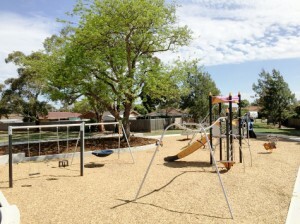 The playground also includes the Falling Star Springer, a Swing set and a Picnic Table. 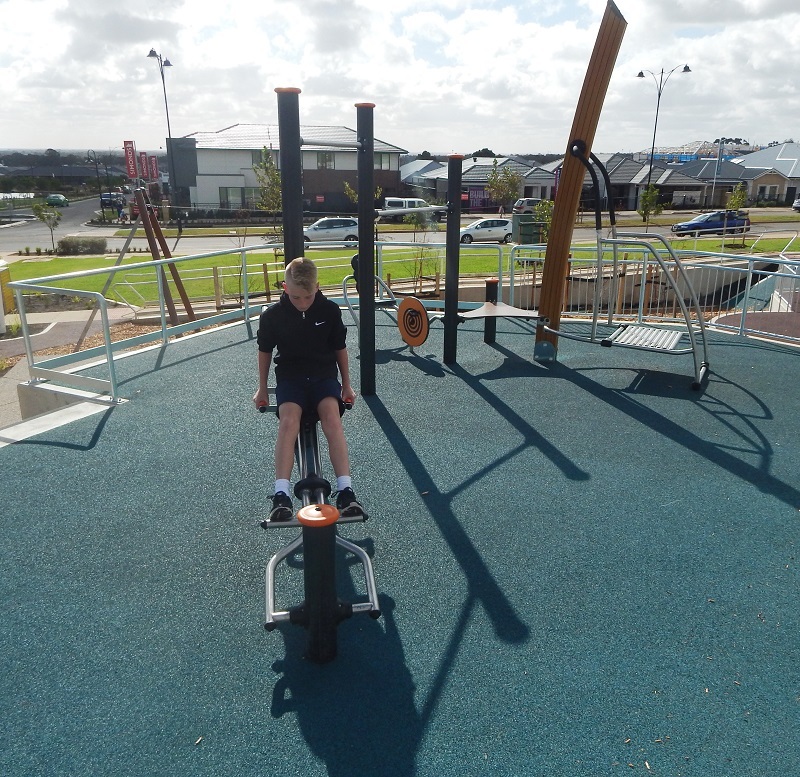 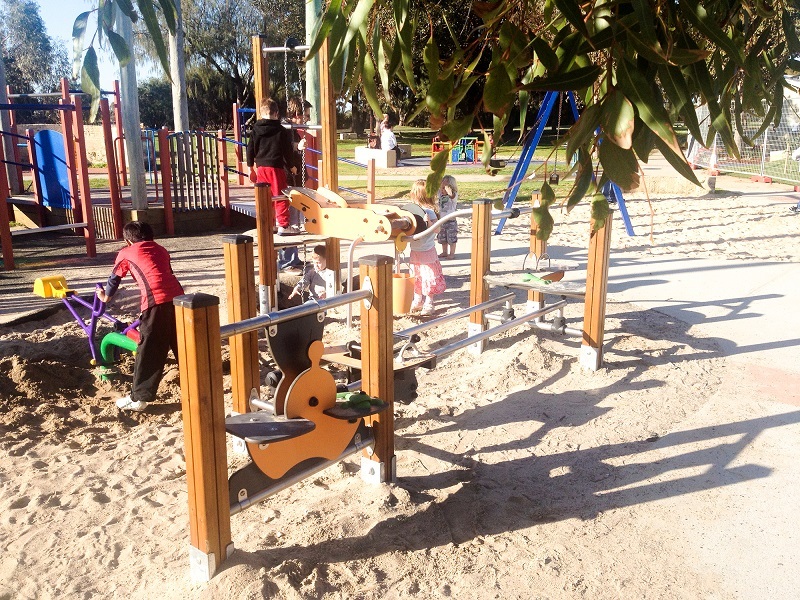 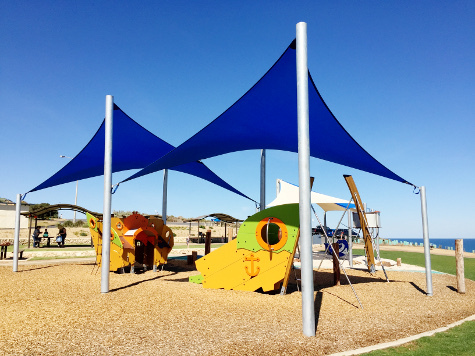 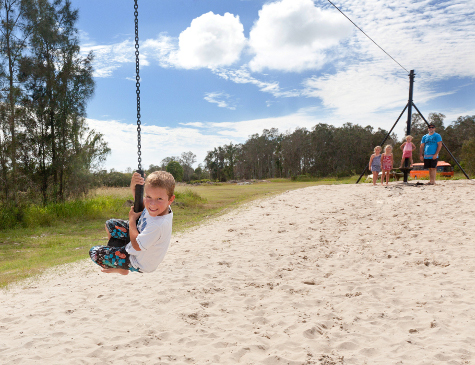 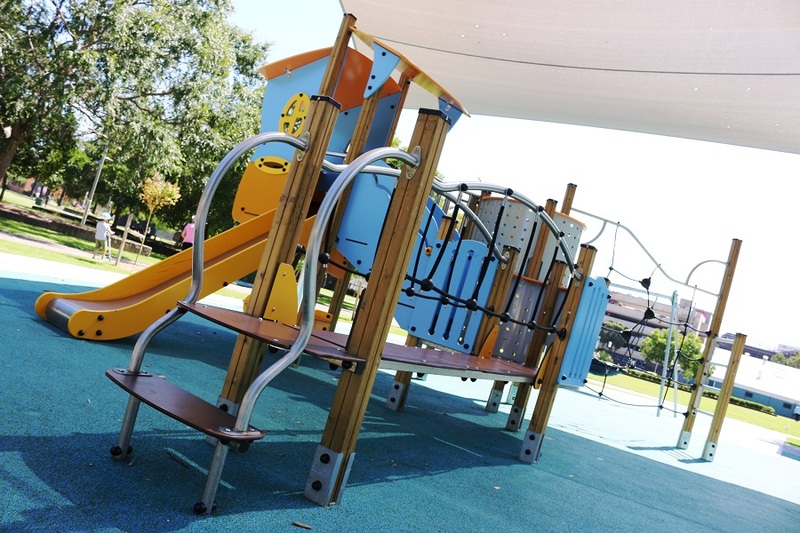 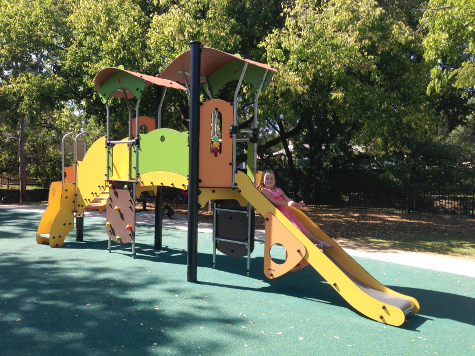 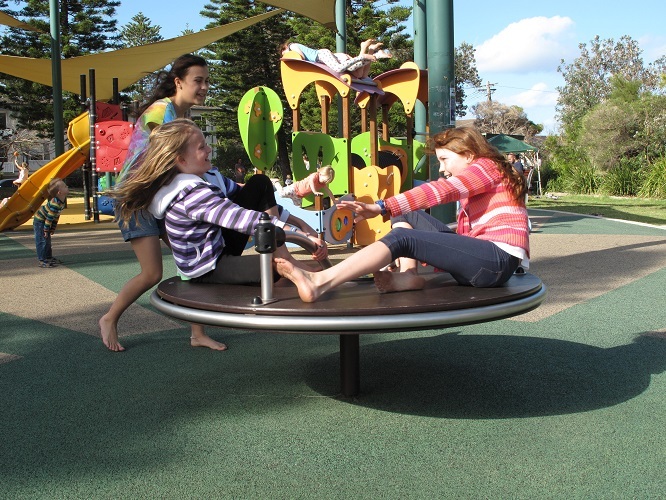 The play equipment complements the beautiful surrounding natural setting of Ben Alexander Reserve. 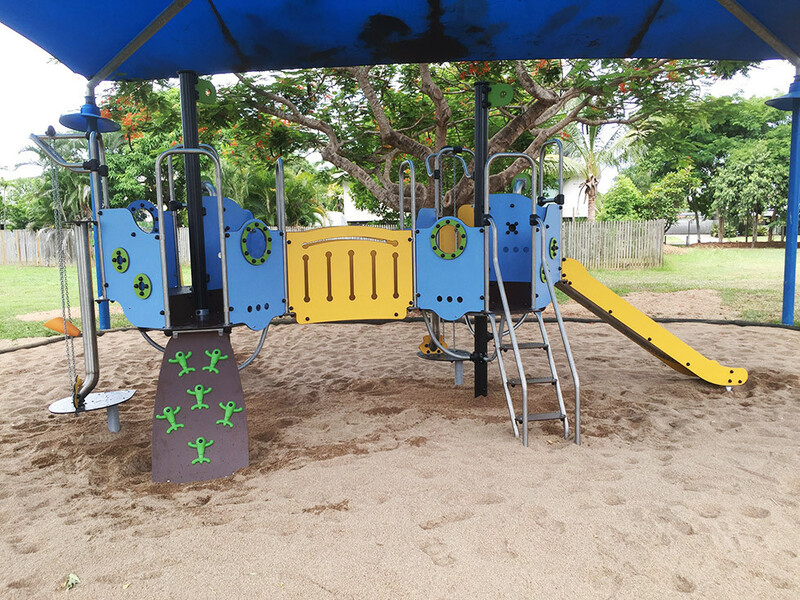 Location: 286 O’keefes Lane, Palmers Island NSW. 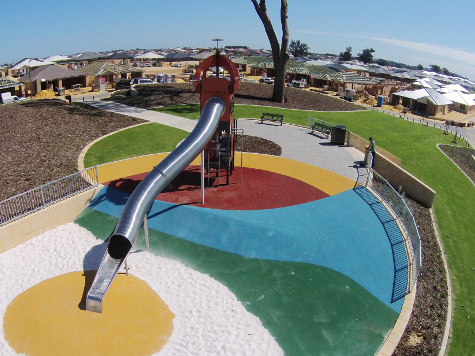 Client: BIG4 Saltwater Holiday Park. 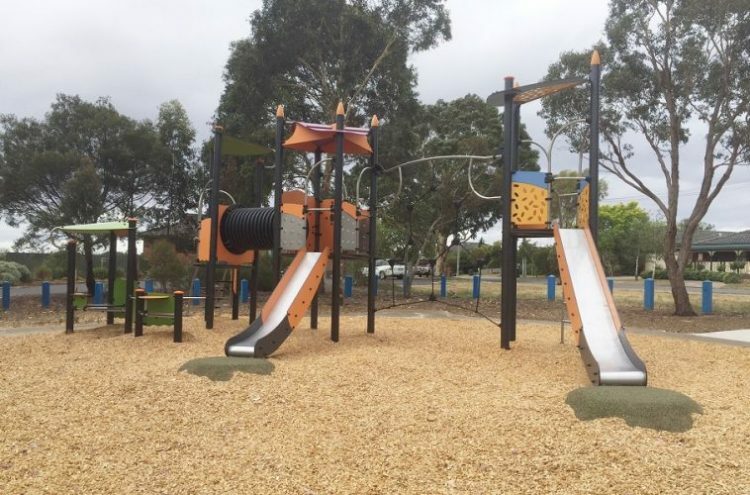 Location: Birriwa Reserve, Cnr Waterworth and Welling Drives, Mount Annan. 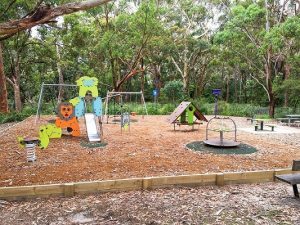 Birriwa Reserve has been awarded ‘Highly Commended’ in the 2017 NSW Regional Awards of Excellence by Parks & Leisure Australia ! 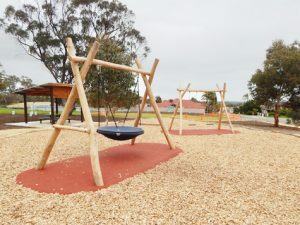 Location: Blakes Crossing, Blakeview, South Australia. 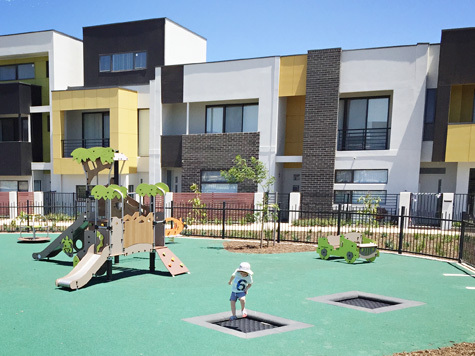 Clients: Outside Ideas, Aspect Studios, Lendlease. 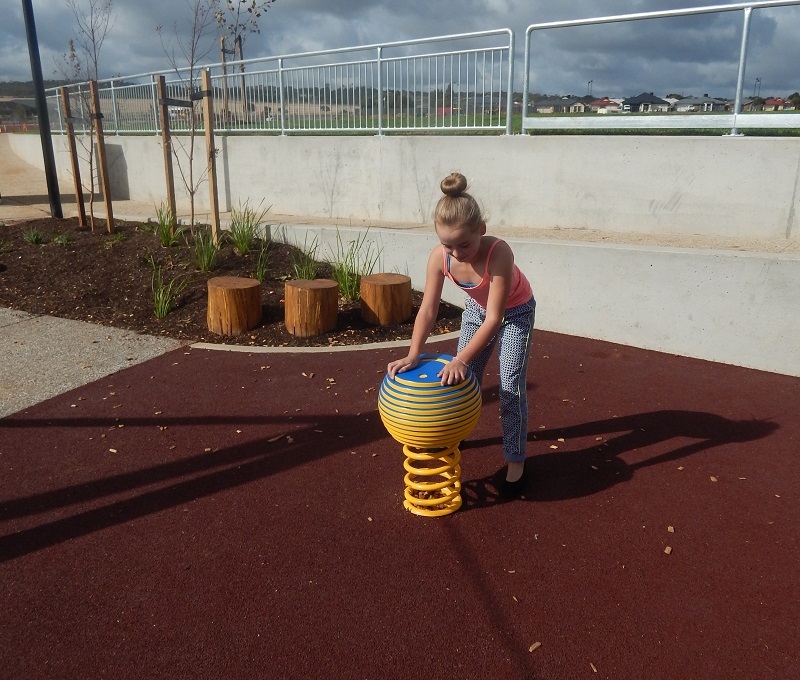 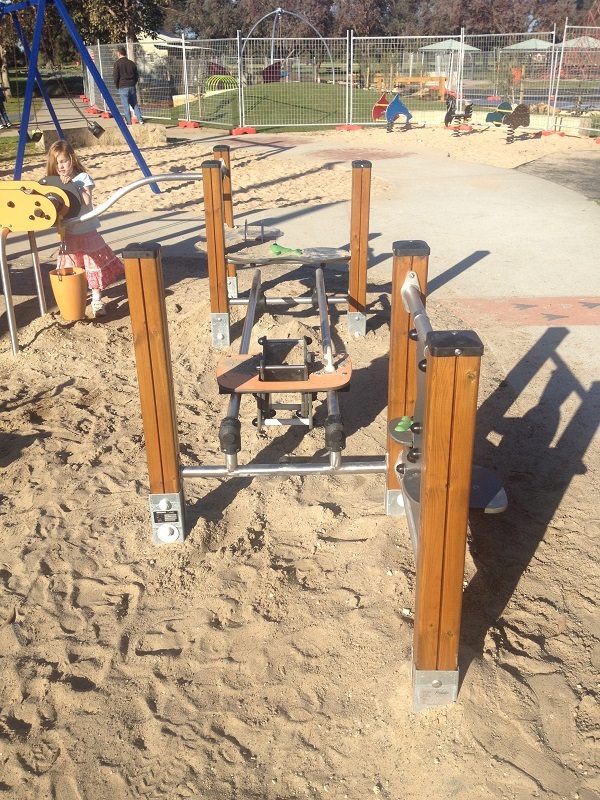 Proludic recently installed inclusive play equipment in the Lendlease development Blake’s Crossing. 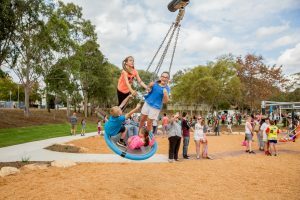 The new Adventure Playground & Neighbourhood Oval spans over 1.4 hectares and features a variety of play equipment including inclusive play items such as a Wheelspin, Tri-Pod Swing and sensory Orbs. Proludic Outdoor Fitness equipment is also included. 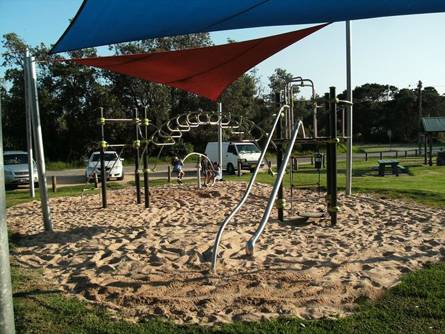 Location: Boronia Street, Sawtell, NSW 2452. 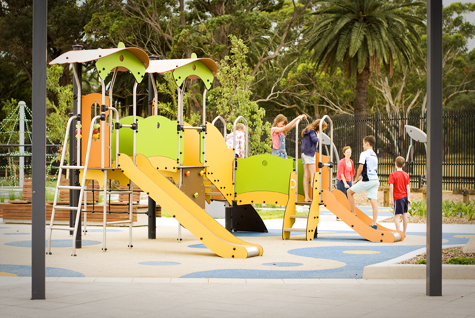 Client: Coffs Harbour City Council. 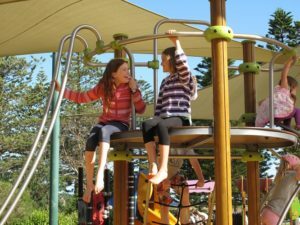 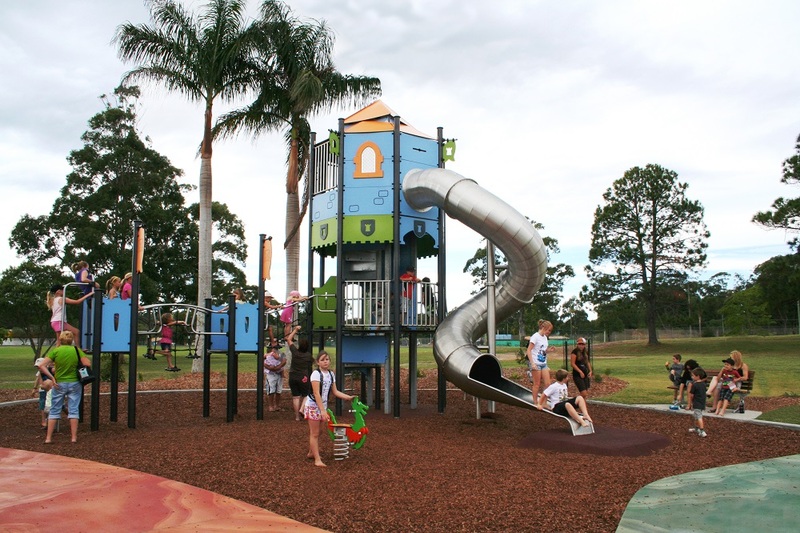 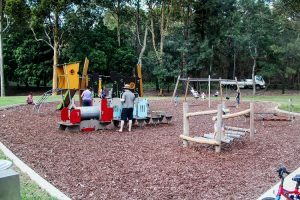 Coffs Harbour City Council wanted to create a fantastic regional play facility, the Brelsford Park Adventure Playground. 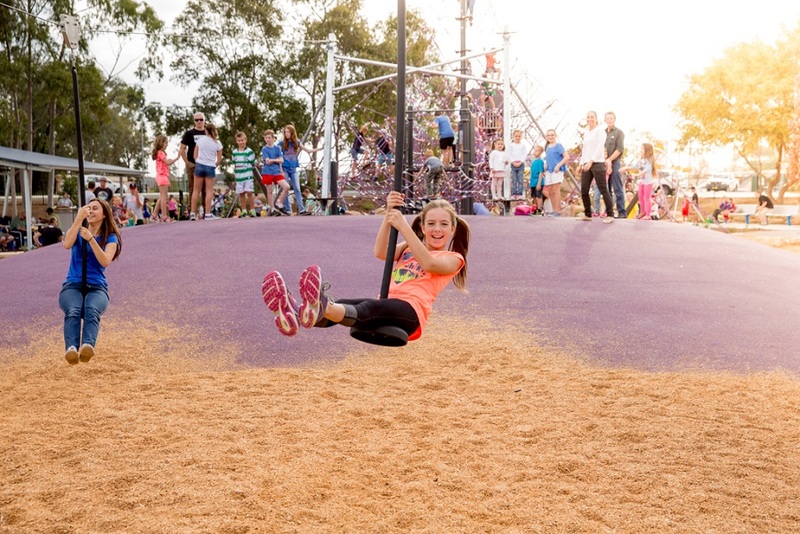 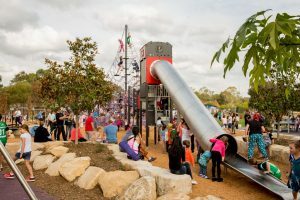 The playground which was highly commended in the 2010 Kidsafe National Playspace Awards is Stage 1A of the Brelsford Park Masterplan which aims to create a vibrant parkland, sport and cultural precinct in the heart of the city. The landmark Proludic’s Giant “Knight’s Tower” is the main attraction in the playground and can be seen from the surrounding streets! The tower is a multi-storey castle with a stainless steel tube slide, rope bridges and sliding poles. 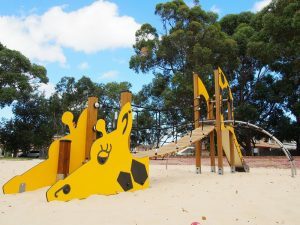 Location: Calleya Estate, Banjup, Western Australia. 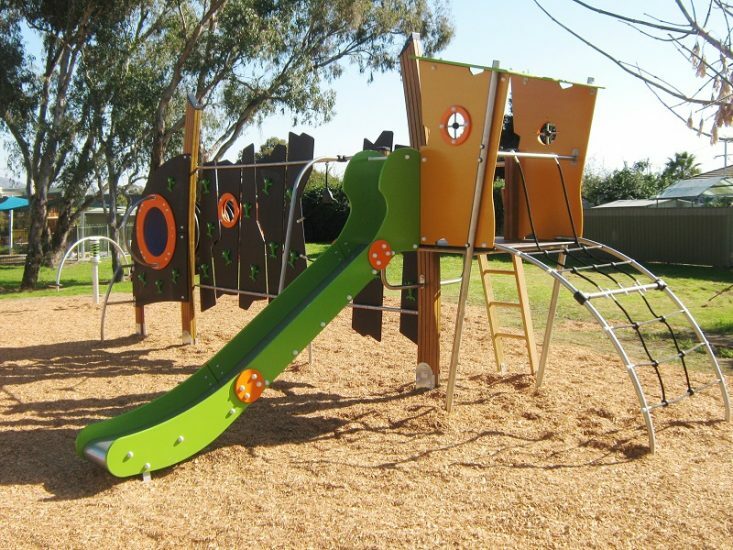 This playground contains the Proludic J2220 Basic Goal with custom colours. 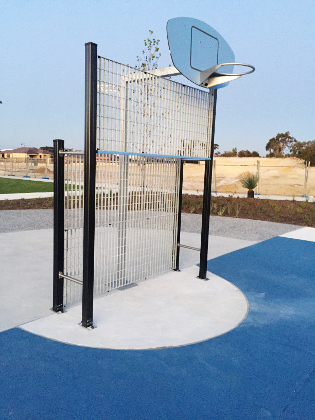 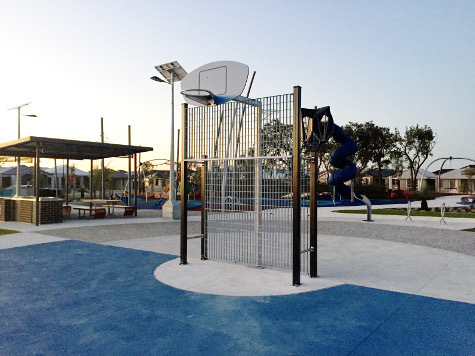 A blue backboard and coloured metal strip was selected to complement the overall design of the play area. Location: Canal Park, Potts Lane / Purvis Avenue, Potts Hill. 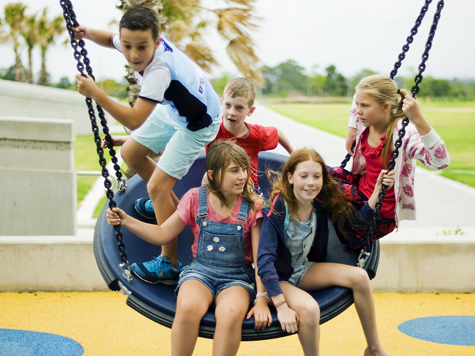 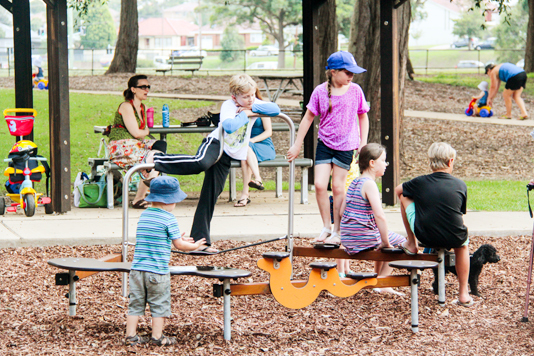 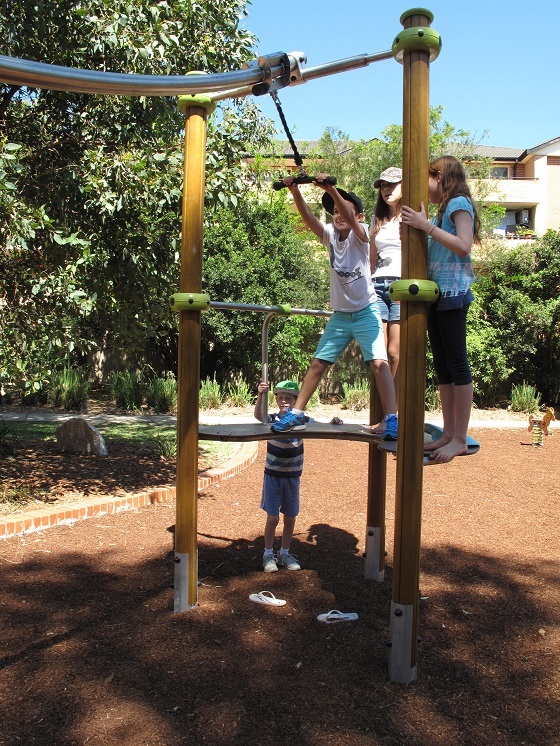 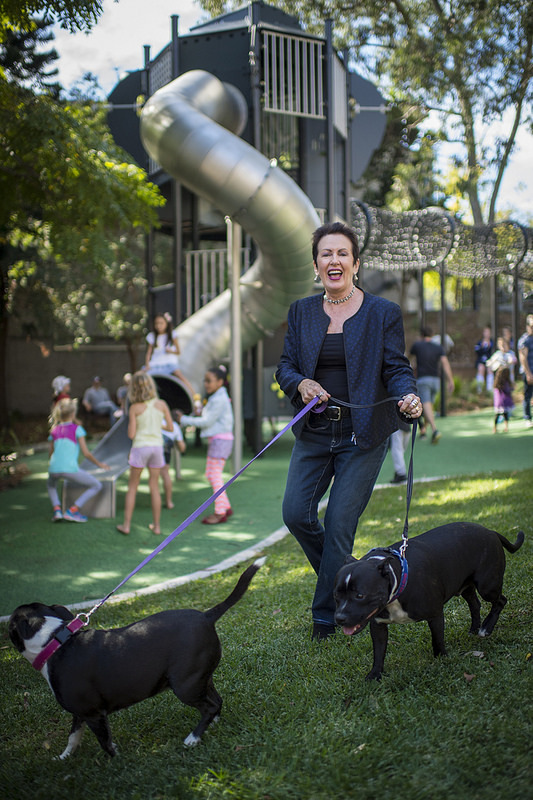 Canal Park is a multi-generational playground in Potts Hill. 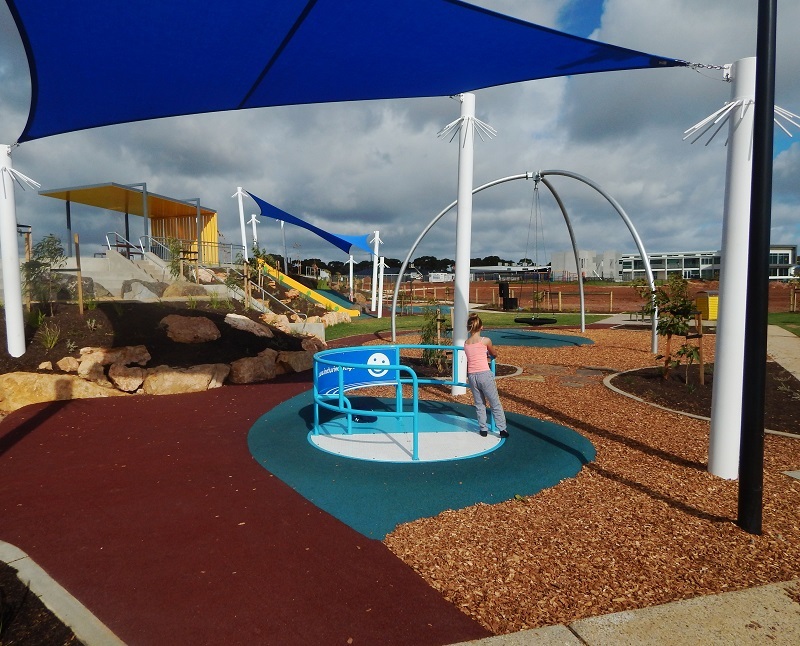 It is located on former Sydney Water lands, and a water theme is reflected in the design of the wetpour rubber surfacing. 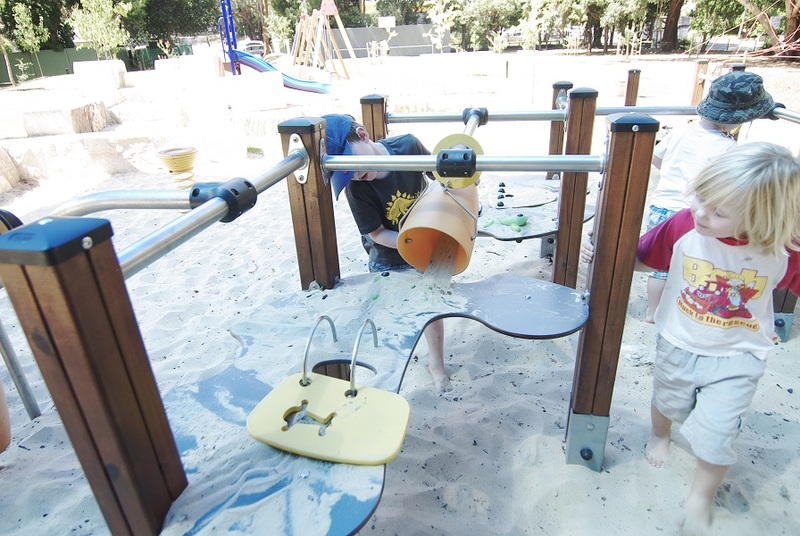 Inclusive play items for children with special needs feature in the playground. 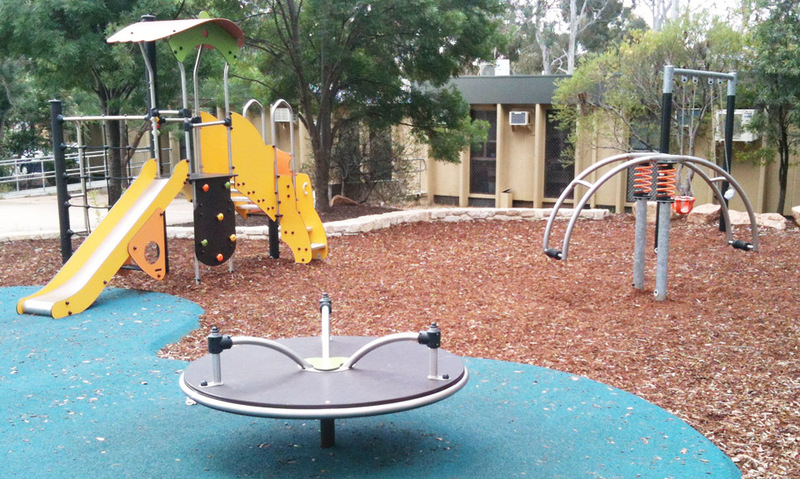 Address: Charlton Terrace, Woodcroft South Australia 5162. 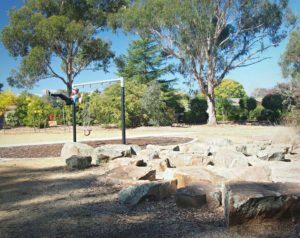 Location: Cheltondale Park, Madeley WA 6065. 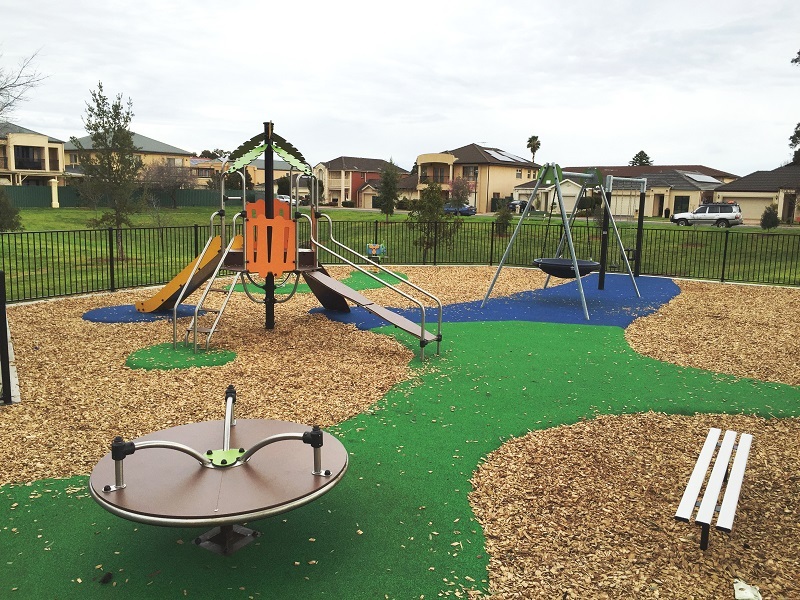 Click here to view the Cheltondale Park case study. 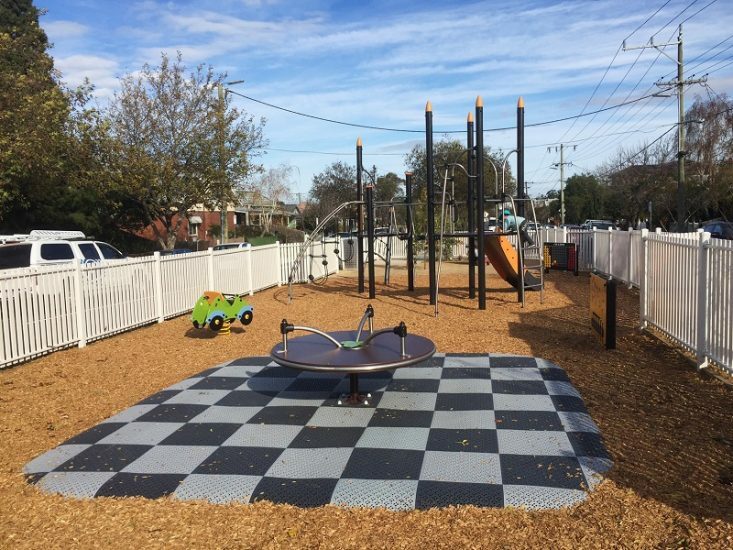 Address: 55 Clifton St, Northcote Victoria. Address: College Grove Reserve, 50-56 Lipsett Terrace, Brooklyn Park South Australia. 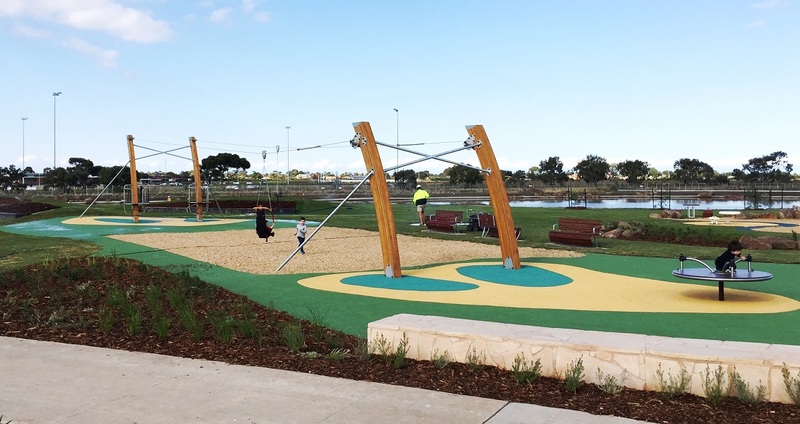 Client: City of West Torrens. 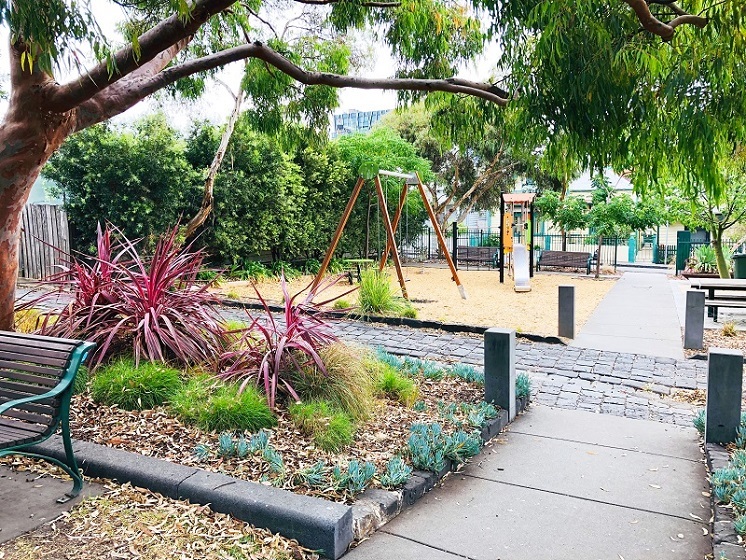 Location: Cnr Bulli Road and Hollis Street Constitution Hill, NSW. 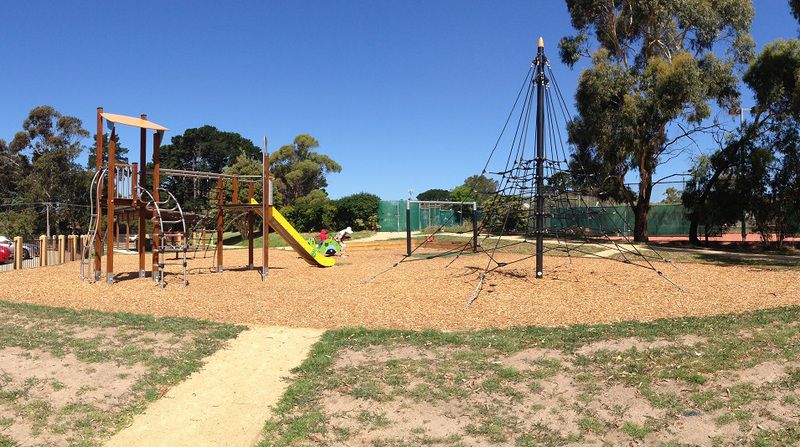 Address: Sheoak Avenue, Nova Gardens SA 5040. 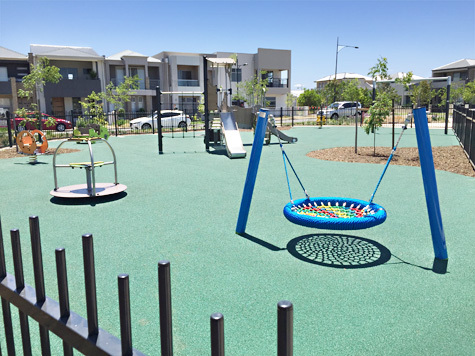 Address: Dampier Town Centre, High Street, Dampier, Western Australia. 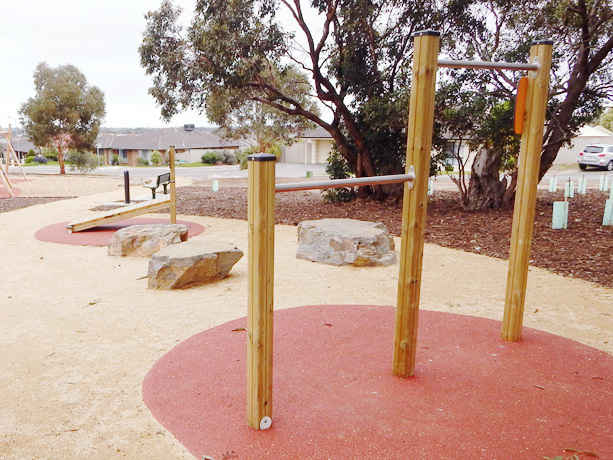 Daylesford Community Park is a great example of incorporating landscaping in the playground. 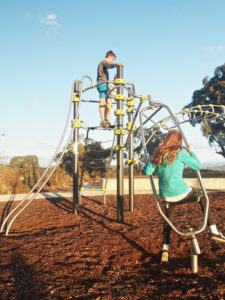 The park layout was considered in the playground design process with the aim to integrate the play equipment into the natural surrounding environment. 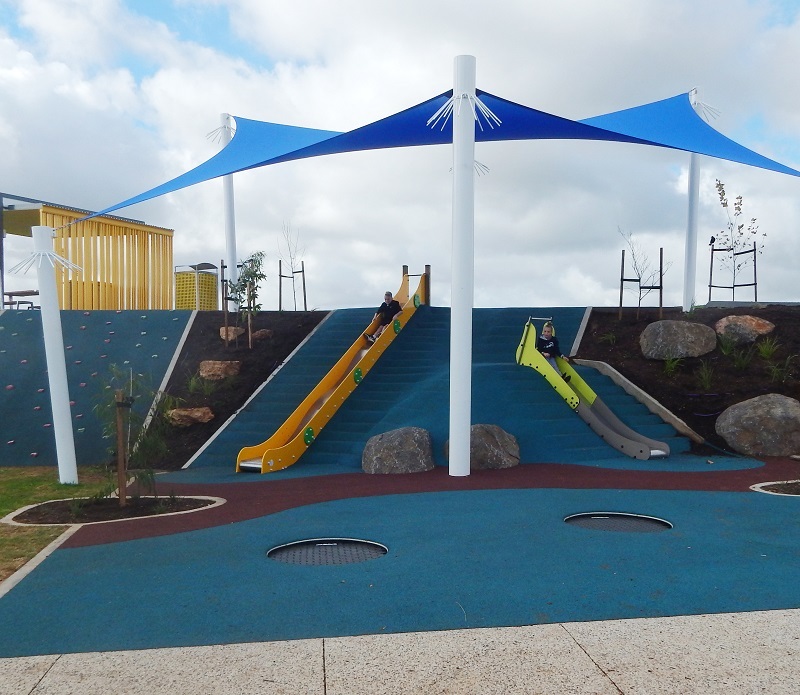 The playground, designed and supplied by Proludic, includes inclusive play elements such as the Pod Swing, a large embankment slide and the Speed Gyro Carousel. 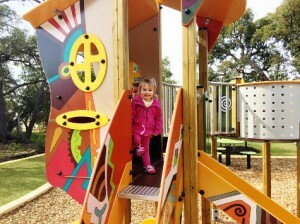 It also includes the Climbing Hut and the exciting Hip Hop. Location: Eastern Beach, Lakes Entrance, Victoria. Client: East Gippsland Shire Council. 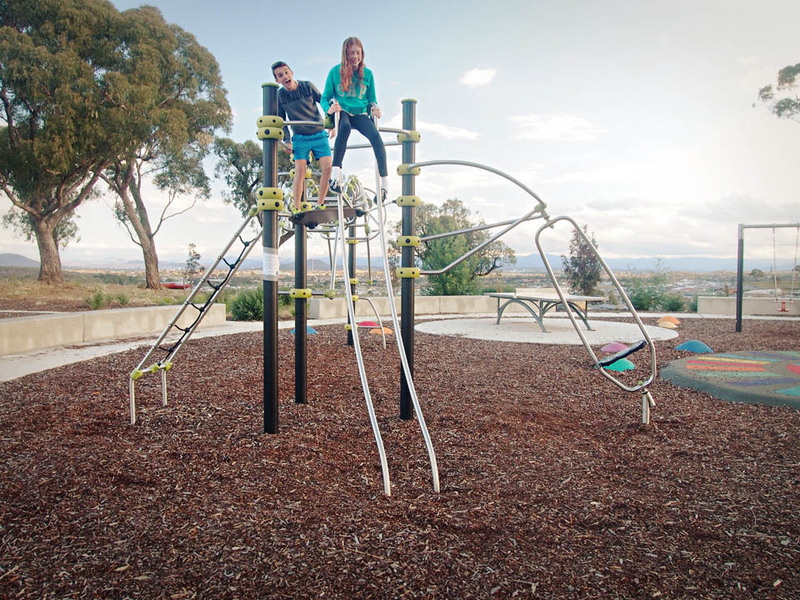 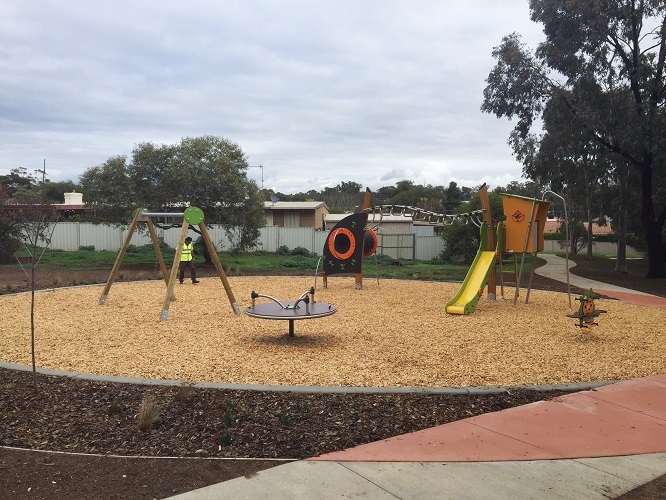 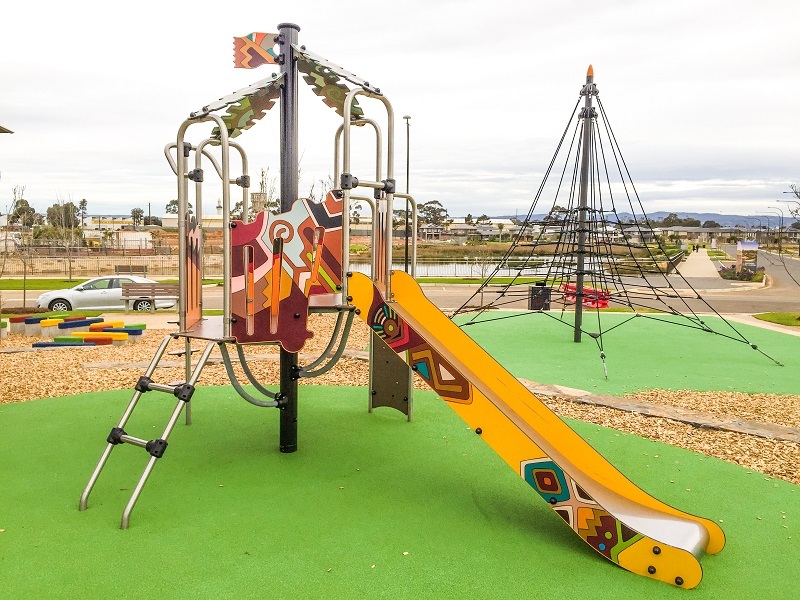 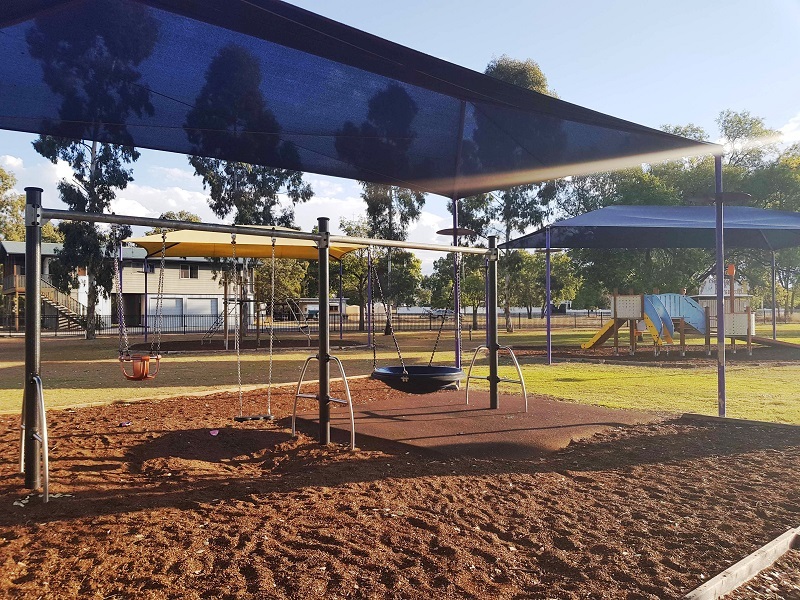 Proludic have installed an exciting and challenging new playground for the City of Port Adelaide Enfield at Eastern Parade Reserve, Ottoway. Eastern Parade Reserve is a local sporting ground for football, cricket and soccer. 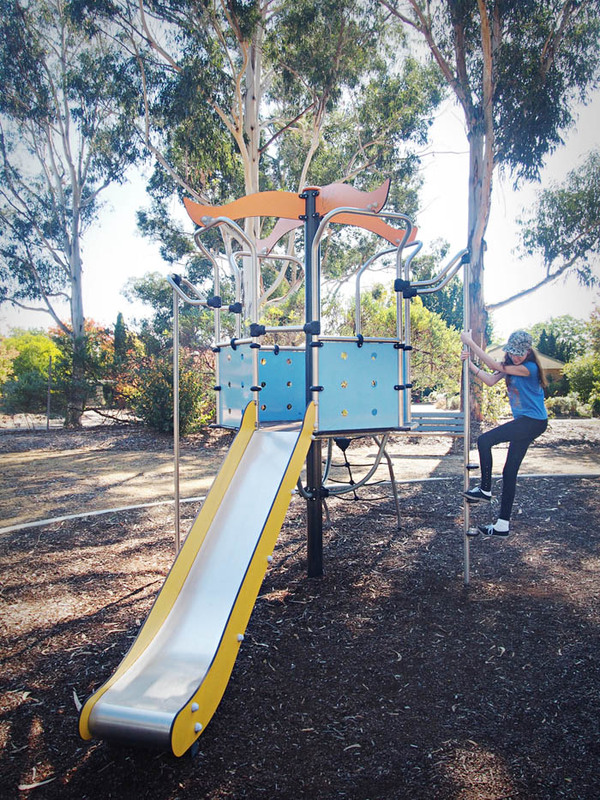 The playground features an impressive stainless steel Biibox Multi Play unit which includes a Cableway, rotating “Gyro” and slide. 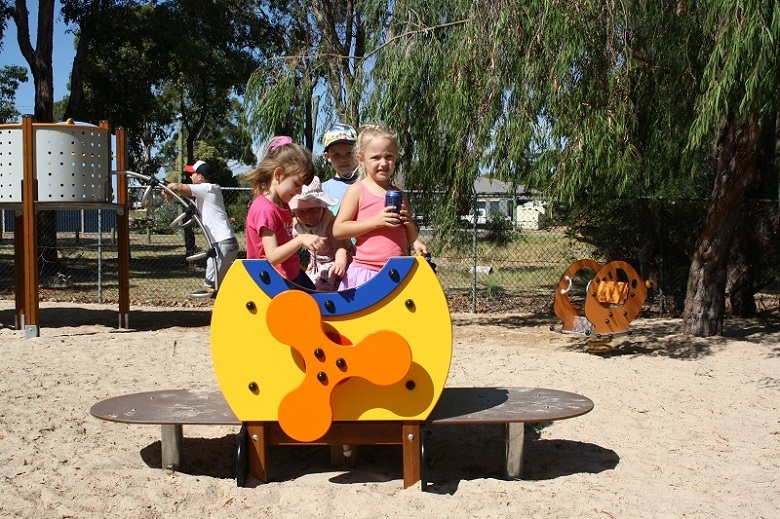 Other playground equipment includes Adelaide’s first Aeroskate, and a Hip Hop. 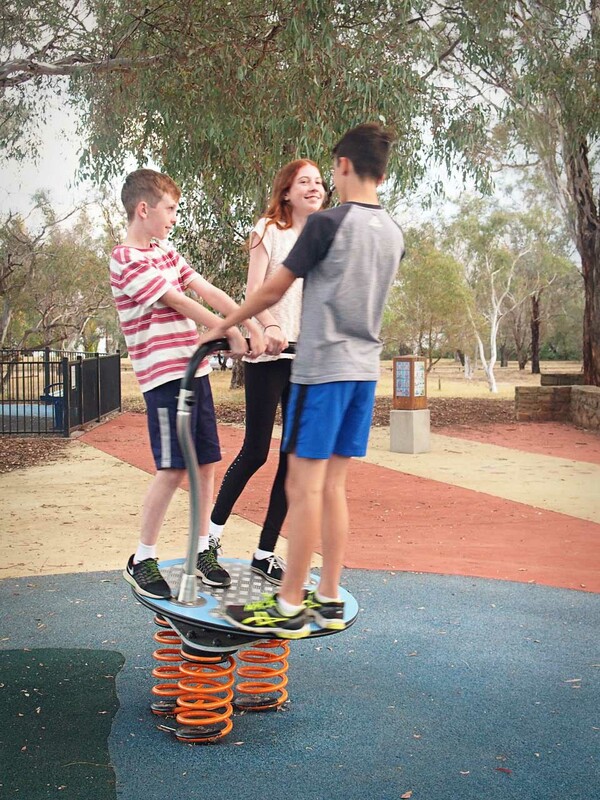 The Aeroskate is designed to simulate the motion of skating and requires an excellent sense of balance and coordination to conquer. 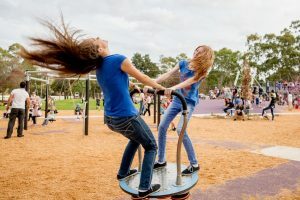 The rotating and bouncing Hip Hop stimulates the vestibular senses and encourages the development of balancing skills whilst having fun. 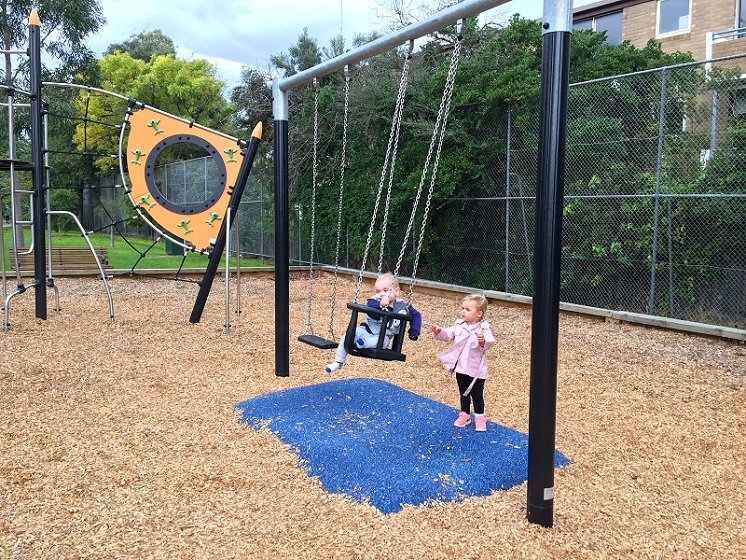 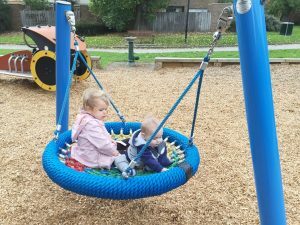 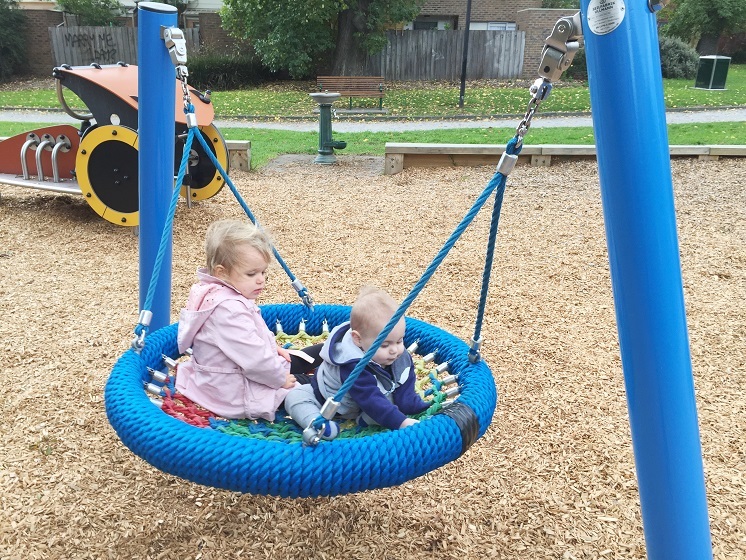 A “Zippy” springer and swings that include a toddler seat provide play activities for younger children. 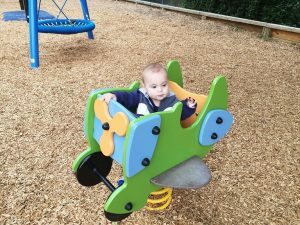 Site: Eaton Family Centre, Eaton, WA. 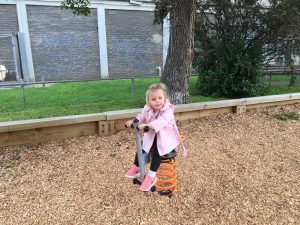 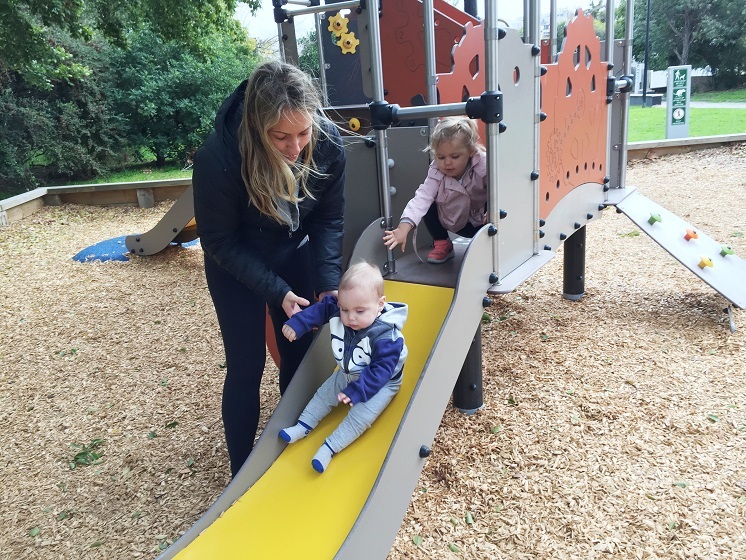 Eaton Family Centre have upgraded their outdoor play spaces with Proludic play equipment designed for the early childhood sector. Fun in the sun! 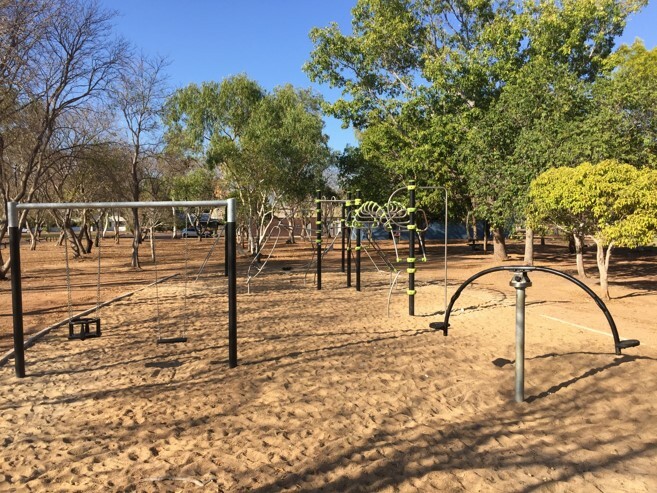 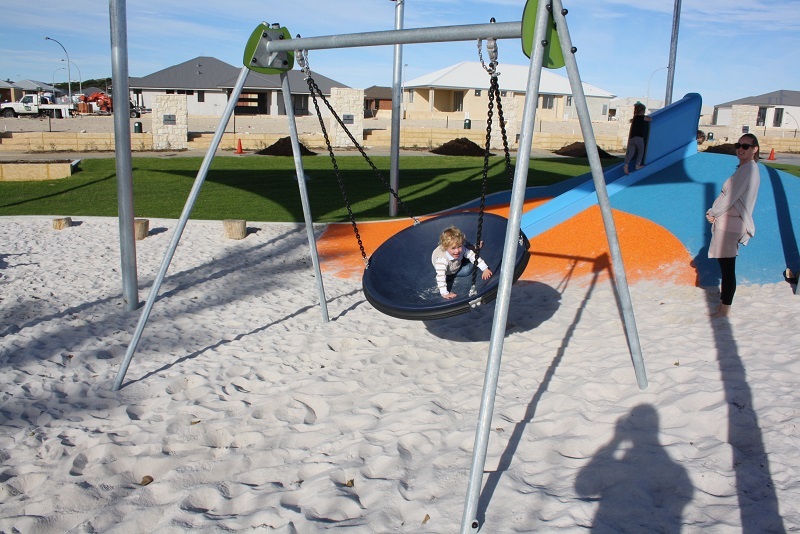 The playground at Edenbrook Estate gets children moving in a fun environment. 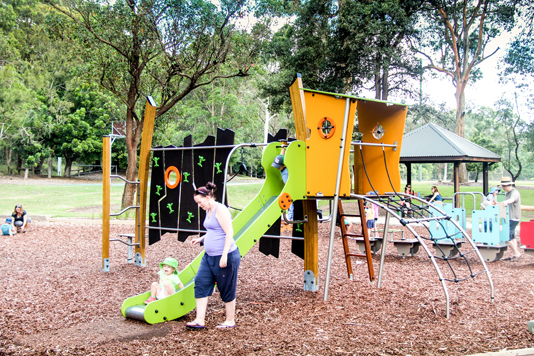 The play equipment provided by Proludic includes a flying fox, a large multi-play unit, a carousel and swings. Location: Eureka Aquatic Centre, Stanwell Street, Ballarat, Victoria. 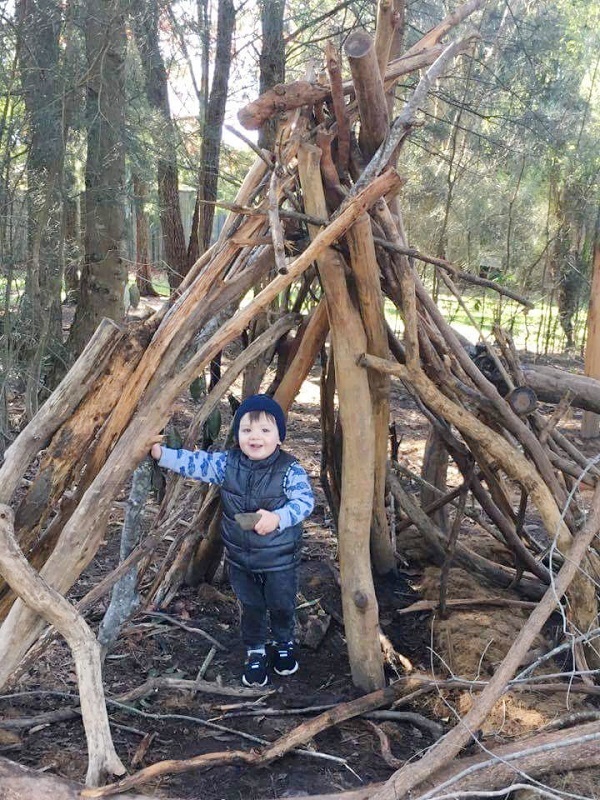 Location: Fontenoy Rd, Marsfield NSW. Location: Gulf Parade, Maslin Beach, SA. The refurbishment of Gladstone Gardens playground with Proludic playground equipment has resulted in the local community once again coming out to play! 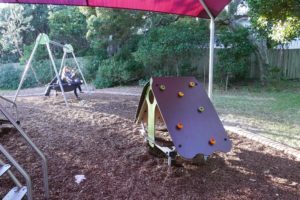 The playground had been previously underused by the local community, and the provision of Proludic’s innovative play equipment for both younger and older children has attracted families back to the playground. 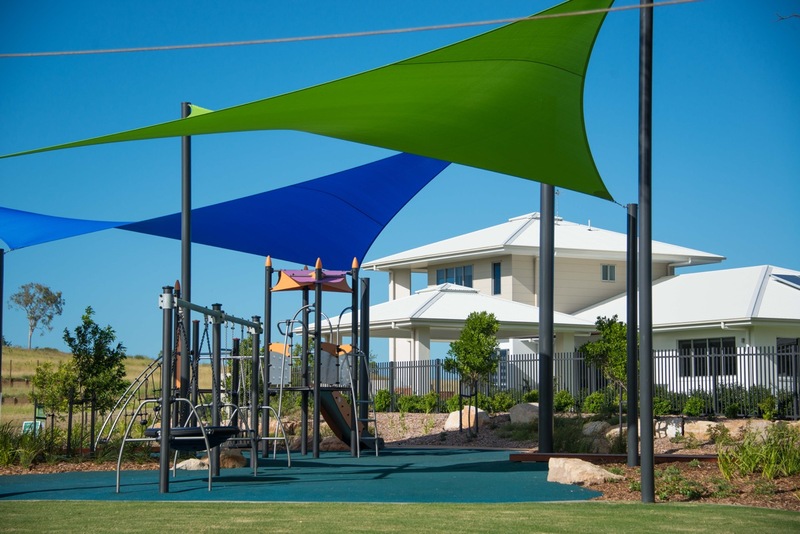 Location: 96 Rankin Street, INNISFAIL QLD 4860. Location: Grand Street Park, Pittsworth, Toowoomba Regional Council, QLD. 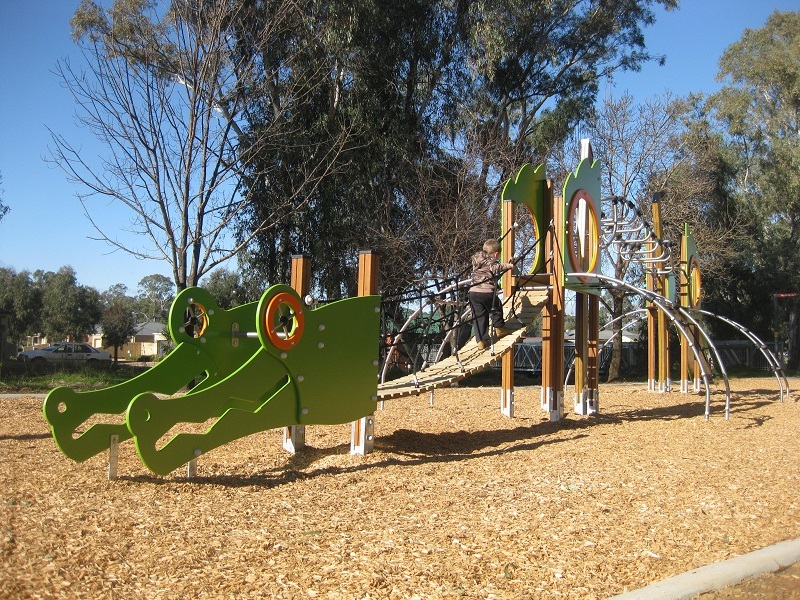 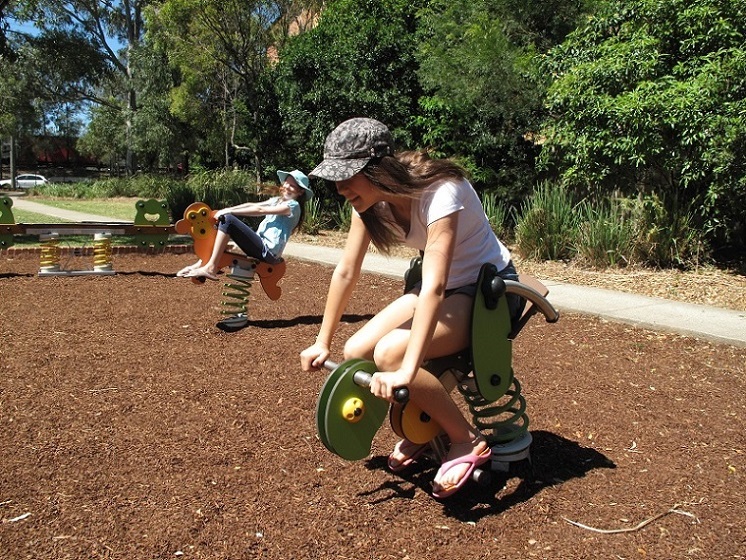 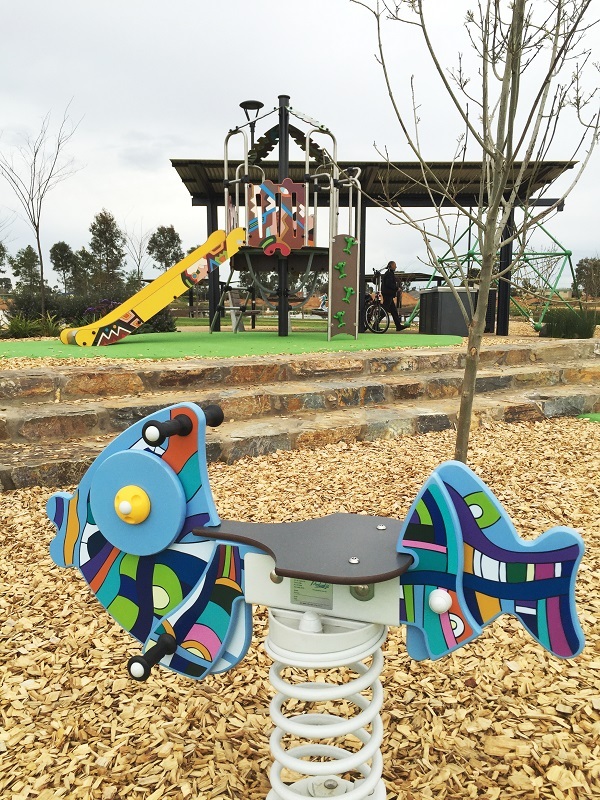 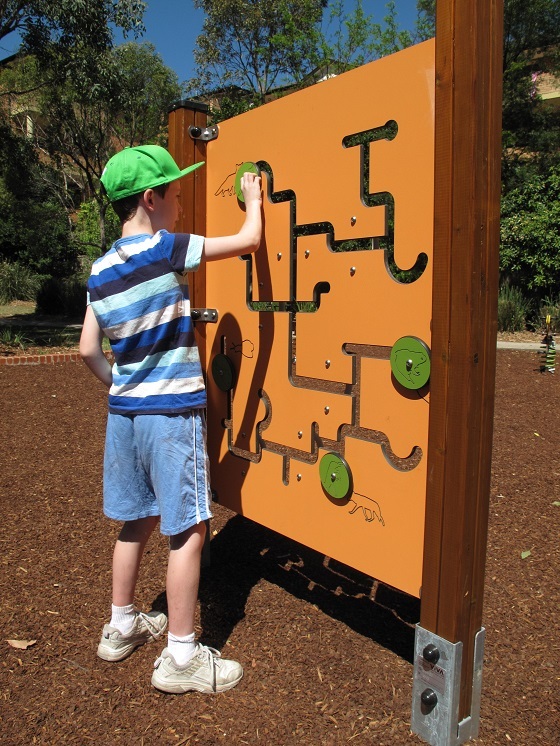 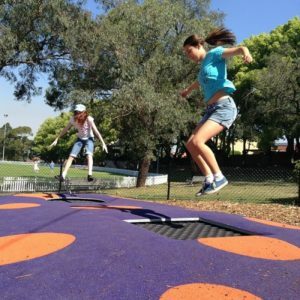 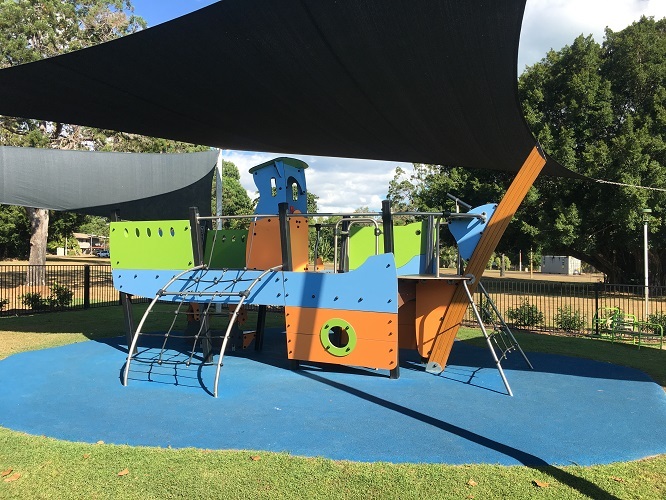 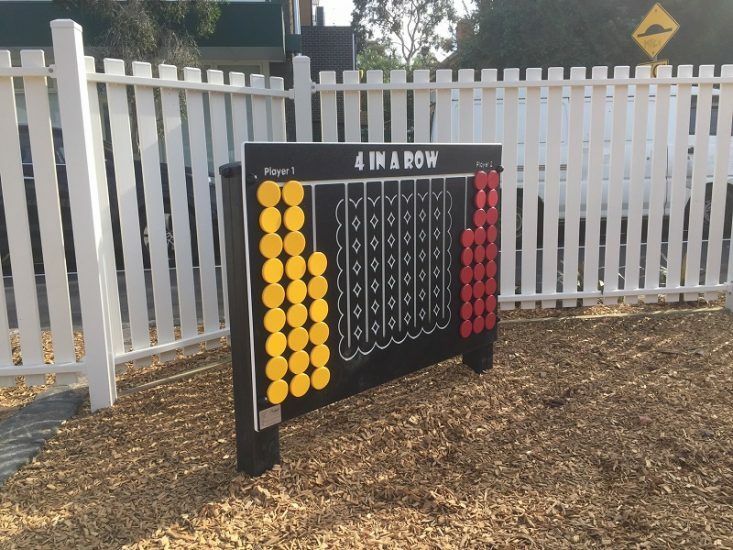 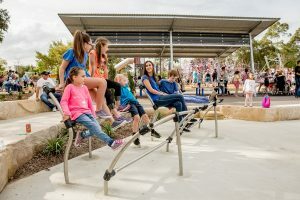 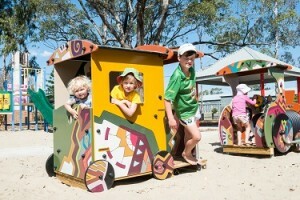 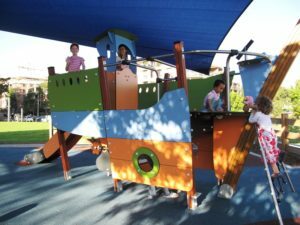 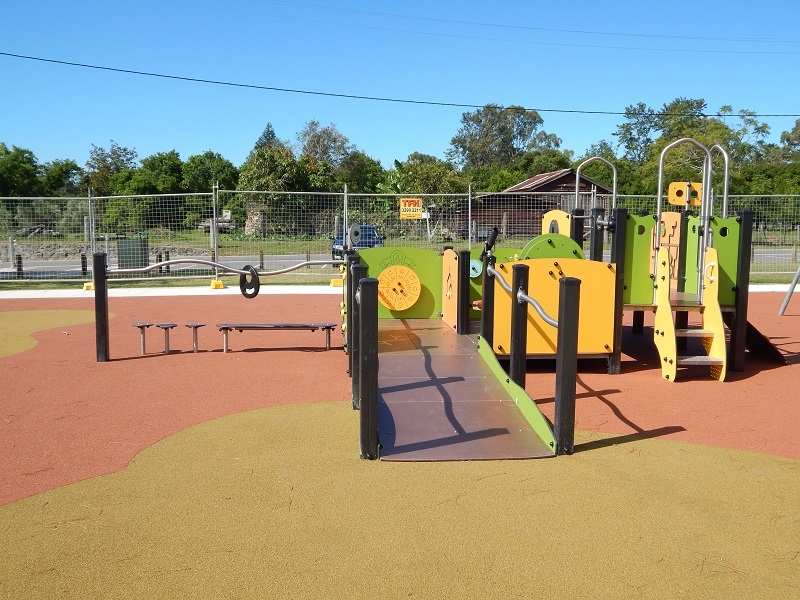 Proludic’s unique Grafic Games play equipment has been selected by Toowoomba Regional Council for a railway themed playground to enliven the park and further enhance imaginative play opportunities. 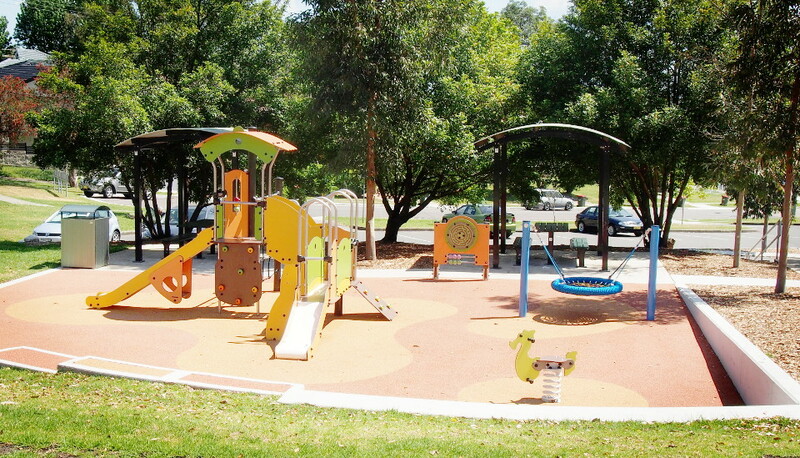 Location: Granny Smith Park, Threlfall Street, Eastwood. Maria Ann Smith, known as “Granny Smith”, is one of the City of Ryde’s most famous citizens! 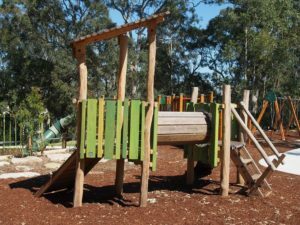 Back in 1868 Granny Smith ‘accidentally’ grew the first batch of little green apples that bear her name and are now grown all over the world. 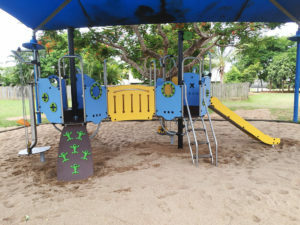 We helped pay tribute to Granny Smith in the Proludic playground equipment at the park with a specially designed Granny Smith Apple Springer, and Granny Smith shaped apples on the tree of the Tiboo item for young children. 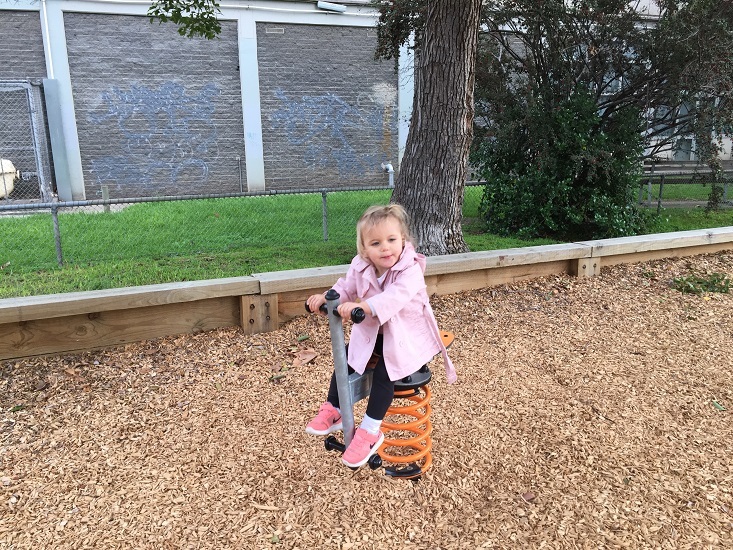 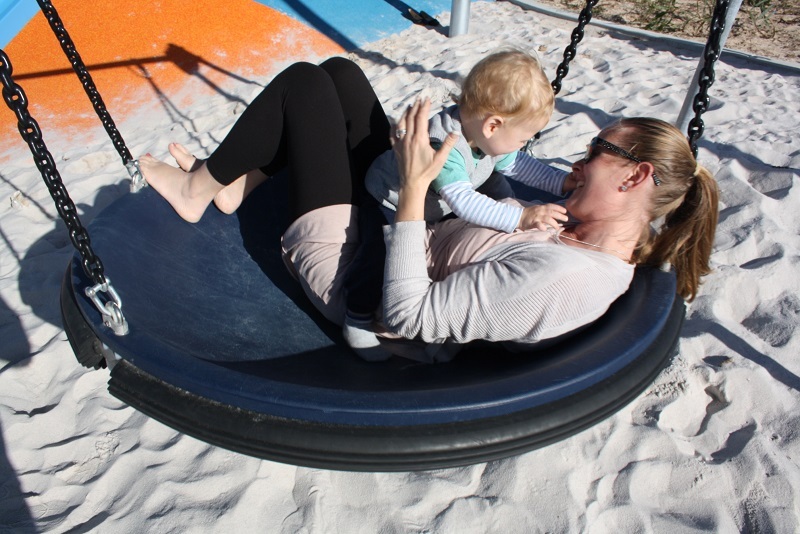 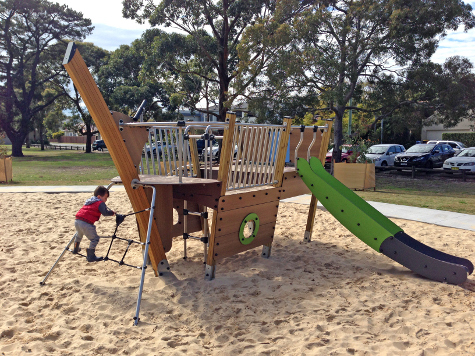 Click HERE to read a review of the playground on the “parraparents” website. 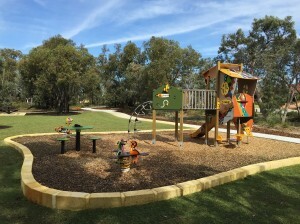 The playground at Harpley Estate was designed with a wetland theme. 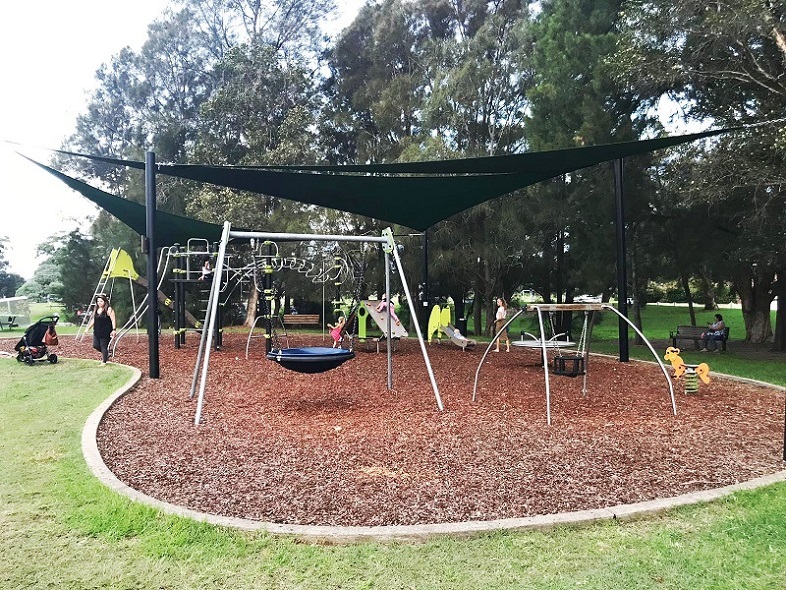 Proludic was pleased to be involved in the project by providing a double Cableway, a custom bridge, a custom hammock and the Speed Gyro carousel. 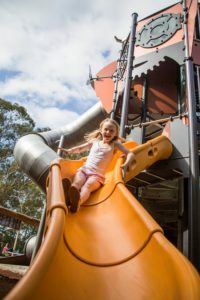 The playground is a great place for a fun day out with the whole family! 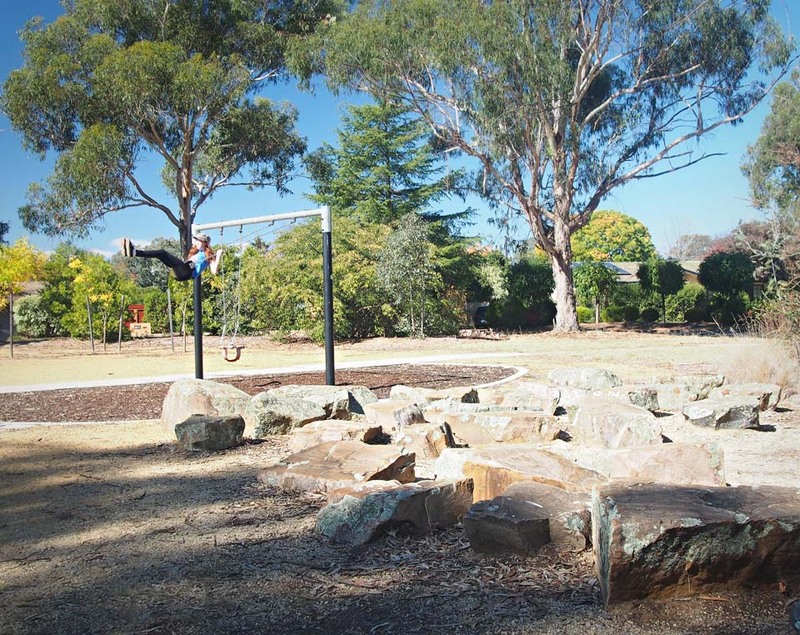 Location: Hilton Park, Beaconsfield, Western Australia. Location: Hughes Park, 314 Burns Bay Road, Lane Cove, NSW. Location: Irene Park, 83 Balaclava road, Eastwood, NSW. 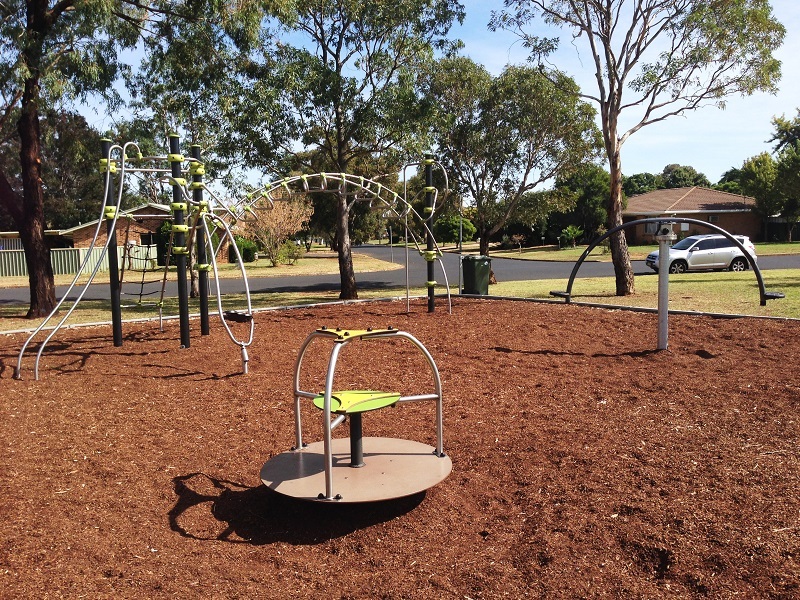 Address: Jesmond Park, Robinson Ave, Lambton NSW. The playground at John Leitch Park which includes Proludic inclusive play equipment creates a world of fun for children of all abilities. The inclusive Diabolo+ Multi-Play is the main feature of the playground where accessibility for children with reduced motor skills is encouraged by the presence of a ramp, low level floors, ground-based play opportunities and secure steps. 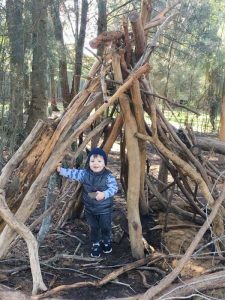 The play activities located inside and outside the structure help with the development of gross and fine motor skills, cognitive faculties and provide sensory stimulation. There are multiple easy-access entrances so that accompanying adults can share and encourage play or quickly intervene if needed. 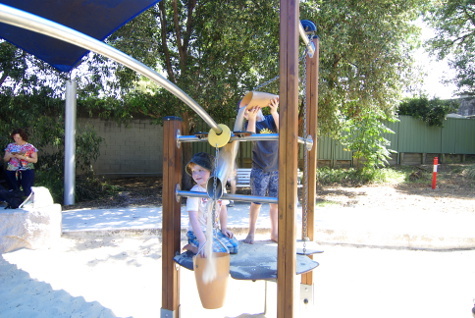 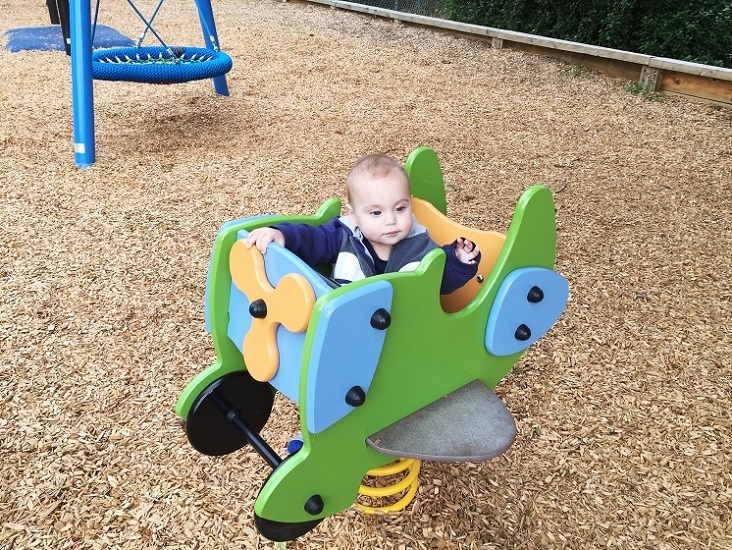 Other inclusive play equipment includes a Pod Swing, a Helicopter Springer and a Speed Gyro, these items combine motor coordination and sensory stimulation and develop the sensation of feeling the body move in space. 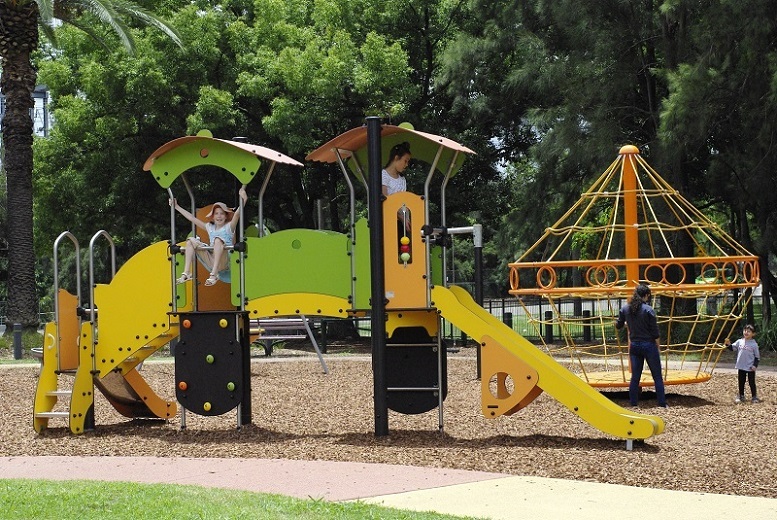 J2400 Speed Gyro (left), J986 Double Spring Perch (2nd from left), J3836 Diabolo (2nd from right) and J479 swingset (right foreground). 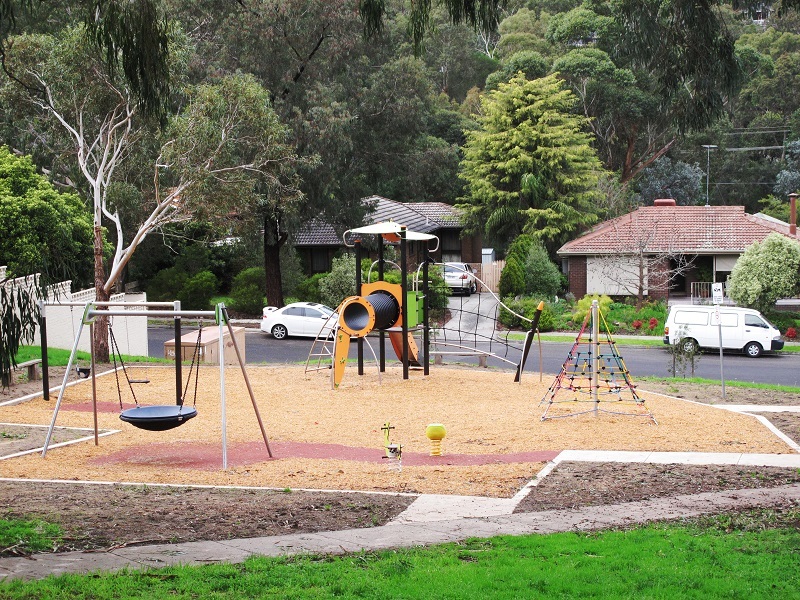 Address: Karina St, Mornington Victoria. 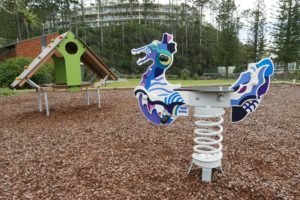 The brief for this playground at Leo Smith Reserve included a nature theme with robust materials. The Proludic “Trawler” boat includes compact composite panels with a timber look – a great solution! 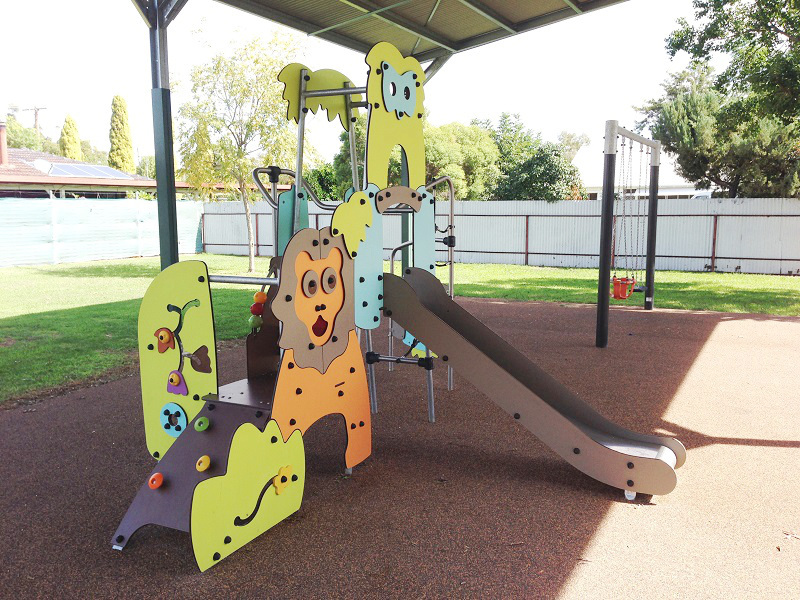 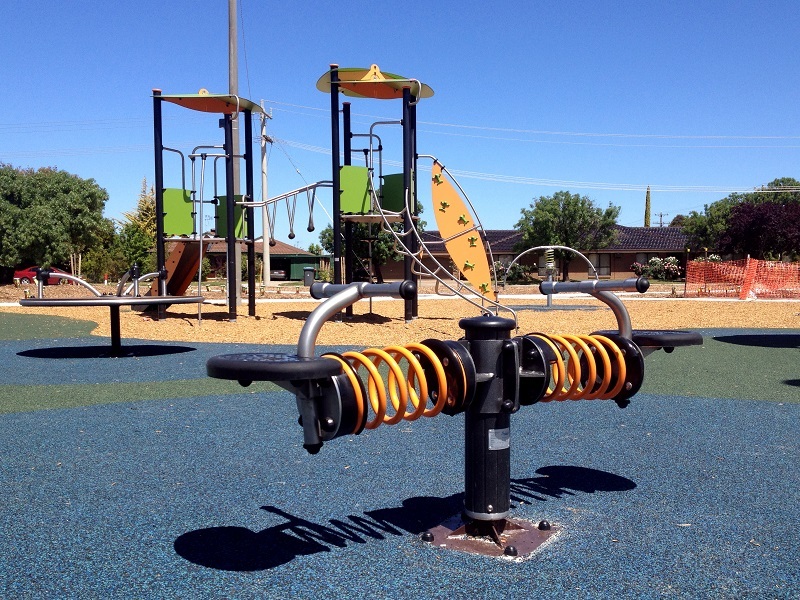 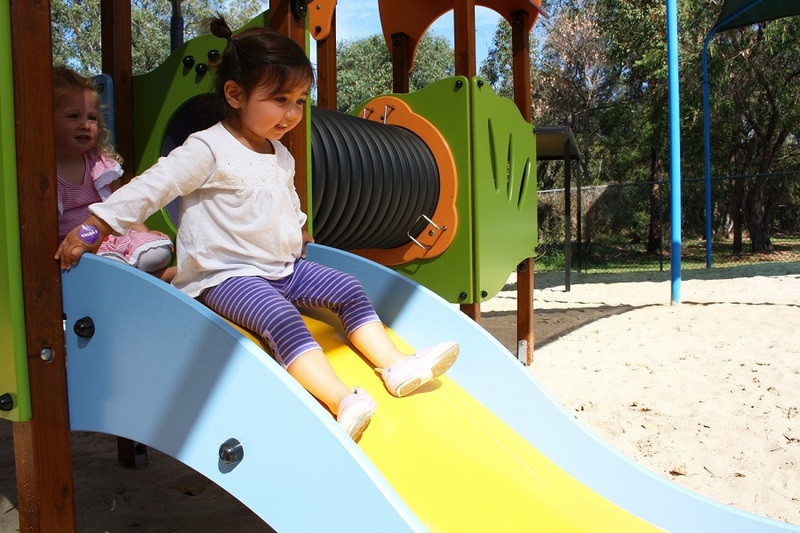 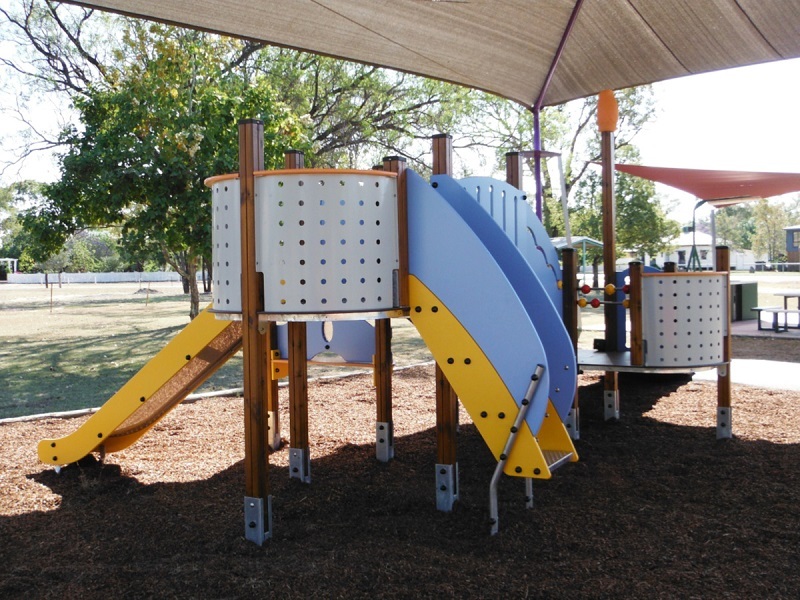 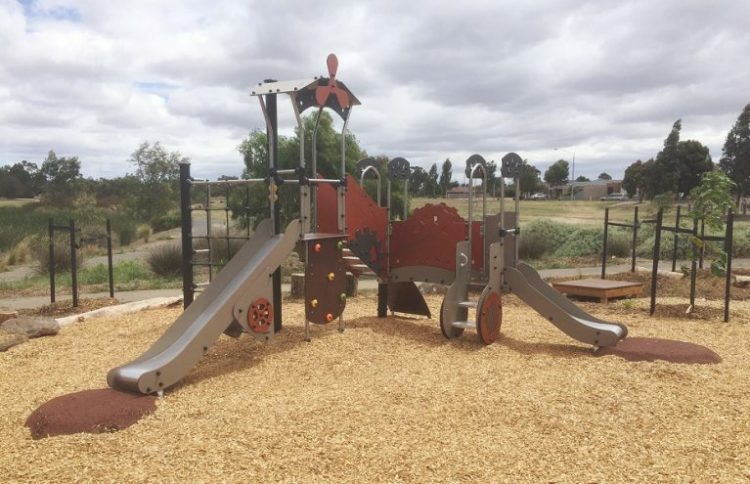 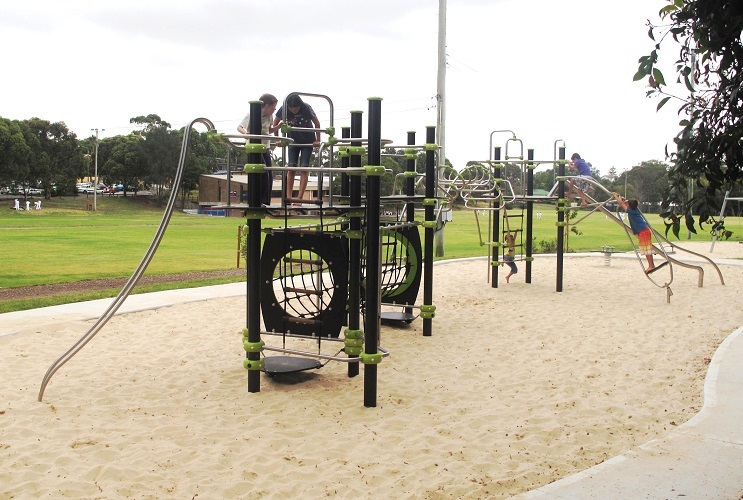 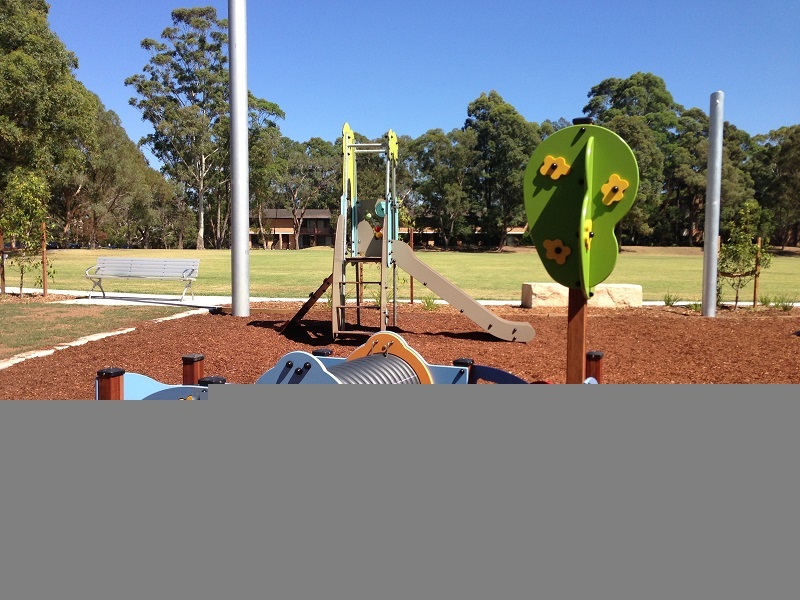 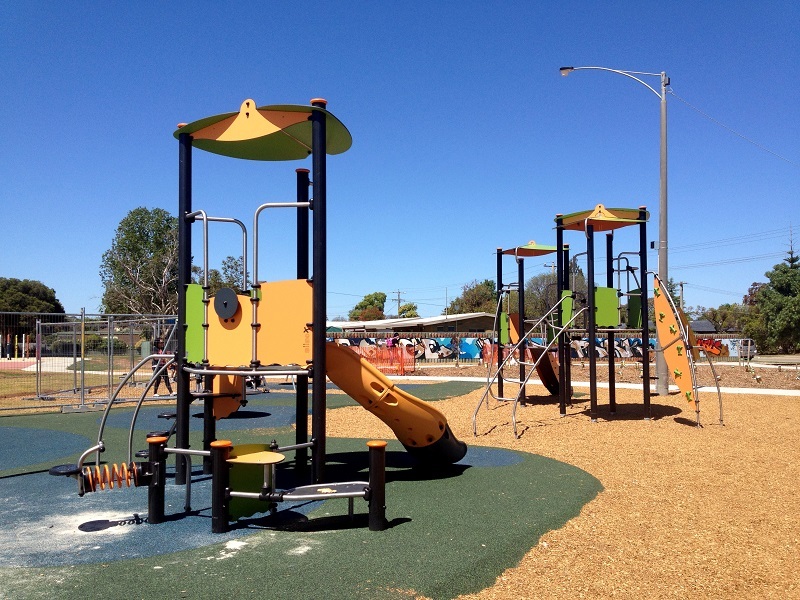 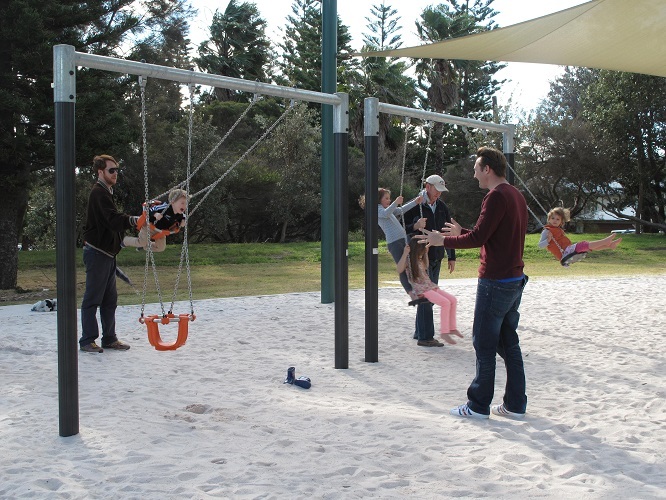 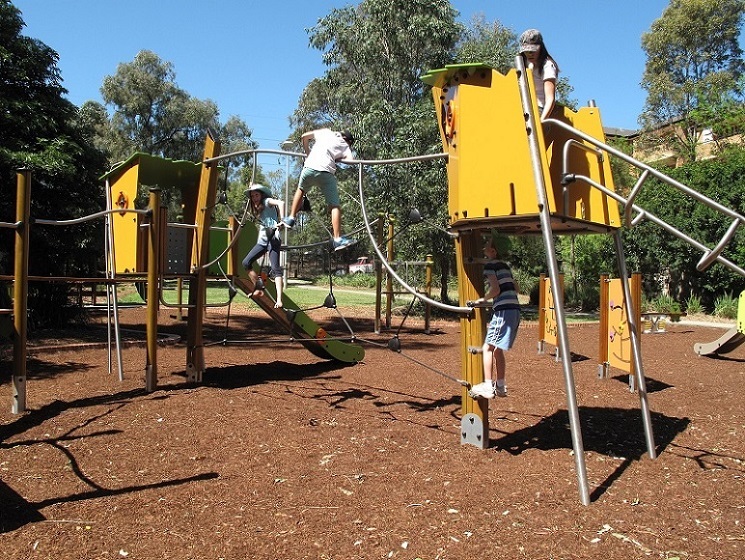 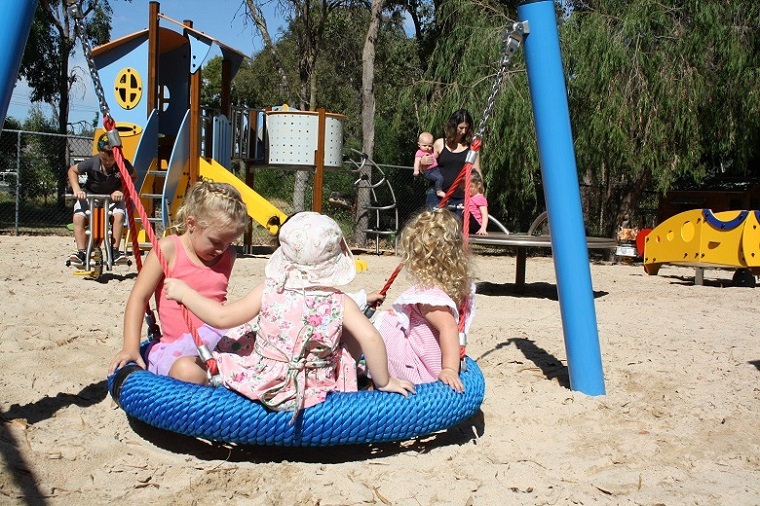 The playground at Lions Park in Chinchilla provides play activities for a wide range of ages and abilities. Proludic provided an inclusive and accessible Vivarea Multi-Play, play panel and swings for younger chidren and an Ixo senior Multi-Play and the Hip Hop for older children. 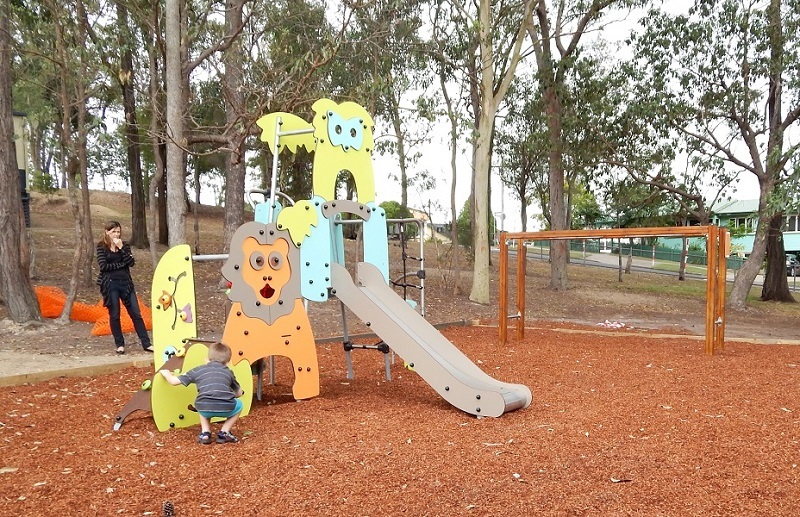 This Lions Park playground features inclusive and sensory play equipment for children from 2 years old. 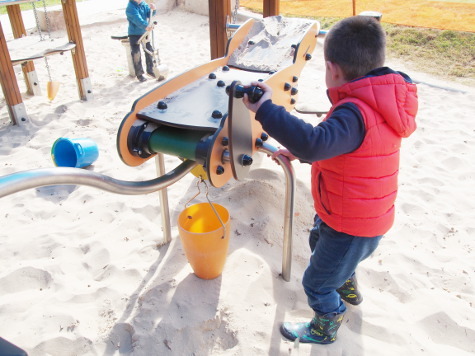 The Proludic Sand Factory, specially designed for children between 2 and 8 years old includes a wide range of different workstations encouraging the extraction, transportation and moulding of sand. The play activities stimulate the senses and help with the development of key skills such as motor, social and educational skills. 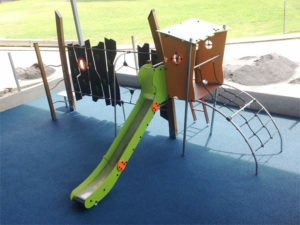 Other equipment includes a Pod Swing, an Inclusive Play Orb and panel. Address: Loyola Road Park, 54 Loyola Road, Werribee. 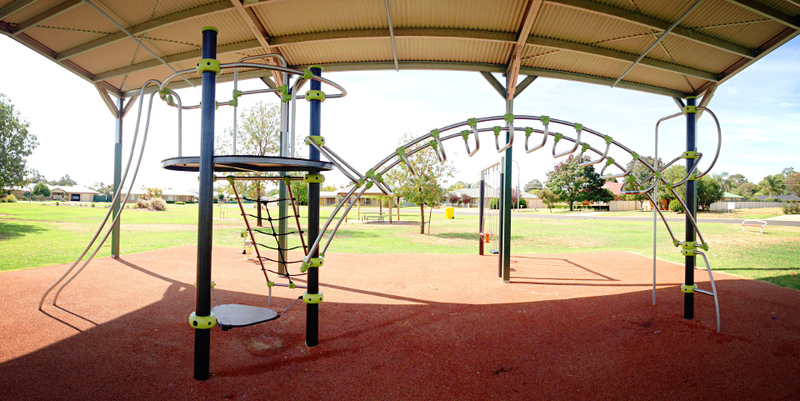 Address: Cnr Sloman Close & Lindsay Place, Dubbo, NSW. Location: Jacaranda Ave, Logan Central, QLD. Location: 22 Mawson Crescent, Hillarys, Western Australia. Site: Mayfield State School, Paget St, Carina QLD 4152. 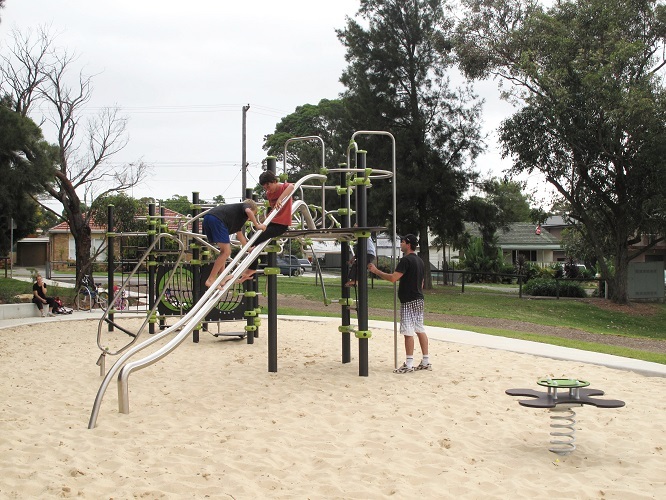 Address: McCabe Park, Church Street, Wollongong. 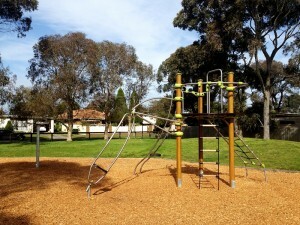 Location: McDonald Reserve, Reynolds Road, Belmont, Victoria. 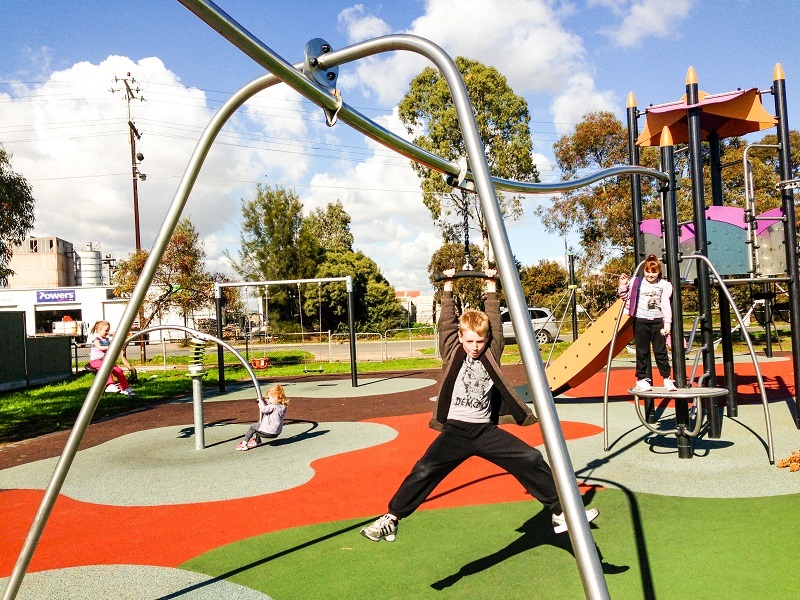 Client: City of Greater Geelong. 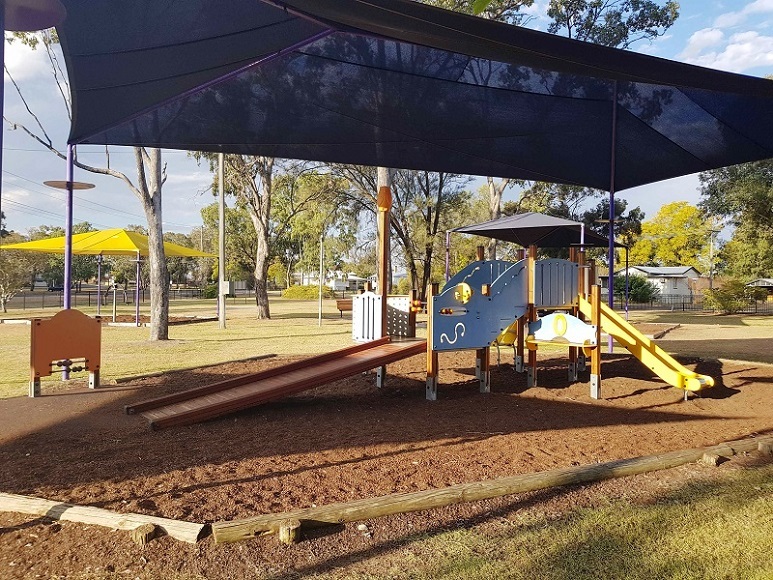 Address: Currajong Parade, Narromine NSW. 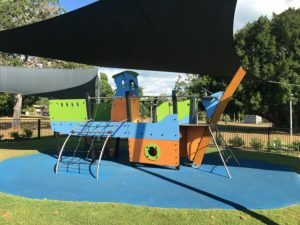 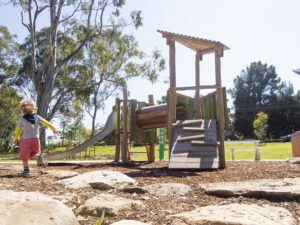 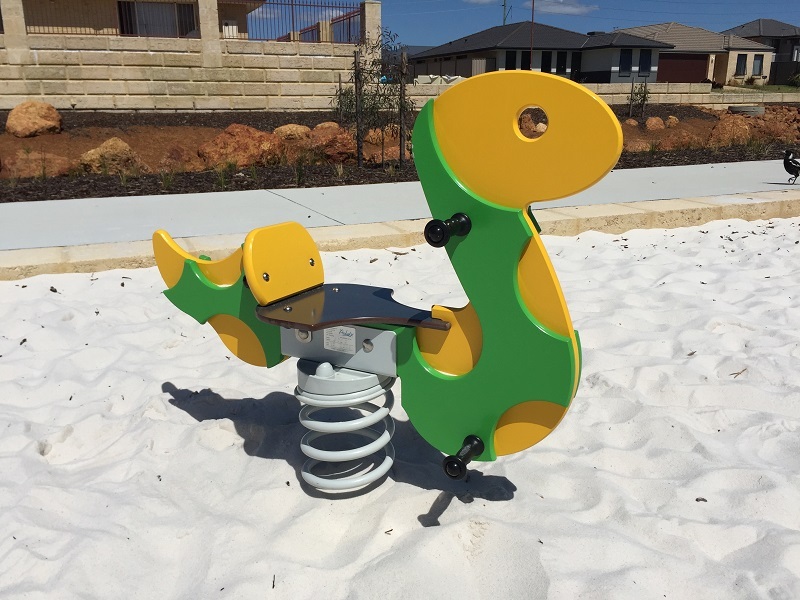 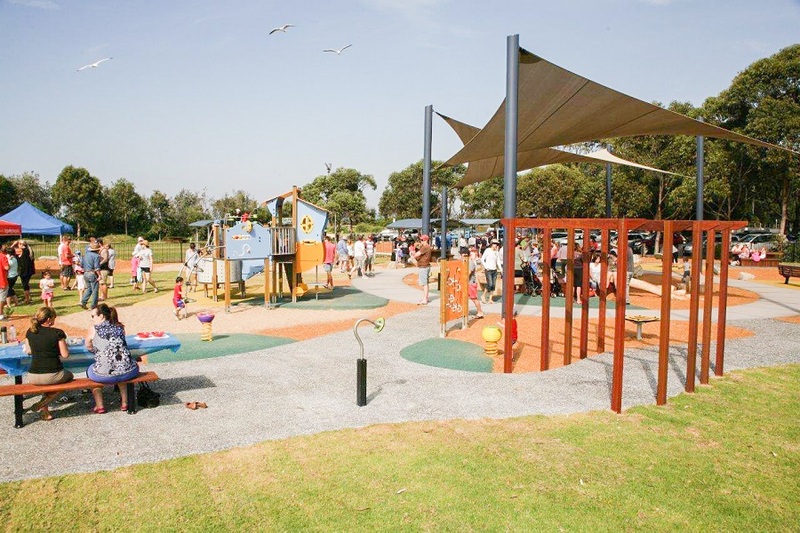 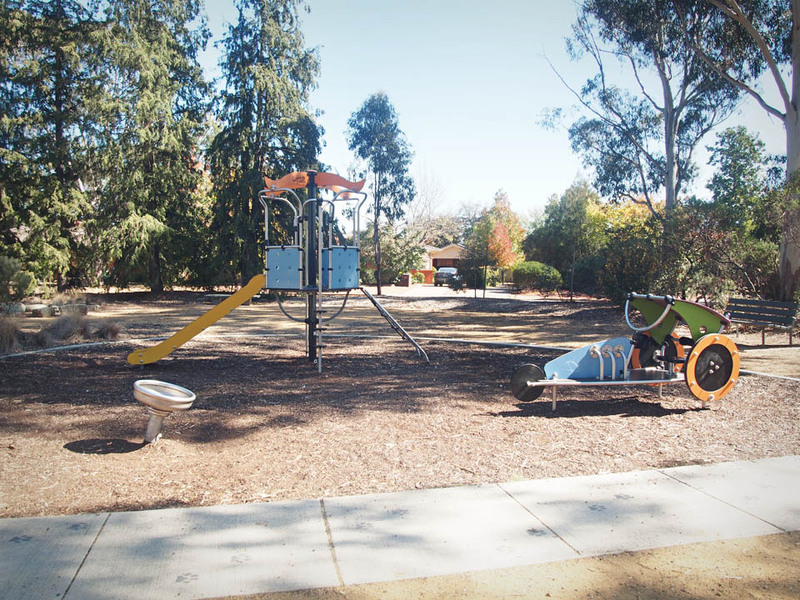 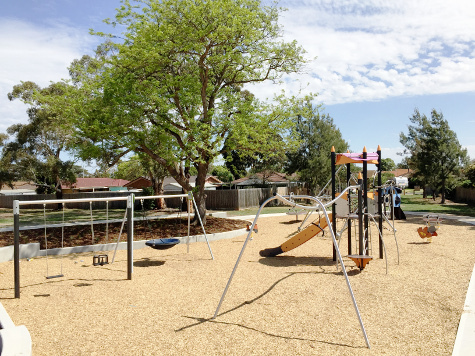 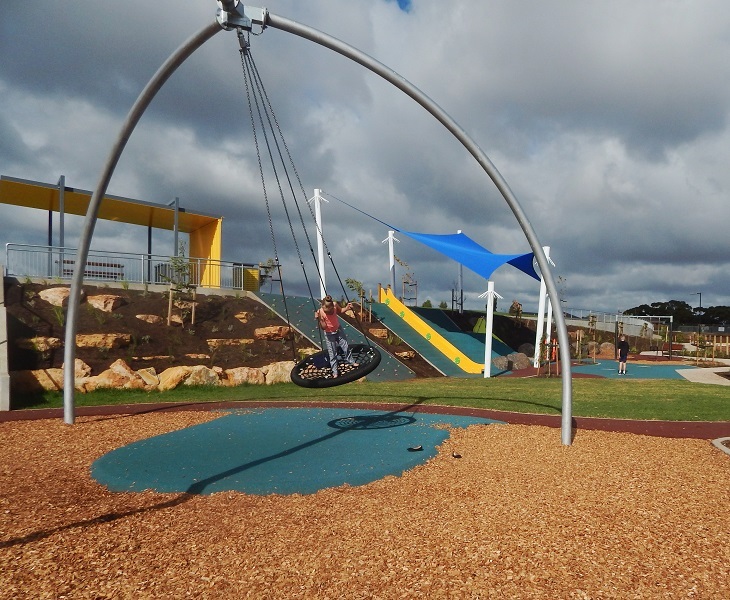 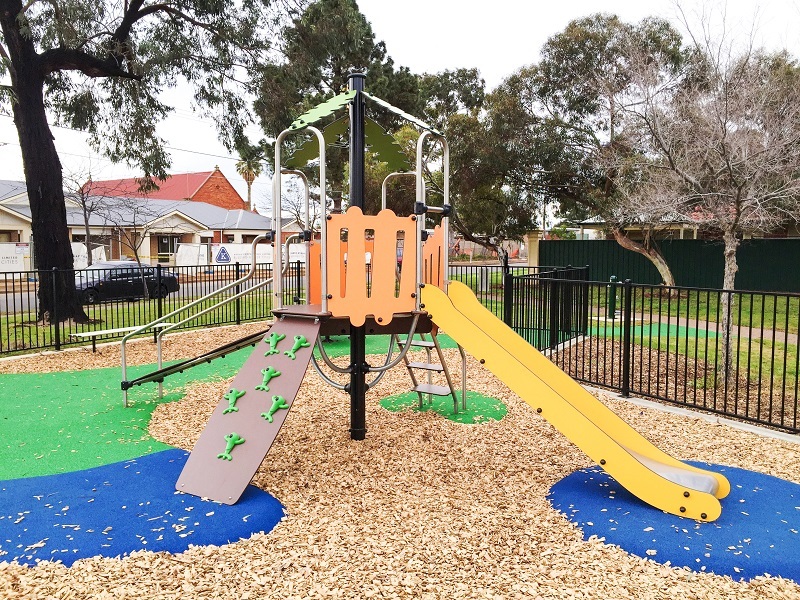 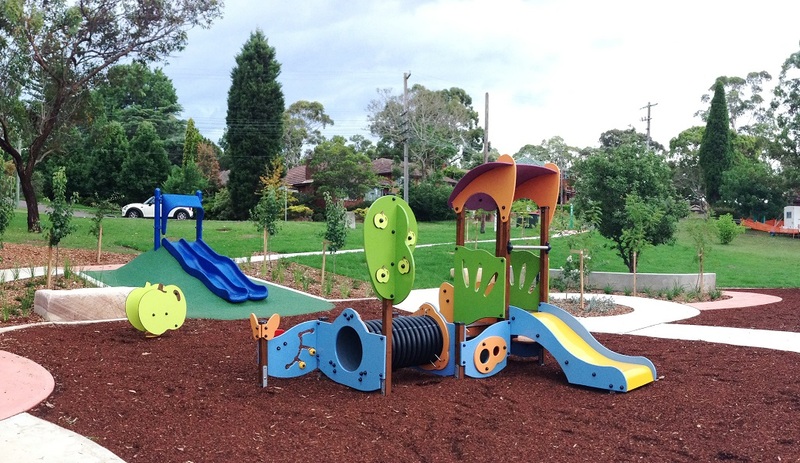 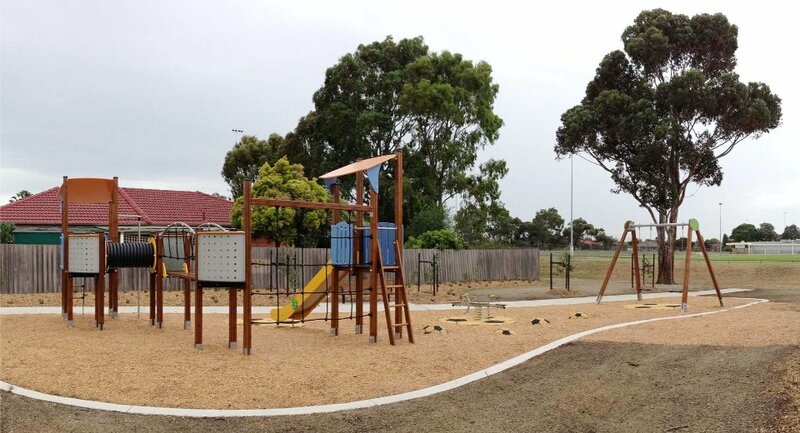 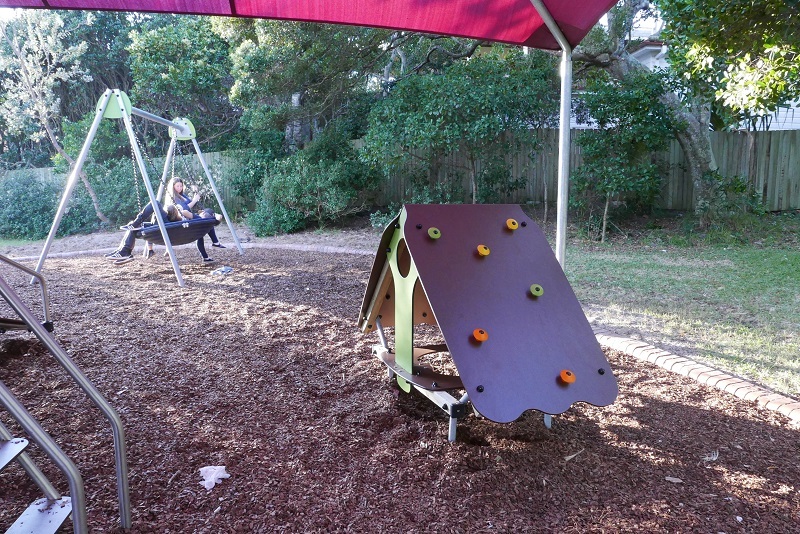 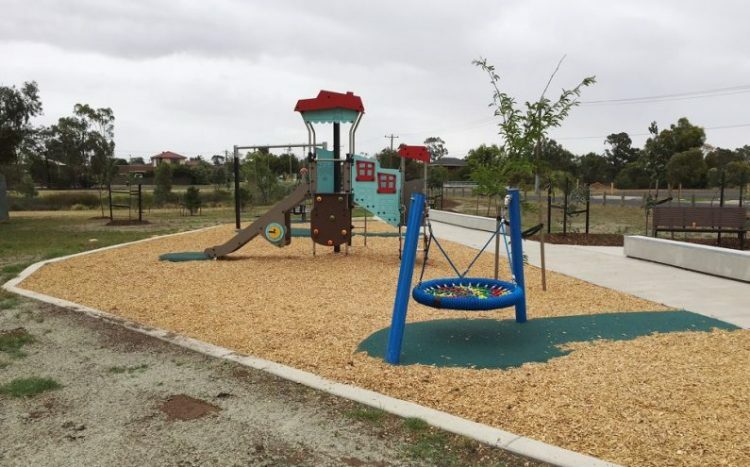 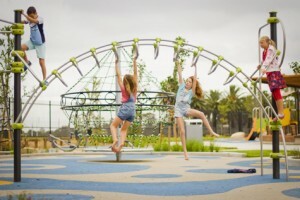 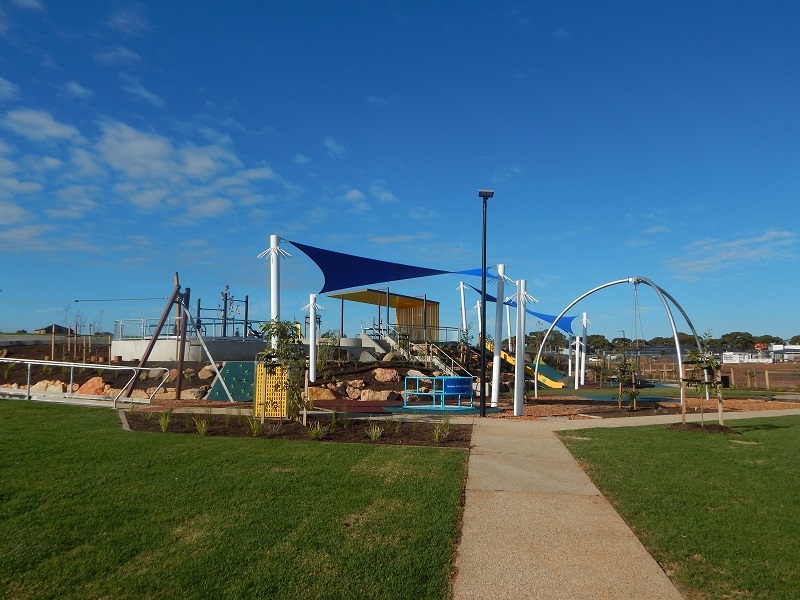 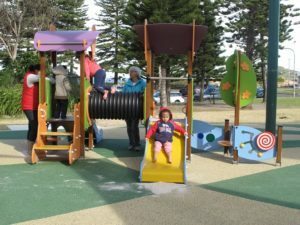 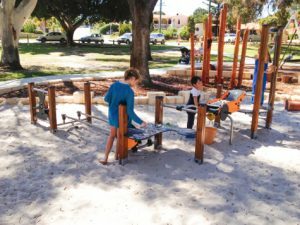 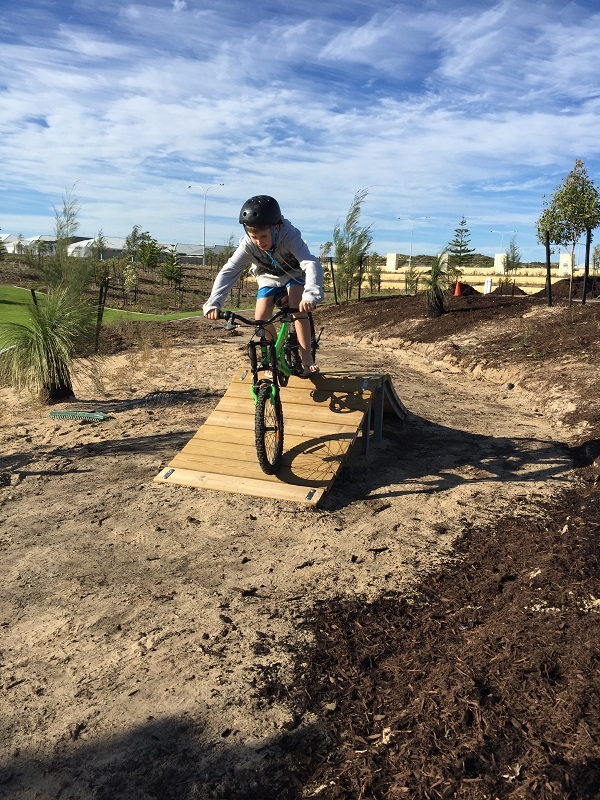 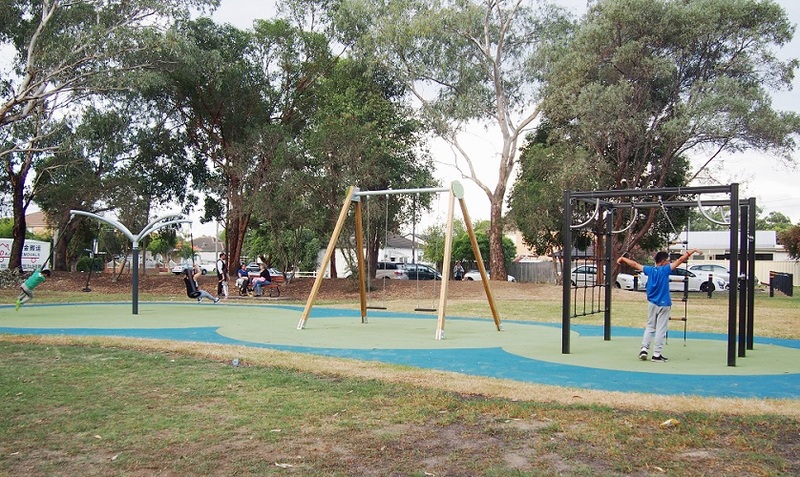 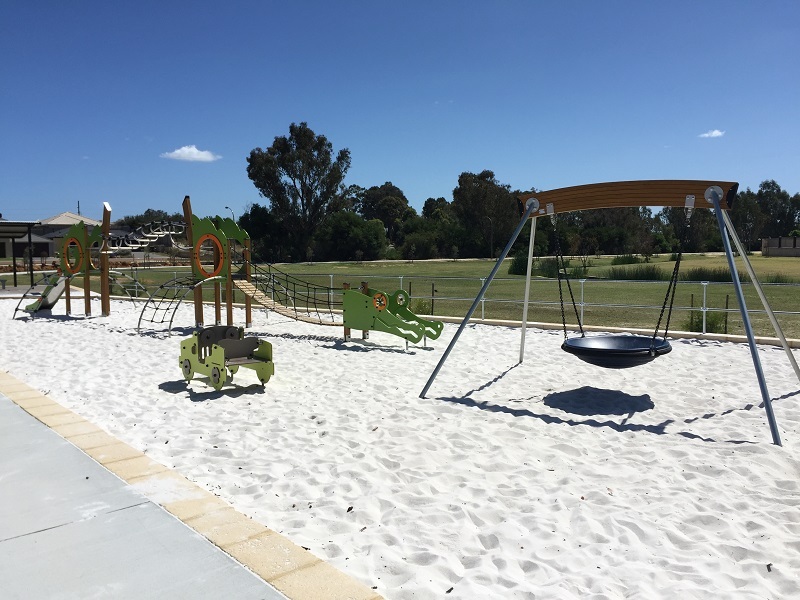 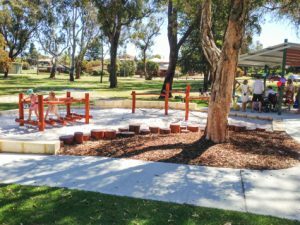 The City of Ryde have enhanced the existing landscape features of Memorial Park with the provision of this beautiful nature inspired playground. 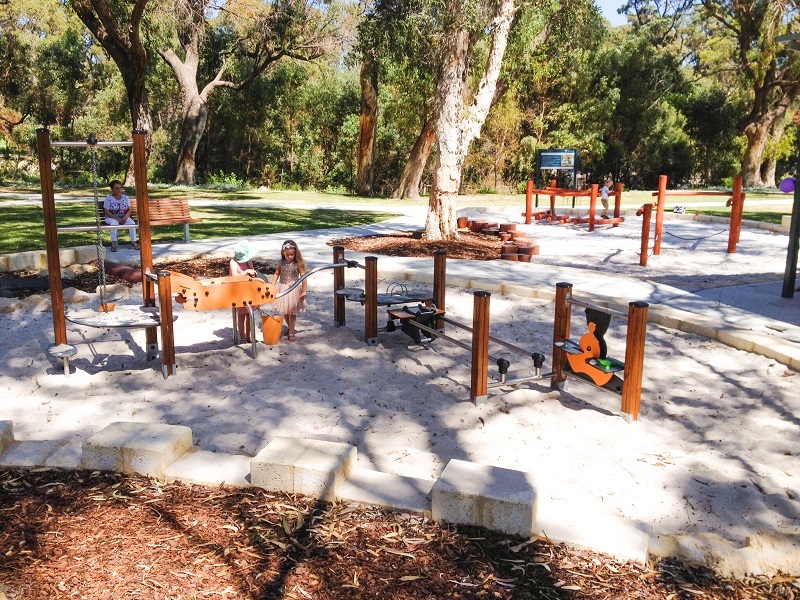 Different items of timber play equipment along with sculptures, a water course, seating and BBQ area provide families with a wonderful place to play together. 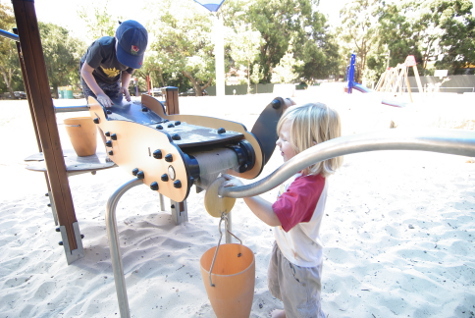 This playground contains Proludic’s J4933 Origin’ Multi Play. 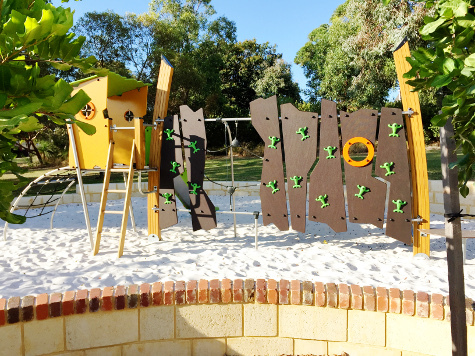 With Proludic Origin’ equipment in natural play settings children’s senses are awakened and stimulated. Site: Moil Park, Moil, NT. 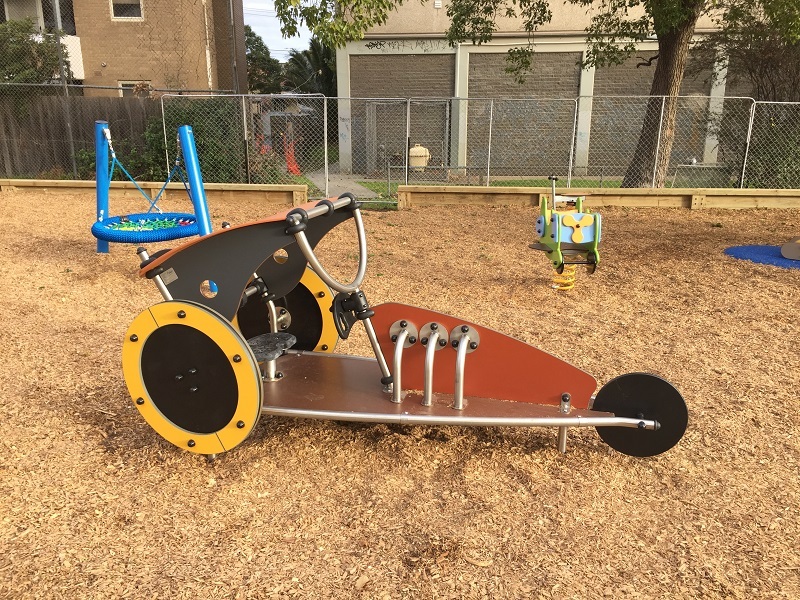 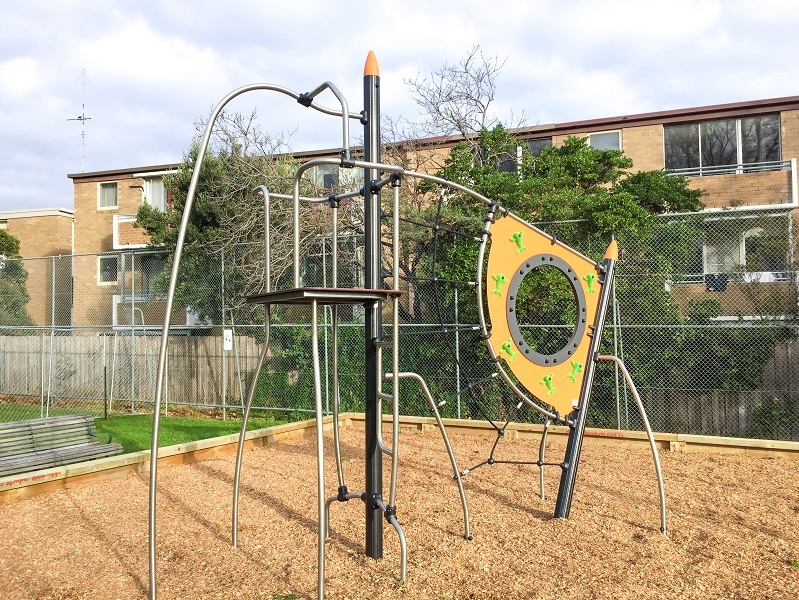 Proludic provided a Senior multi-play unit and dynamic pieces of play equipment to Moil Park that will get children moving ! 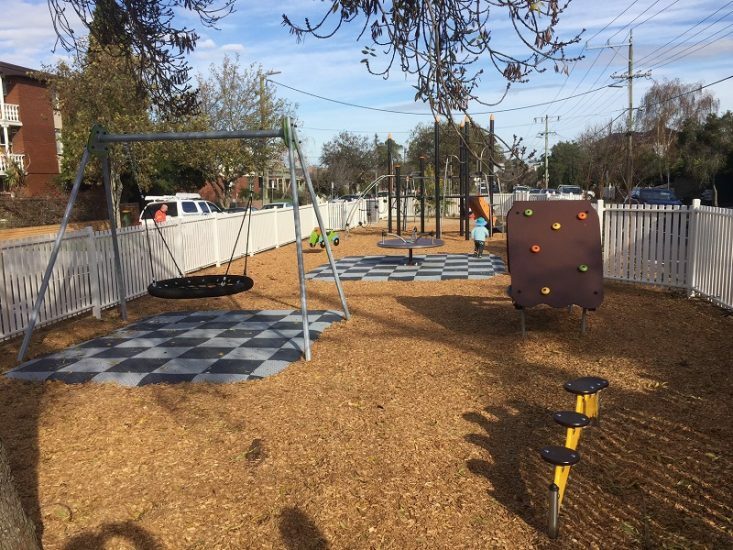 To read our case study please click HERE. 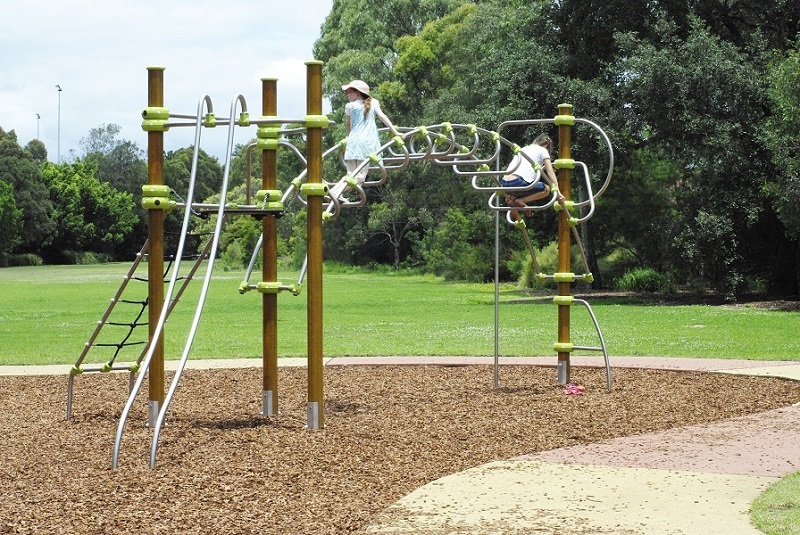 Location: Monash Park, Ryde Road, Gladesville. 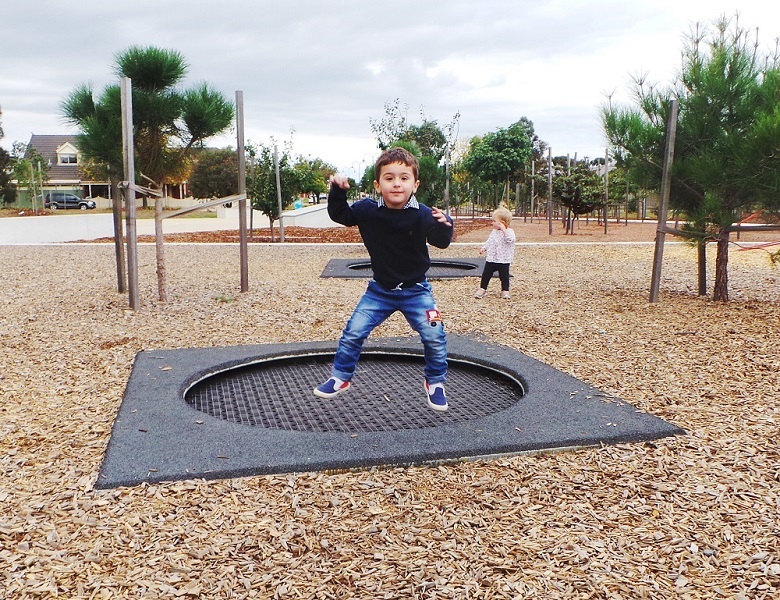 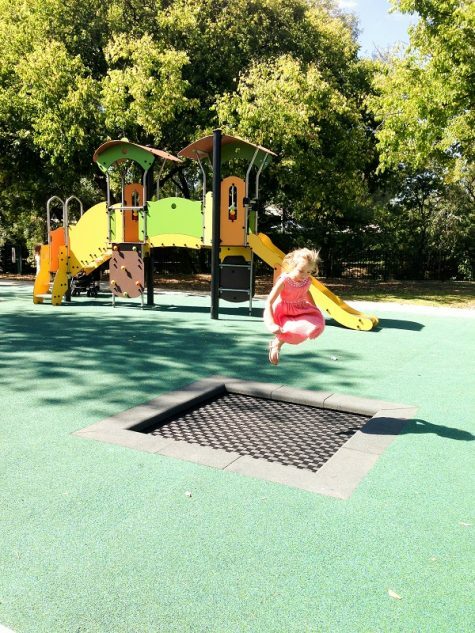 Our Proludic trampolines feature in this playground upgrade designed and built by the City of Ryde. Visit the playground for a bounce, they are lots of fun! Monash Park playground is located next to a playing field and an interesting feature of this playground is the customised wet-pour rubber soccer balls. Several were constructed on-site whilst the rest were hand crafted in our Proludic Terry Hills warehouse and then installed on-site. Location: Morgan Place playground. 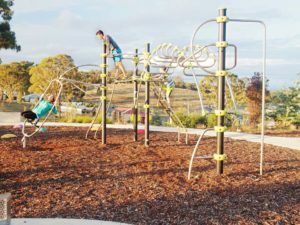 Morgan Place, Curtin, ACT. Z11-0401 swingset with 1 standard and 1 toddler seat. 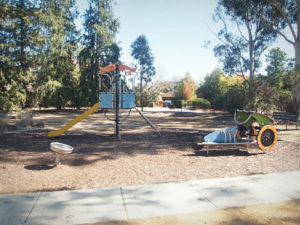 J3601 dragster (right), J2680M astrolab (centre) and J2595 rotofun (left). 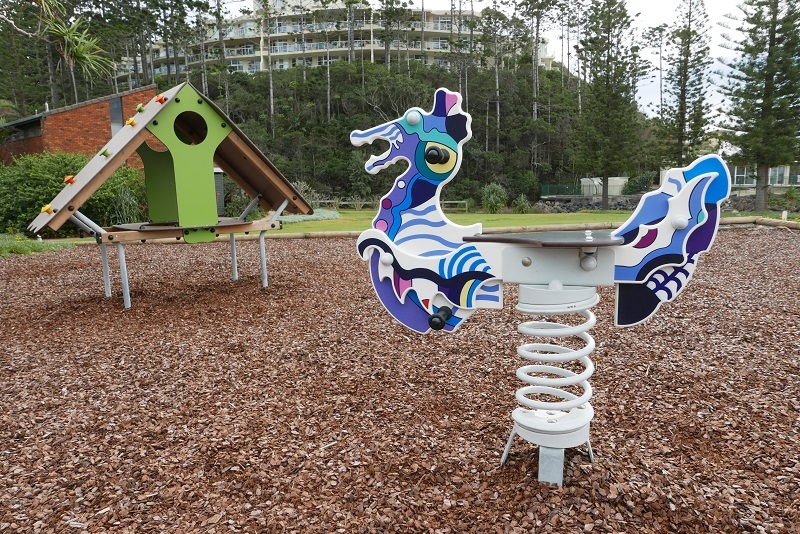 Location: Nautilus Resort, 8 Solitary Islands Way, Sapphire Beach NSW 2450. 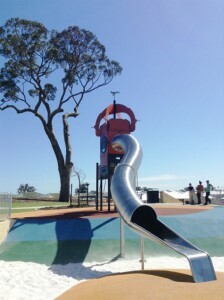 Location: New Minster Park, Wyndham, Victoria. 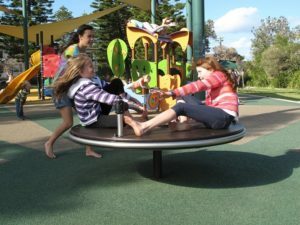 Location: North Steyne, Manly Beach. 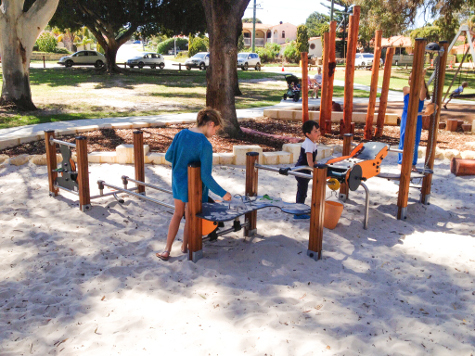 Inclusive Play equipment can be seen in this beautiful beachfront park. 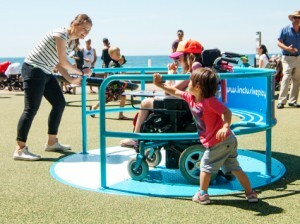 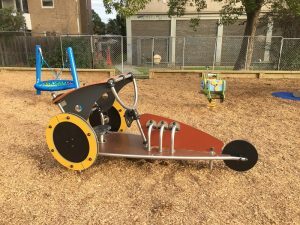 The playground contains equipment accessible to children with special needs: it includes the Wheelspin which is accessible for wheelchairs and other users, a Pod Swing, play panels and a Tubophone. 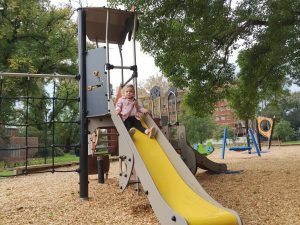 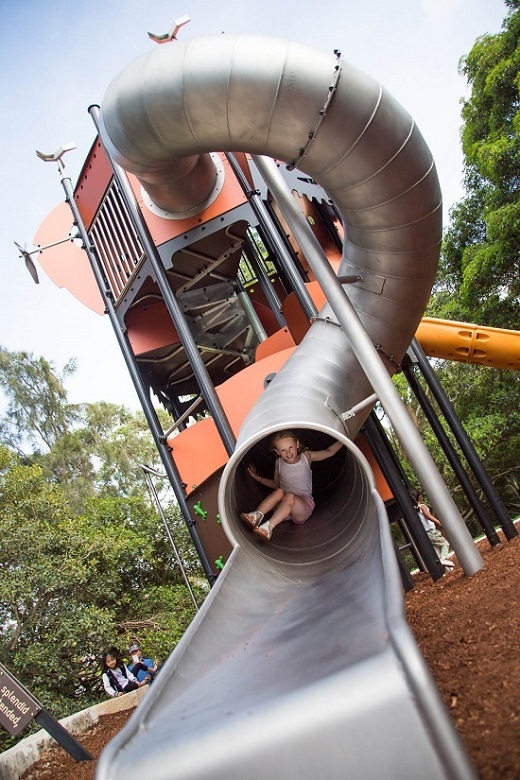 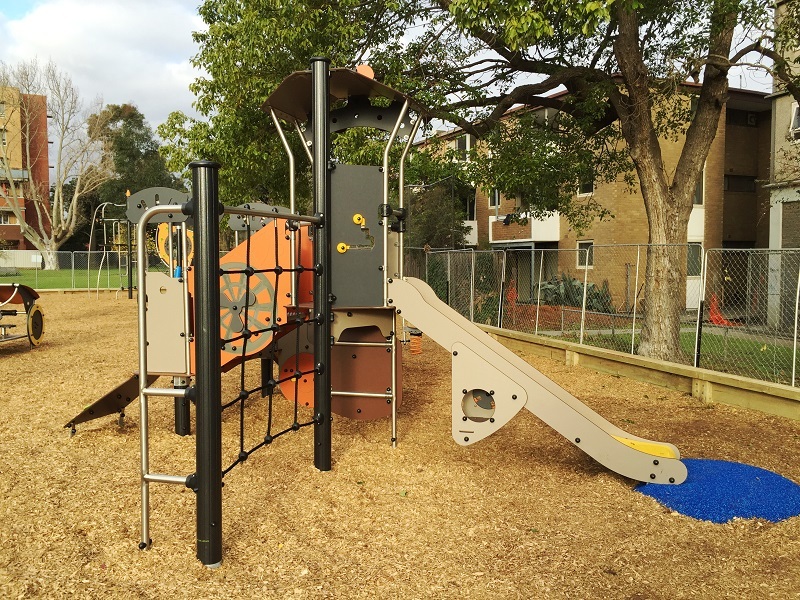 Proludic have provided an exciting custom-designed “Metropolis” play tower in the new inner city community park at Albert Sloss Reserve, Darlinghurst, for the City of Sydney. 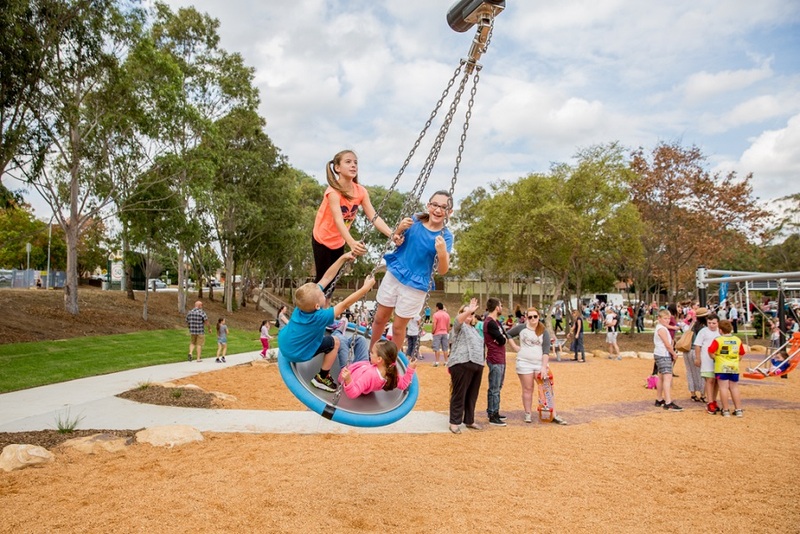 The park project was delivered in conjunction with the multi-million dollar upgrade of the East Sydney Community and Arts Centre. 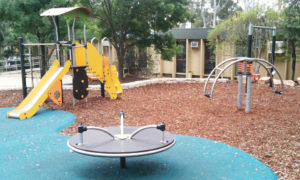 Click here to view the case study. 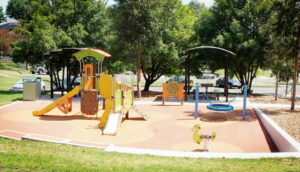 Location: Anzac Oval, Engadine NSW. 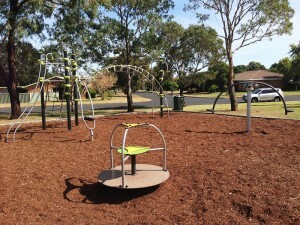 Location: Apex Park, Surfview Rd, Mona Vale, NSW. 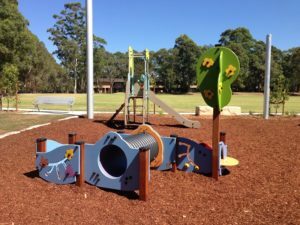 Asquith Park has something for everyone! 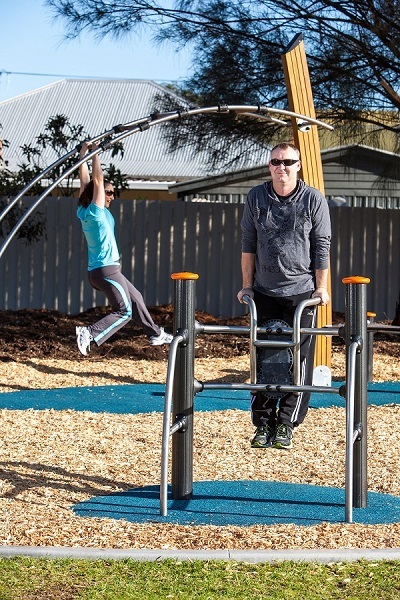 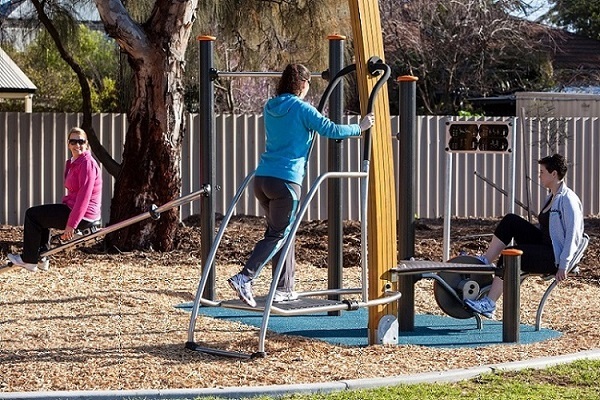 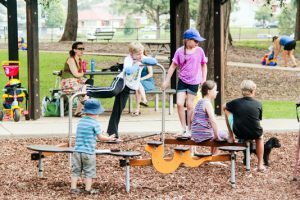 Hornsby Shire Council has provided a park that promotes active living to help support the health and happiness of the local community. 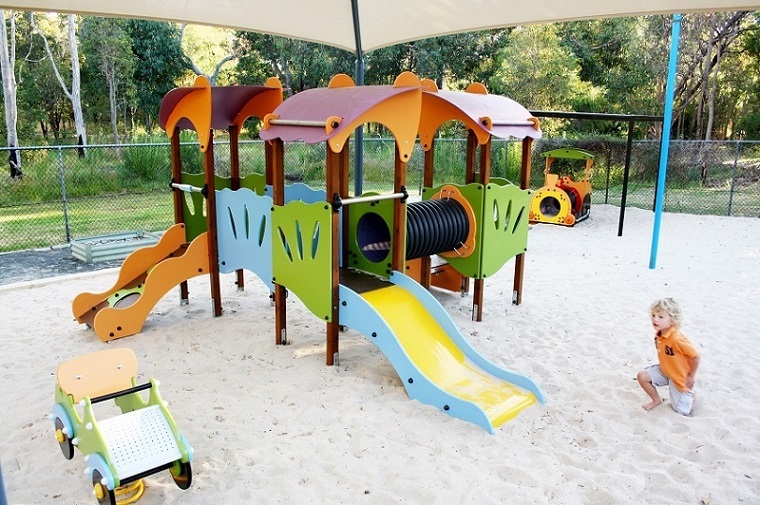 Inclusive items of play equipment are located adjacent to an inviting nature play area. 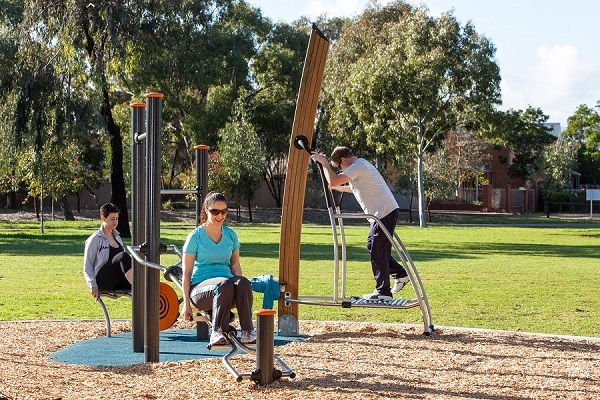 Exercise equipment, a ping pong table and 585 metre circuit track provide opportunities for healthy, physical activities, whilst the informal park setting enables relaxation. 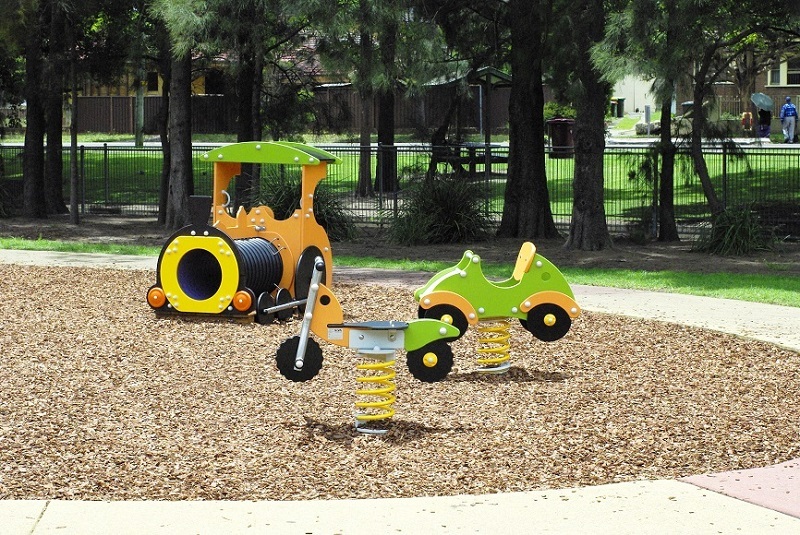 The playground at Auburn Park includes play equipment for both younger and older children. 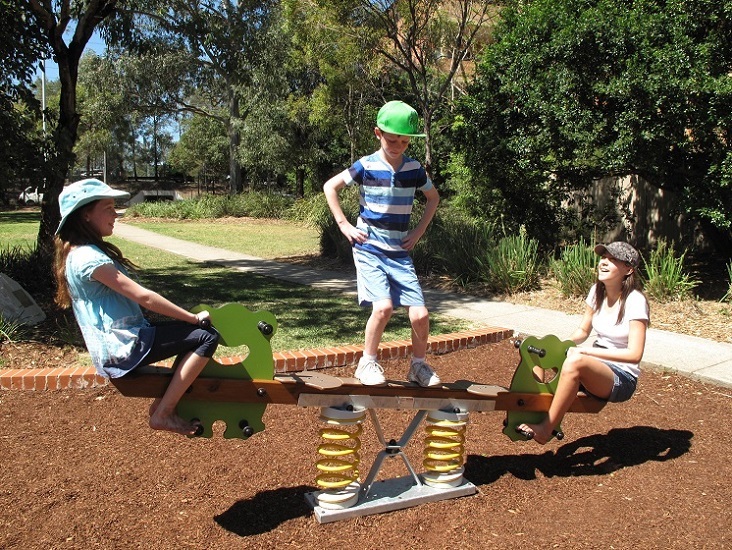 The Tema Metropolis themed Multi-Play and the Cosmocar Springer suitable for younger children encourage imaginative play whilst the Ixo Multi-Play and Hip Hop will get older children moving without them realising it! 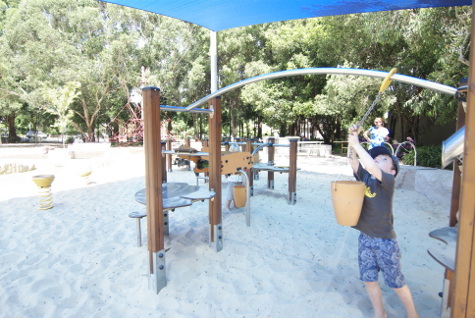 Other play equipment includes a Speed Gyro and a Double-Bay swing set. 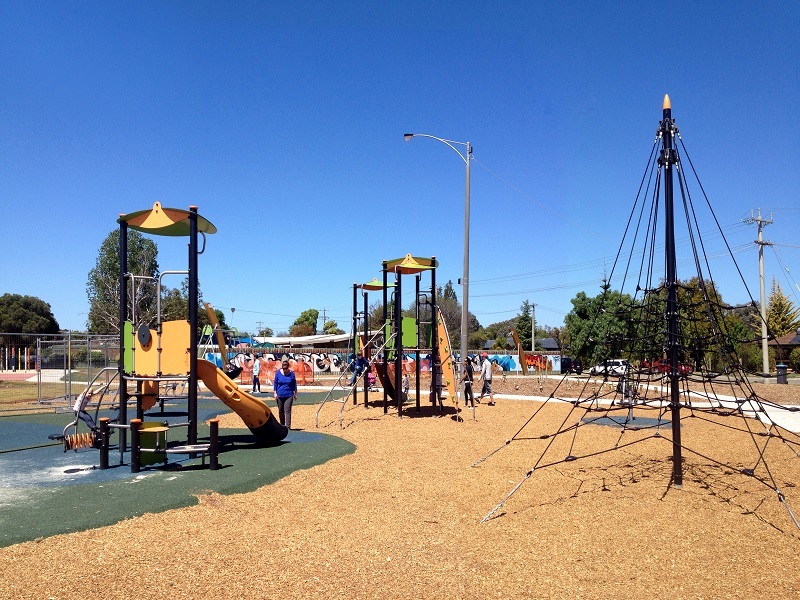 The old, outdated playground at Austin Park was replaced with an attractive all-ages playground. 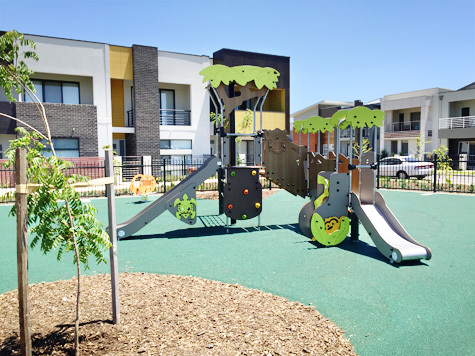 Although Austin Park is bordered by apartment blocks, it also features many mature trees which contribute to the attractive natural setting. 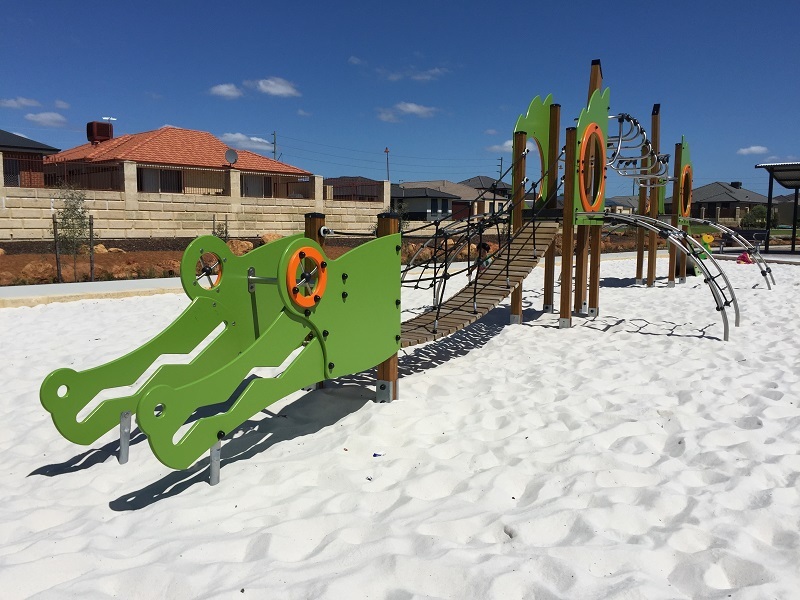 Council requested a nature themed playground, so we selected Proludic’s Kanope range as the feature item of this playground. 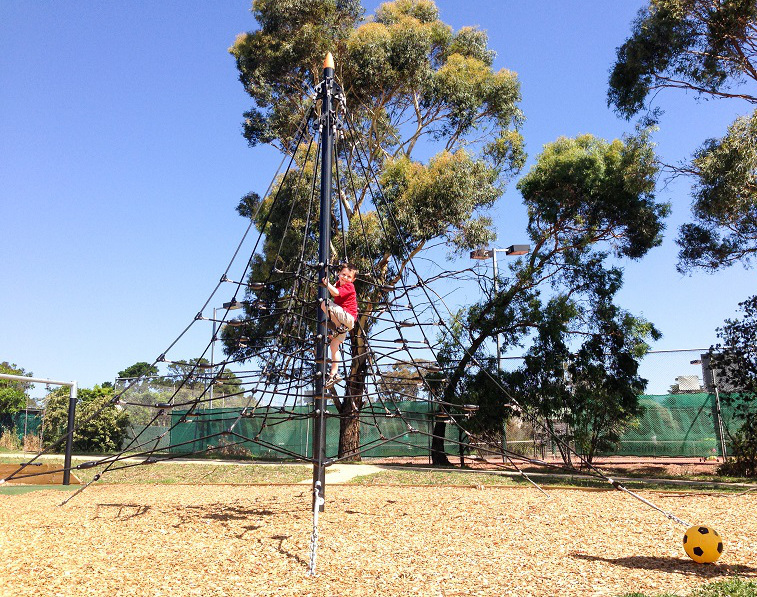 The play activities of Kanope are inspired by and reflect the experience of climbing a tree. An Aerospeed provides an exciting track ride for older children, and younger children have a choice of springers, Mini Slide and puzzle boards. 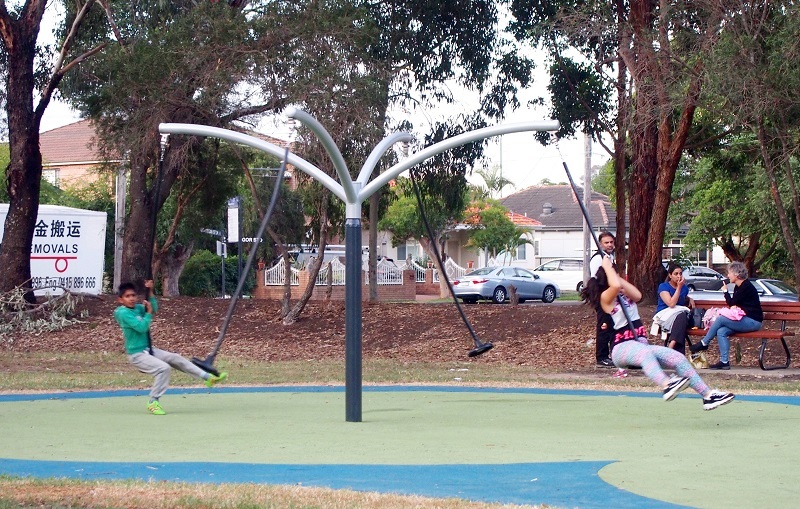 A Proludic Pod Swing offers an enjoyable swinging experience for groups of children. 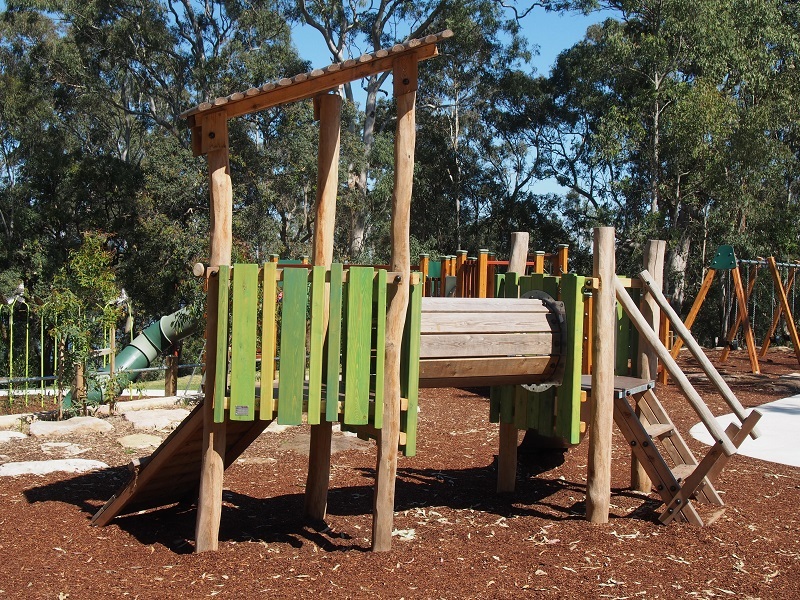 The laminated timber posts and beams of Kanope and the other items of Proludic play equipment compliment the wooded landscape character of the site. 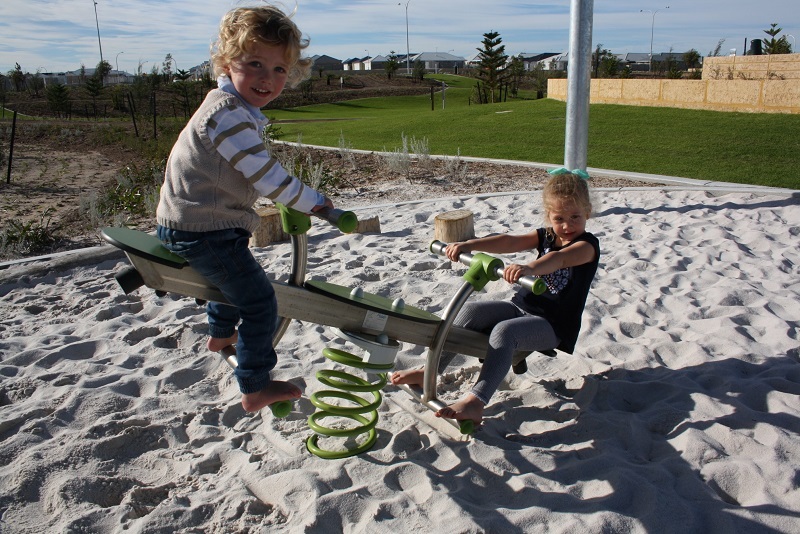 With all the new and exciting activities on offer, children now enjoy playing here for longer periods of time. 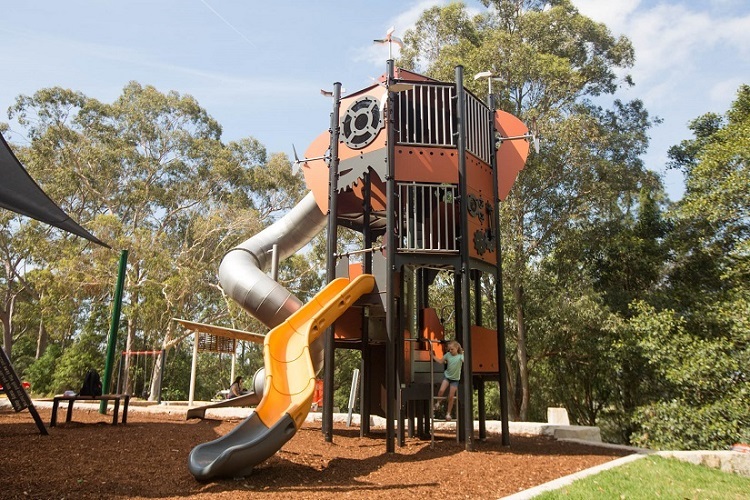 We are thrilled to present our Giant Metropolis Tower recently installed at Banjo Paterson Park, a beautiful spot along Parramatta River. 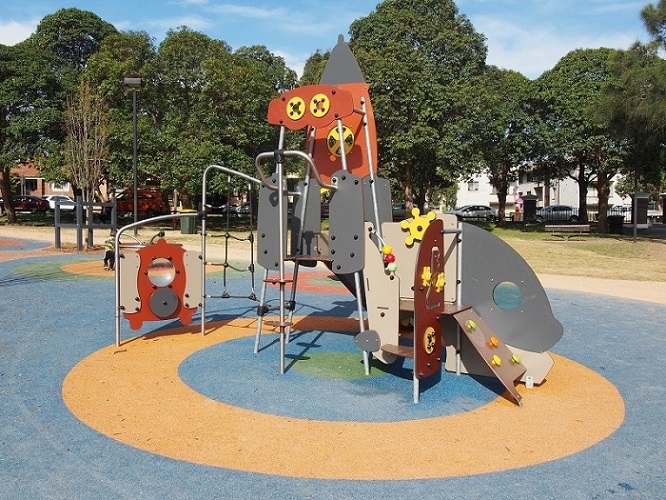 The City of Ryde wanted to provide a Climbing Tower Play item with the theme of an oil factory in connection with the historical background of the site used for the Halmeg linseed oil factory. 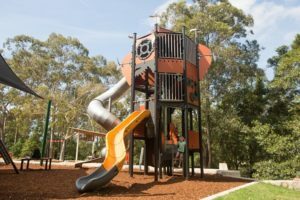 Proludic’s Metropolis themed Tower, with its copper coloured panels and mechanical elements of a bygone age was a perfect match and was selected by the City to feature in Banjo Paterson Park –> Click here to view the full case study.